We believe and we trust. And we know God‘s Word is truth and once he starts something he completes it. He is a God of perfect timing and is never late. Thank you Lord for teaching us as we go; thank you Mother Mary and Saint Andrew for the prayers answered - Thank you for your intercession. all the time – emotionally, physically, mentally and spiritually. Living a Christian life is difficult. It’s more than praising and going to mass, which is so important. Our flesh takes us sometimes to journeys we shouldn’t be taking. Our focus should be God so not to fall into temptation but it all goes back to the free will. And prayer is what sustains, guides and connects us to the space where you meet God. We went to see Dr. Ellen whom Dr. Langford recommended we consult on the right arm and he said the x-ray showed there was no calcification and encouraged us to continue to work at it because, there had been progress from the prior year. That confirmed what Paul at CORE had said about David showing advancement every week and had not stop getting better. Progress continued. David’s Neurologist, Dr. Nieves began a series of neurotoxin Myobloc injections to treat the spasticity in David’s right arm. We would monitor any progress and assess if it would be effective. David was now reaching things by moving his trunk, which was something new. He was moving his legs out of the car and he walked on his own with both feet in the aquatic pool. He also held himself up with his right hand on my back and cleared his throat for the first time. David added many more new routines: turned off his room lights, locked the laundry door as we passed by, piled up the dirty plates after a meal, and folded the bathroom hand towel nice and neat. He also reached to the floor and bended forward. 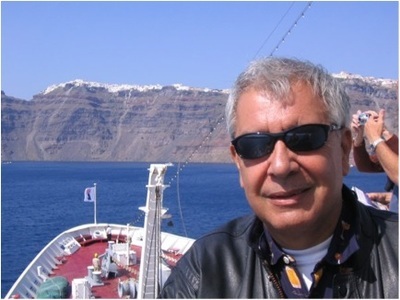 He became more conscious of his finances and his sense of humor continued to flourish. We continued our ministry of service at the Saints Peter and Paul Gift Shop, and we got to meet many wonderful people, hear so many great stories of miracles and received many prayer requests. We felt so blessed in this mission of love. We talked about the power in service. If the service is good, it brings life to others while it nourishes the giver. We met this lady at UCF who explained how her brother had never been able to speak since he was little and had never received therapy. 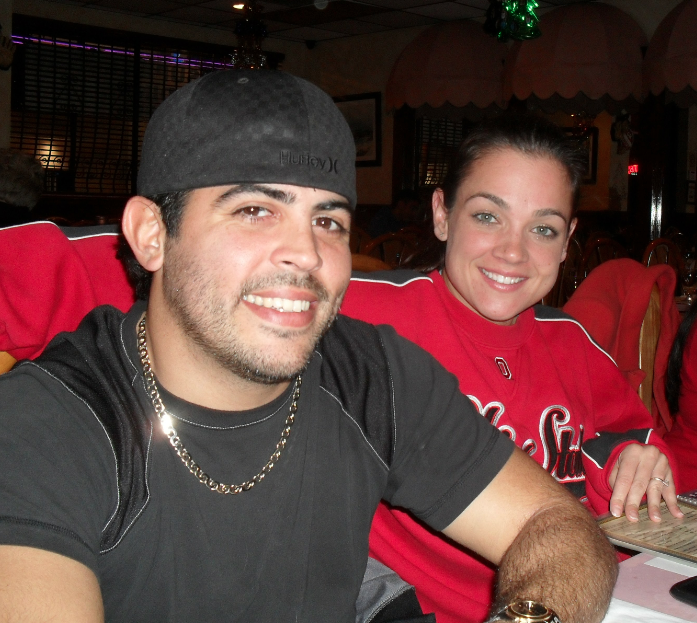 She was grateful he was finally taking therapy at UCF. The joy in her eyes revealed a deep love for him. Being a mature woman, I asked how old her little brother was to what she said he was 59 years old. I thought how our service of love starts at home. The Lord wants things done through us. When we disconnect ourselves from people’s lives, we desensitize ourselves from other people’s pain. When we put things in God’s hands we allow him to accomplish His divine plan. He invites us to participate in this plan. It’s up to us to accept or not. We choose to be in his plan or stand alone or against it. We went to David’s close and dear friend Chris S. wedding and it was wonderful for David to share with old school and church friends. 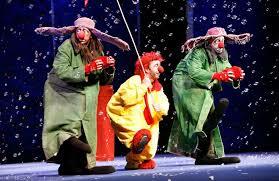 Eddy, Mel, David and I had a great time at Dr. Phillips Arts Center at the clown Slava Snow Show. Miss Angie from bible study was very serious about David’s recovery. She would bring him snacks, cookies or chocolate every week. As we were leaving Aquatic therapy one afternoon, I read the email about Miss Angie passing and told David that she was on her way home. David pointed to heaven. At that moment, we were in shock and amazed to see the sky with a bright opening - as if it was receiving Miss Angie. As we lifted up a prayer we contemplated how creation always speak to us of God‘s amazing love for us. We celebrated a funeral mass and thanked God for having the opportunity of meeting her. God is a God of the living, so when we die, we are on our way home. Those who precede us can now pray for us in a different light. We believe. Such great hope and joy. 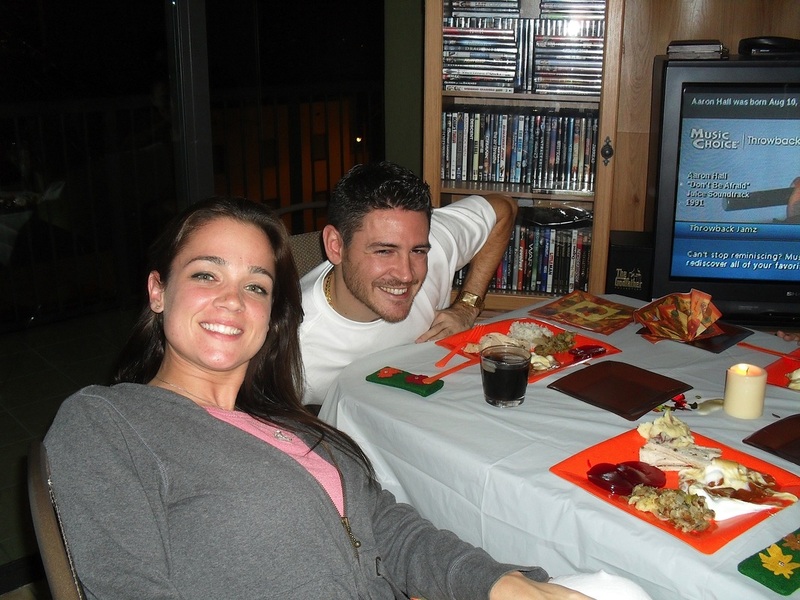 My sister Lucy came to visit us & we had such a great time watching movies and cooking. My daughter’s second son, Jorge Steven was born on June 3rd with a congenital heart defect called Stenosis Bicuspid Aortic Valve where two cusps grow instead of the normal three and makes the heart work harder to pump blood to the restricted opening. Surgery would need to be performed as soon as the baby would gain more weight. 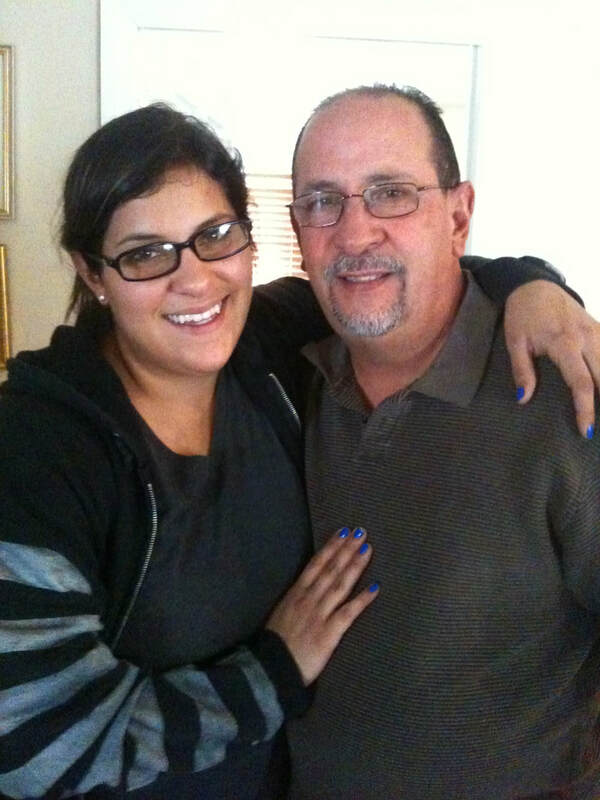 My daughter Ana Carolina and Steven’s pain brought all the thoughts regarding the sufferings from David’s accident. All prayer warriors continuously prayed for the baby and for them. The new appointed priest to Sts. Peter and Paul Church, Father Alvaro had been sent to the hospital to see him in the Newborn Intensive Care. This would be his first mission in our Parish. He baptized him at the hospital and called him a miracle baby because of how he gasped for air and made gestures as Father prayed for him. 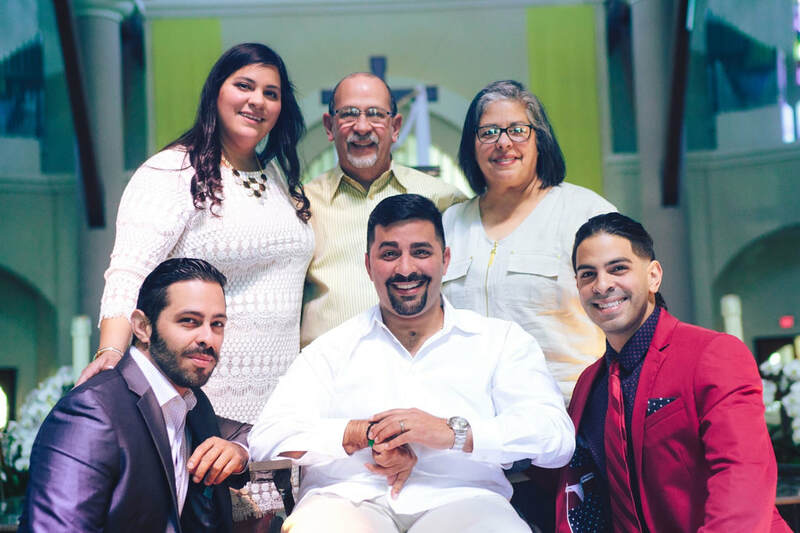 As David and I were working at the church’s gift shop one afternoon, Deacon Scott came over and with tears in his eyes told the story about the day that Ana Carolina and Steven left the hospital and came to the chapel with their newborn Jorge Steven. He saw that they were kneeled in front of Jesus and had placed the baby on the tabernacle table as an active consecration. He felt moved to pray over Jorge Steven. That day the church celebrated the feast of the Sacred Heart of Jesus. This feast is celebrated 19 days after Pentecost Sunday and falls on different dates every year. To our astonishment, the feast for the following year would fall on Jorge Steven’s birthday - June 3rd. God truly speaks to us constantly but we have to pay attention. This was no ordinary event and a special blessing was given to them on that day. At the post surgery check up, the doctors were amazed of how great his heart was functioning. They mentioned that his case was the most difficult they had to work on and the best outcome of all. We celebrated and thanked God for that miracle. 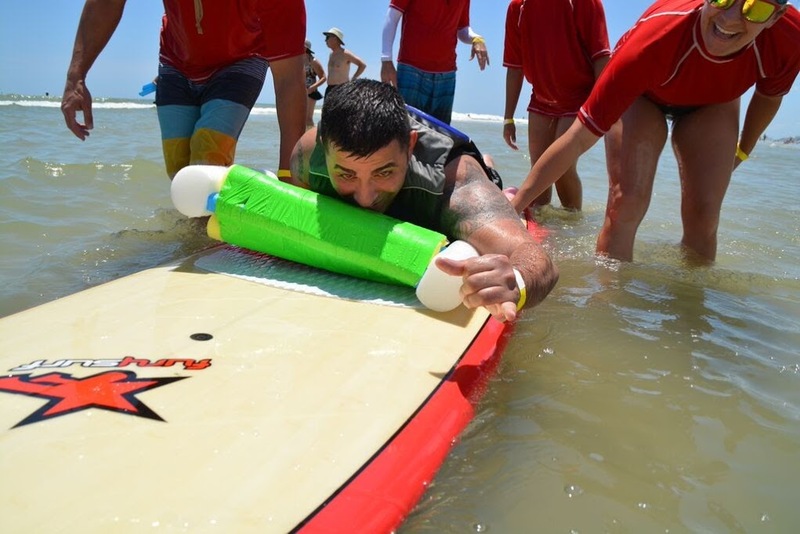 On Sunday, June 26, 2015 we joined Oceans of Hope and CORE at New Smyrna beach for a surfing day. 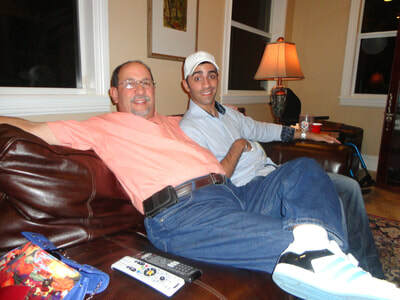 My sister Noemy and brother in law Hector invited David and I for the month of August at their home in Ohio once again. The time there was a blessing. 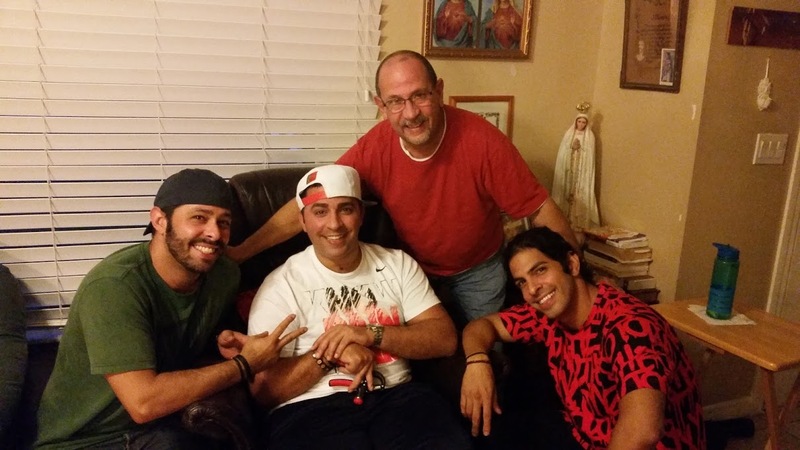 Alex Javier visited and we had a great time together. At St. Roberts and William Church, David was prayed over by the healing ministry. We attended a retreat in Michigan coordinated by my mother titled “Activate, Mobilize, Witness”. The spiritual insight by both Bishop Sam from Louisiana and Father Francis from Omaha gave us the opportunity for introspection and more transformation. October was filled with visits and sharing with family and friends. My sister Lucy, brother Carlos, and sister in law Haydee came to visit. 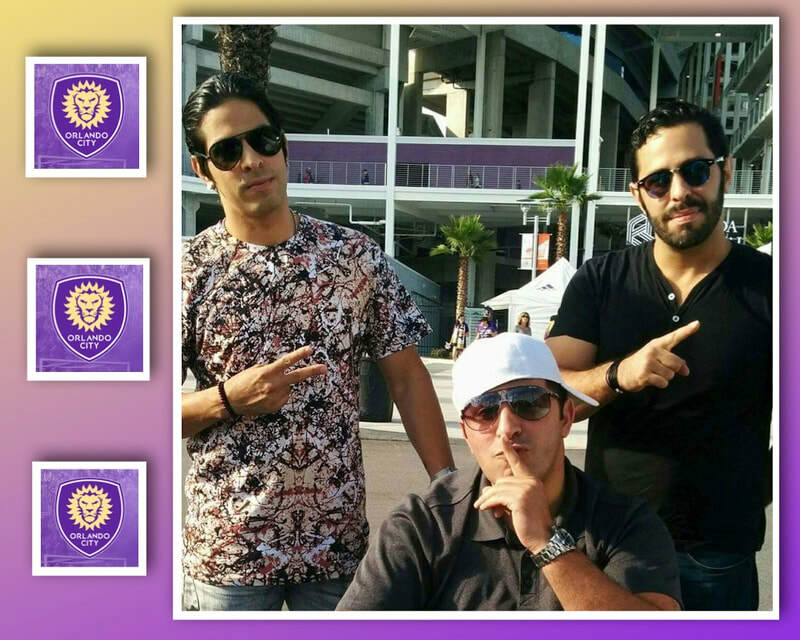 David surprised his brothers and bought three tickets to see the Orlando Lions soccer team and invited Fernando and Eddy. They had a blast. Before the accident, David used his ability of expression to always have a kind word, to encourage people, motivate friends and loved ones to reach higher and dig deeper. Family and friends called him the Motivator. After a speech therapy session at UCF we were informed that David’s “Apraxia” would not allow him to speak ever. As we listened to the UCF specialist, David reflected such a peaceful look in his face as if he knew something I didn’t. At that moment David’s peace gifted me with tranquility. For an instant I was transported to the time at Miami JM Hospital when I desperately tried to convince the Psychologist that David would advance from his condition. Despite of the new report at UCF, David kept smiling assuring me that all would be ok. That evening, I explained it to the rest of the family and they all had just encouraging words and reaffirmed that only God would determine how David’s future would look like. 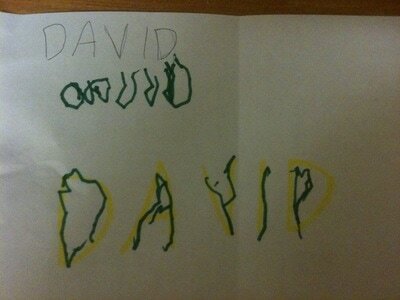 Whether he would ever speak again or not, David found the richness within to express himself to others without words. On October 30th we went on a “Pilgrimage of Mercy” to the Mary Queen of the Universe Shrine to see the relics exhibition and the incorrupt body of Saint Maria Goretti from Italy. God’s presence was surely there. Fernando, Ana Carolina, Steven, Jawad and Jorge Steven, Gaby, David and I were very touched and reflected on the marvelous role of the Saints in our lives. While praying I felt that I needed to continue the path I was on with David because I was where the Lord wanted me to be and not to be afraid. November was filled with fun as well. We went to the Orlando Repertory Theater with my sister Lucy to see “Orphie and the Book of Heroes”. 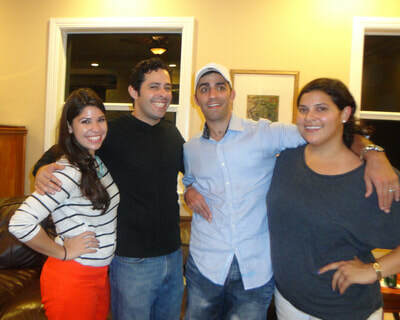 Cousin Christina came to visit from Miami and we had a great time with her. She mentioned how David’s accident gave them a different perspective of life. We went to a hockey game with the CORE team. That year we attended the Sts Peter & Paul Church Christmas party with my mother and continued to lift prayers of thanksgiving for a year of hope and blessings. Many times I considered going to work part time but the doors would not open. I knew I had to place everything in God’s hands and trust in Mary’s intercession. One time I set up a payment on automatic withdraw by mistake. 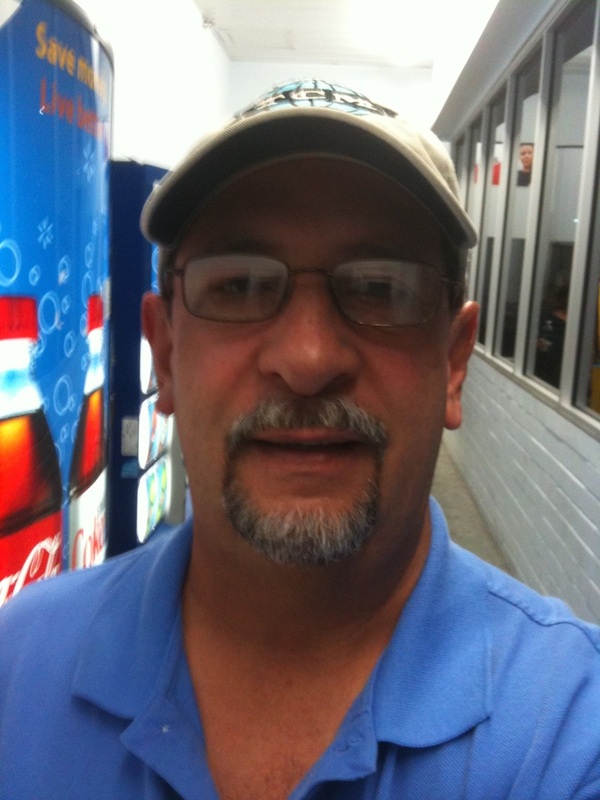 The day I had to make the payment, I received a check from a high school friend in Puerto Rico, whom I had not spoken or seen in over 35 years. How could she know? God was moving the hearts of family and friends, whether they knew it or not, because the help always came at the right time. It was a collective effort that came together so that I could remain at David’s side. This confirmed that I was where I needed to be. There is a blessing in giving. But, through this journey, I have discovered there is also a blessing in receiving. Sometimes pride gets in the way of allowing the flow of love happen because of our prejudices and our concepts of grandeur which many times provoke a need to promote or exaggerate our giving. I recall in middle school how I wondered why Jesus didn’t eradicate poverty when He was on earth. 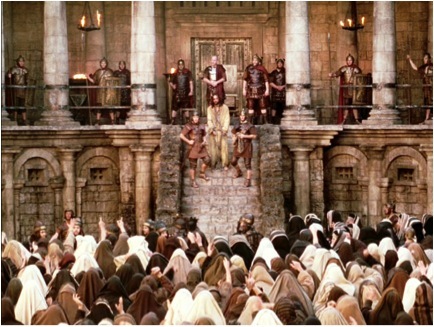 He in fact told Judas “you always have the poor with you…” (John12:8). We are called to share, to provide the knowledge, the resources and make changes in our world together. But we become busy building our lives with little or no time to look around to those in need. Our self-centered condition, our fears, our lack of generosity and with our lack of action, we convince ourselves that “others” will take care of this and that. And we remove ourselves from that reality. It is the poor and the less unfortunate, which provoke a thought in us. And that thought turns into compassion or inspiration. It is through them that the Lord moves hearts. As it becomes a joyful experience to be at the giving end we must embrace when we are at the receiving end because, we are the channel or instrument for the other to give. To give a flower, a smile, financial support, a hug, time, a prayer. Receiving helps us to see the hand of God in action. The key lies in how we respond to the movement of the Holy Spirit. God continued to reveal himself in so many ways. Every time we passed by a cemetery, David would start praying for the souls. He would make the sign of the cross and pray every time we would pass by the places my father enjoyed going to. We learned how offering our sufferings in prayer - we contribute to the redemption of souls in purgatory and do more this way than going on missions. “As a family, we pray for one another and those faithfully departed who are not quite in heaven need our prayers. Just as we have witness or experience answers to our prayers, those prayers for the souls in purgatory will also be answered” St. John Chrysostom. Praying for the souls in purgatory became a personal mission for David. 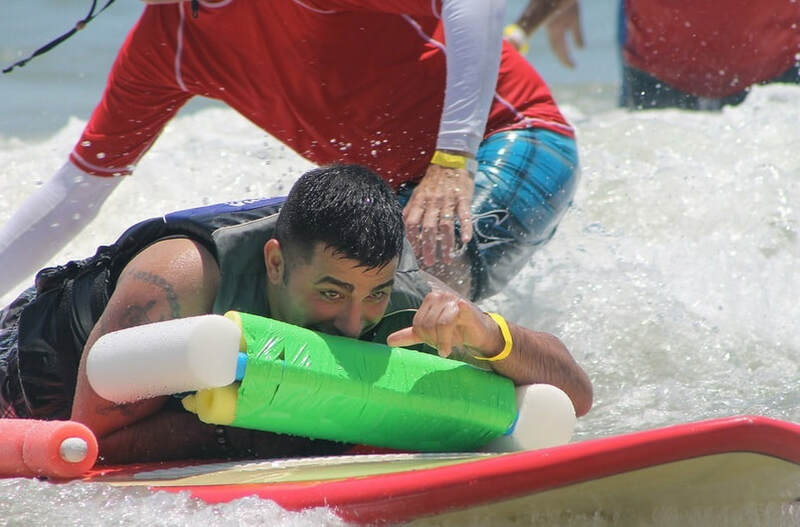 In May, the second Invictus Games, an international sporting event for injured servicemen and women, took place at the ESPN Wide World of Sports complex. 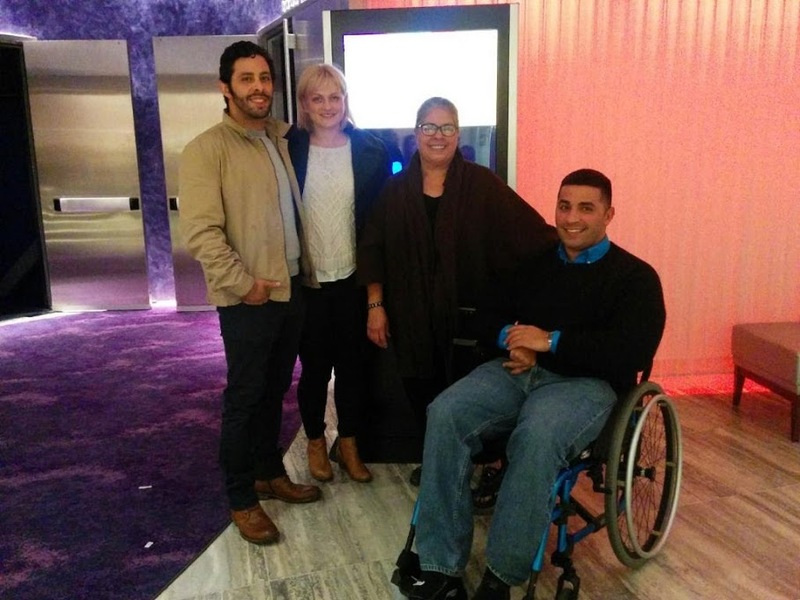 Jorge had the opportunity to gift us tickets to the opening ceremony where Prince Harry, Patron of the Invictus Games Foundation, First Lady Michelle Obama, President George W. Bush, Actor Morgan Freeman, special guests and artists honored athletes from around the world who inspired thousands with their post injury fighting spirit. It was an honor to be part of this experience and touched David’s soul in a very special way. One of my favorite hobbies has always been gardening which I had not done any since David’s accident. Responding to a message I had posted in our neighborhood network, an old friend from where I used to work, messaged me that she had some plants for me. Without her knowing, one of the trees she brought had been on my wish list for years. When Lindsey asked David where he wanted the tree, I realize how we were planting new life on the anniversary date of David coming out of the comma 4 years prior. What a sign! David and I left to Ohio for our traditional vacation on August 11th. We went to see Footloose the musical that was amazing. The highlight of this trip was a special visit from Ashley Vargo, who had studied with David at Madonna High School in West Virginia and shared fun memories. 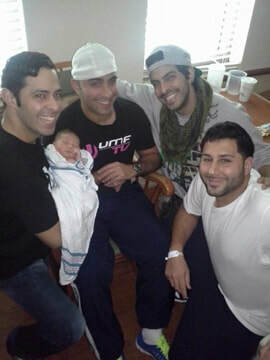 David was deeply touched by his sister Ana Carolina and Steven who asked him to be Jorge Steven’s godfather. 2016 was marked with lots of workouts and therapies. The Ablaze Group at Sts. Peter & Paul and the UCF Friday Only Club became a favorite group of friends which David enjoyed sharing time, outings and experiences every week. On Saturday, September 17th David and Fernando attended the Charismatic conference in Orlando and were reunited with Bishop Sam whom they had met at the retreat in Michigan the prior year. We walked through the Door of Mercy for the Jubilee year and year of mercy on Wednesday, October 26th. 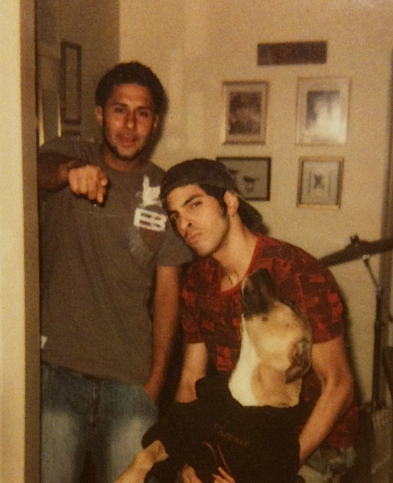 On October 31st, Eddy told me their dear and close brother-friend Brandon had passed away. Around 4:00 am I dropped off Fernando to the airport to go for a mission trip to the Dominican Republic and told him about Brandon’s passing. He was devastated. On my way home, I prayed that I would find the right time and words to tell David. When David woke up I got him ready and after breakfast I told him what had happened. He immediately started to pray and then he began to cry. It was so surreal. Brandon at the Appalachian Mountains. A few years prior, Brandon had decided to make a backpack trail hiking trip. He told us he would go and search for God. We sent him off with a book to meditate and a prayer. 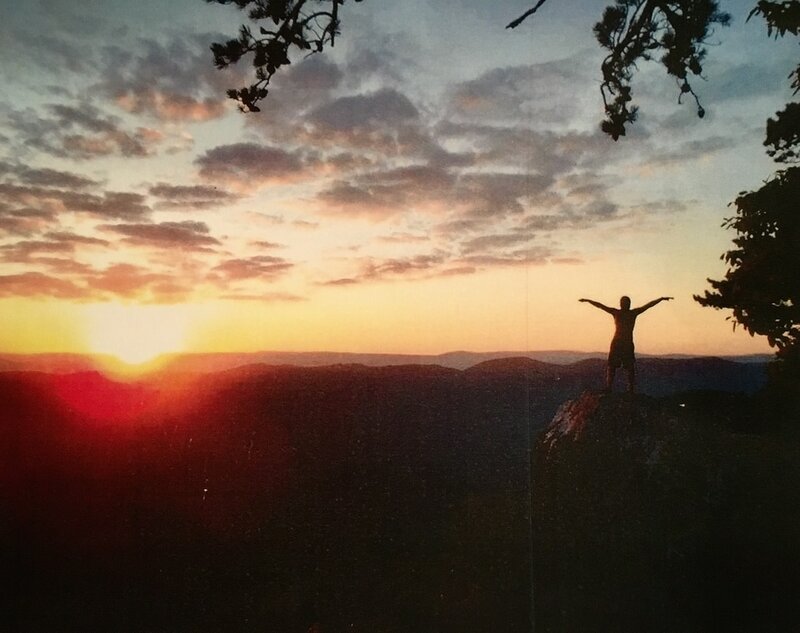 When he came back from the trip, he shared a picture of himself on the top of the Appalachian Mountains overseeing the hills surrounded by a majestic view. With a true ecstasy he professed he had found God. At that very moment on top of that hill he breathed in His existence as he stretched his arms to take in the experience of getting in touch with God. He mentioned he could not believe how anyone facing all this beauty could doubt that God existed. His conviction was real. Brandon had experienced how much he was loved. We were renewed by his conviction and rejoiced together. Brandon’s mother Pat came home on November 2nd and we spent time together talking about Brandon and the special bond that tied us to him. Eddy worked on the video for the service as a celebration of his life with many wonderful and special memories. Now Brandon would pray for us. We couldn’t help but tried to capture the joy of celebrating life every day with special visits, family and friends. Christmas was filled with special moments with family and friends. 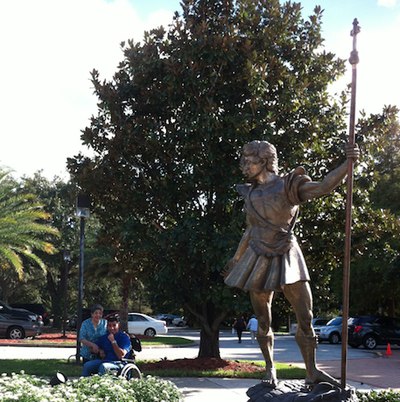 David and Fernando in front of the lake at Rollins College in Winter Park. 2013 and 2014 were years full of prayers and support. 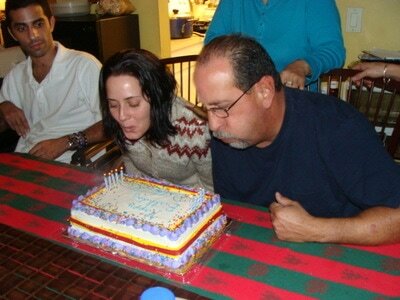 David had many milestones in every therapy and we celebrated each one of them. We would not take anything for granted. We learned that we had a responsibility to pray for family, friends, and all who came into our lives. We had the opportunity to make a difference in peoples’ lives through prayer. We understood that prayer works like a garden fork that removes the weeds and roots, which blur our understanding of God’s love. We pray in preparation for the moment where the free will is able to choose with an open heart. Some need many years of prayer because the roots are embedded deeply into their lives. These roots can be weakened with constant prayer - allowing a full relationship with God. Saint Monica of Hippo always comes to mind whose 45 years of prayers liberated her son St. Augustine from strongholds and allowed him to freely choose his vocation. David began pointing constantly to heaven for every meal, every person, every plan, every event, and every struggle and blessing. We were on our way to truly learn how to trust and patiently wait for the right time for everything we would be confronted and blessed with. It was never wasted time because through it - we became aware of our deep selves and everything around us. Several years prior to his accident, David had shared his admiration for Matthew Kelly and about his teachings. (https://dynamiccatholic.com/matthew-kelly) To my surprise, Kelly was coming to Central Florida and David was very excited to attend his talk, “Living every day with Passion and Purpose”. At the entrance of the church, there were two baskets filled with names of all the priests of the Diocese of Orlando. The staff asked that all who were attending Kelly’s talk would pick a name from one of two baskets and to pray for the selected priest the entire year. The name of our priest was Father Tuttle, for whom we began praying that same day. 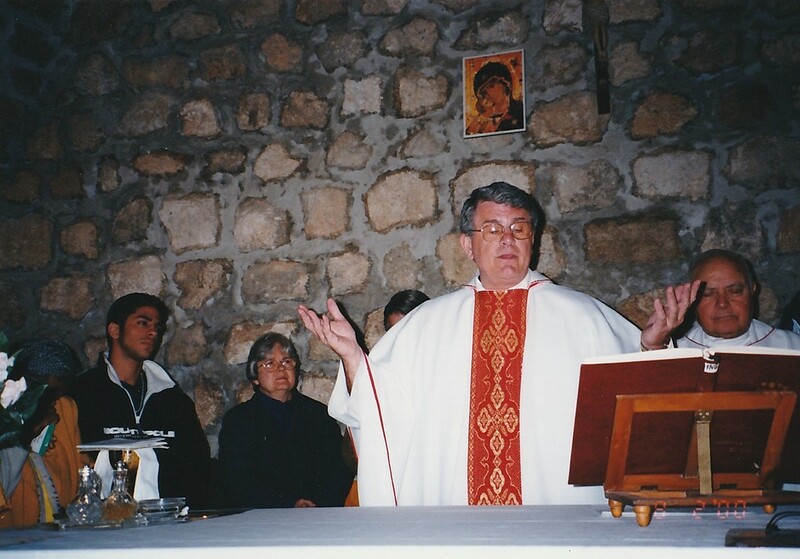 When I shared the experience with my mother she was surprised to learn the name I had picked out of the over 200 names and wondered if it could be the same priest who had accompanied her and David as part of the Steubenville group, which traveled to Jerusalem in 2000. 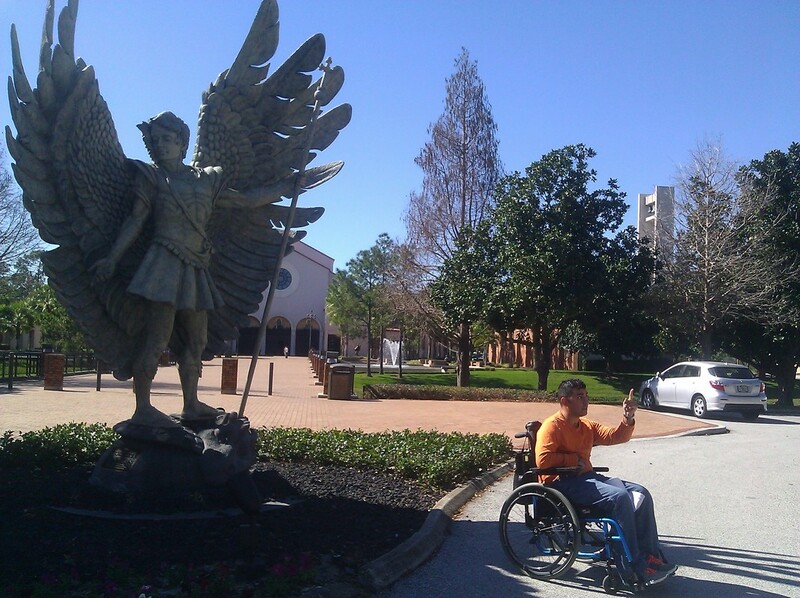 Eight months later as we attended the blessing of the St. Michael the Archangel statue at the Shrine basilica Mary Queen of the Universe, we saw Father Tuttle concelebrating mass. As my mother introduced me to him, Fr. Tuttle could not get over the fact that David, my mother and him were together after so many years. He repeatedly mentioned that it was a sign that his name was whom we were entrusted with to pray for. 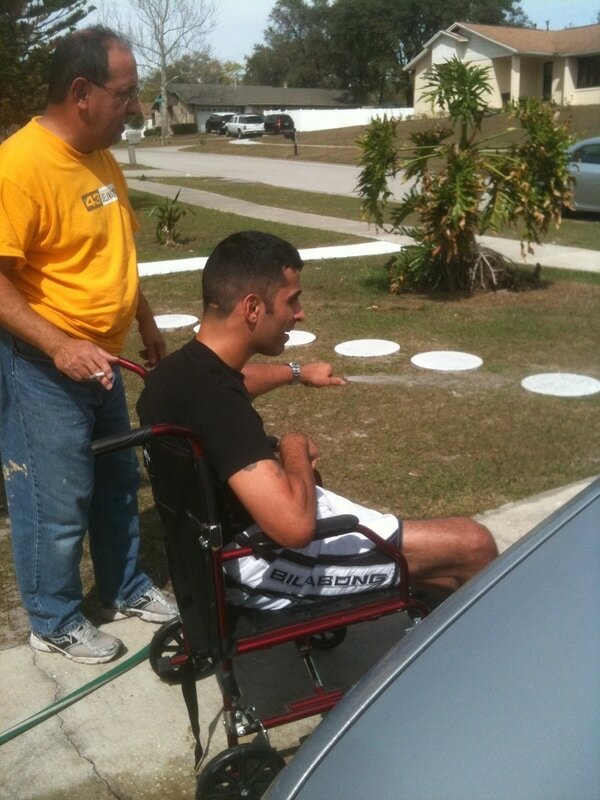 He went to explain that he had moved to Florida and that for 3 years he couldn’t walk. He said that it was obvious he was getting better by our prayers. New therapies and exercises were introduced and David worked out once or twice a day – Monday thru Friday with personal trainer Gretchen C. at the WS Civic Center pool & gym, with Eric at ProForm, Richard at Performance Rehab, CORA at University with Jordan, Fl. Hospital’s Sports Med Rehab/Hope Clinic, UCF and at CORE in Longwood. 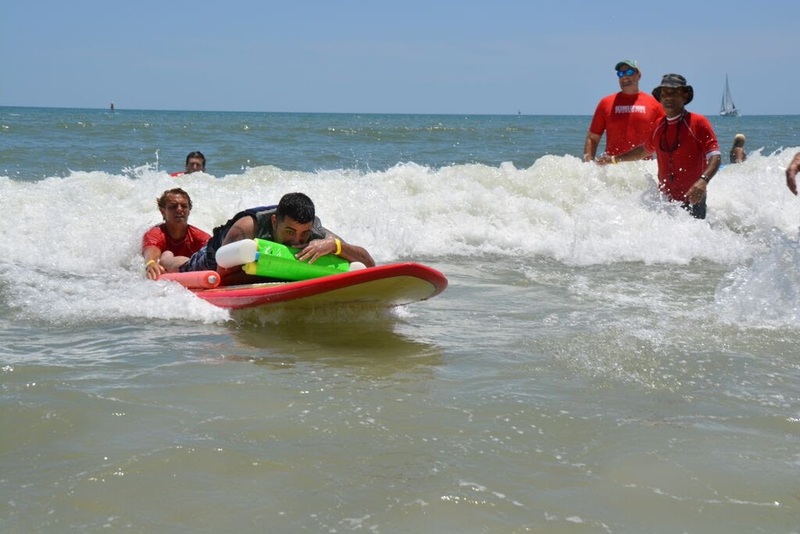 At therapy, David was kneeled for the first time since 2011, he learned how to roll over, winked, snapped his fingers, submerged under water at the pool, and stepped with his right leg bending the knee. He began moving his left shoulder and lifted his right knee by himself after 3 years. After 2 years of praying for each other’s family, we met Jacob’s grandparents Al and Aggie who were in Central Florida for a convention. It was amazing to feel so connected to them and realized the deep effect that prayer has in us. We had many special moments with family and friends and met some amazing new people that year such as Jennifer F, Lorenzo & Lynette and Olivia at HOBT. We created very special moments with family that visited and shared their joy. In 2013, Eddy arranged for David and I to attend “Ultra Music Festival”. David had been a promoter of the event and was looking forward to seeing old friends. Eddy came to meet us and took us to the closed section in front of the bay. Many friends came to see David and it became very emotional for everyone. We traveled to South Florida a few times. 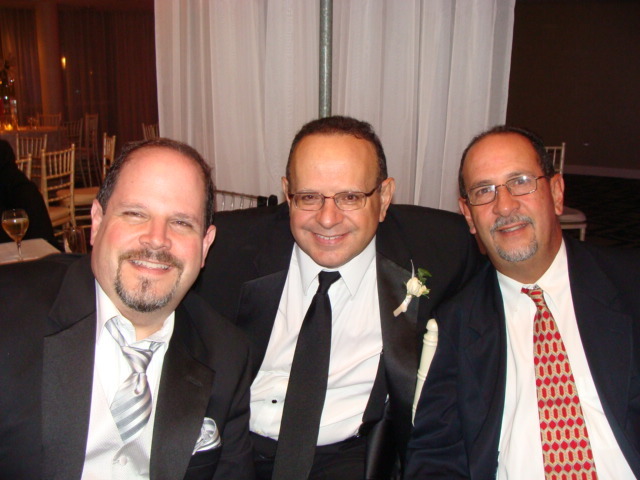 At my father’s burial, David was able to have closure and mourn his loss. We attended a healing retreat at Clearwater and Sister Briege Mckenna who directed the retreat, encouraged David to continue working hard. Had a great time at Ryan and Ashley’s wedding in South Florida and spent a wonderful afternoon in Tampa with uncles Joselo, Mireya, Marie and Rene. 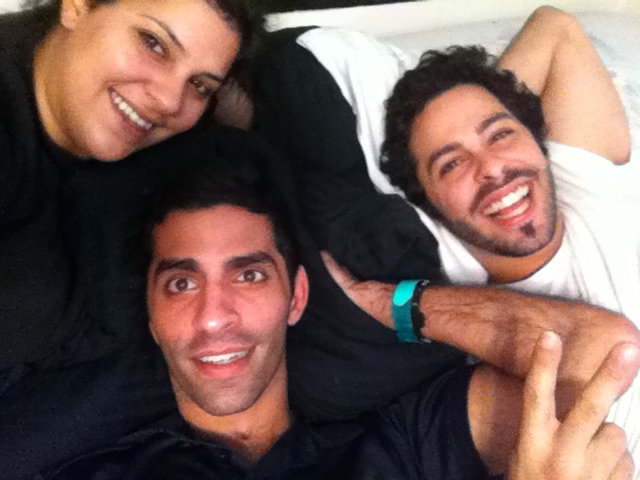 My sister Noemy and brother in law Hector invited us to spend summer with them in Ohio. 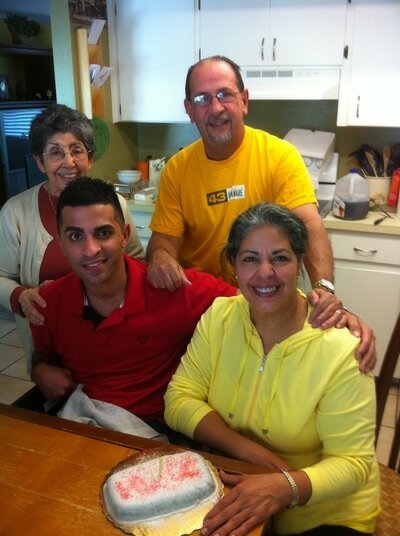 We were to surprise mom and celebrate her 80th birthday in Michigan. It would be the first time flying for David. His doctor approved for David to fly and had the most amazing time with family. There were many special events, which filled our lives with hope and joy. “Stay the course, don’t let your guard down, persevere”. For the first time, we participated in the Susan Koman 5K walk. At the finish line, his personal trainer Gretchen C. stood David up and little by little he made several steps. The crowd was applauding and Telemundo TV aired the emotional moment. 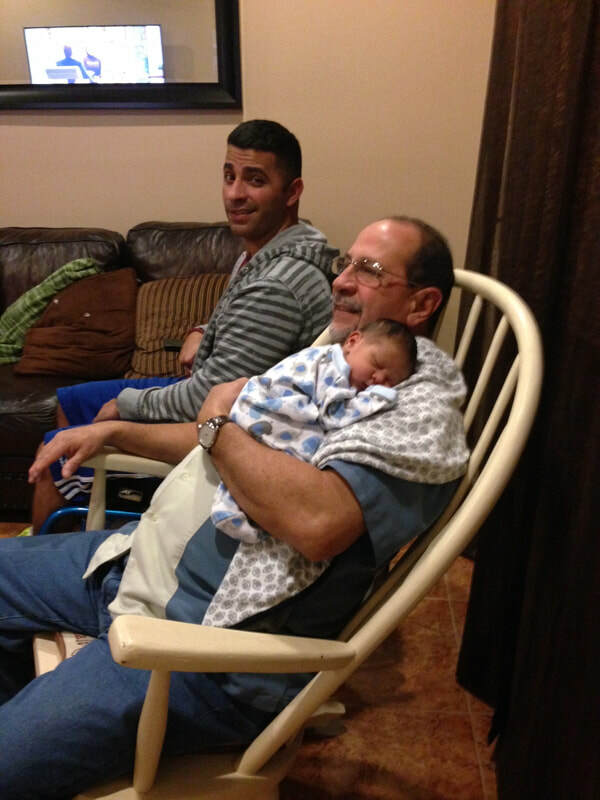 My first grandson Jawad was born in January 2014, which gave all of us a new understanding of God’s love. 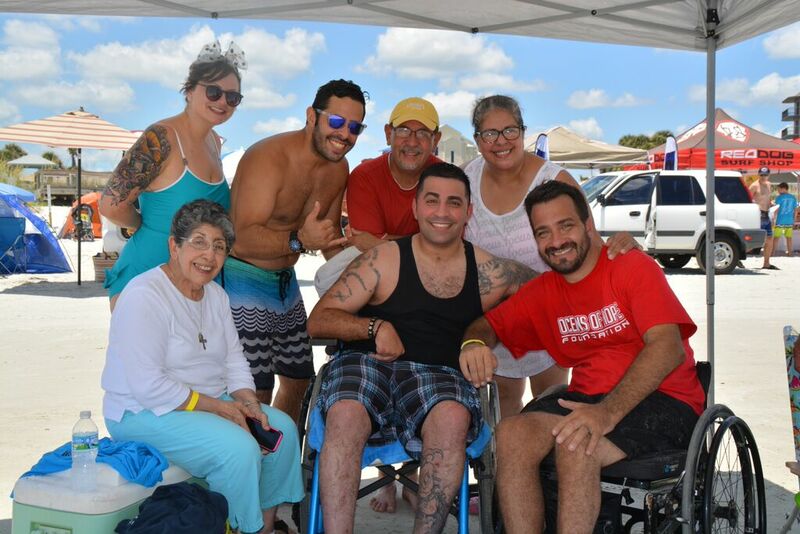 David wished to reminisce and celebrated his 31st birthday at Semoran Skateway and had a fun time with family and friends. He also wanted to go to a football game at his high school and was able to see the - back then head coach, Mike Bisceglia. At Sts. Peter & Paul Church, Steven, Fernando and David participated in the CRHP retreat and the men mentioned that they had never pointed to heaven as much as they did with David. Later Steven and David became part of the formation team sharing their journey and witnessing for the new retreaters. David formed part of the young adult Ablaze community. We volunteered to manage the Parish’s Gift Shop. Paula W. from the Faith Formation ministry, asked David to talk to the 30 young - 8th graders signed up for Confirmation. This would be the first time David would use his speech device. We shared about our mission, the Saints, Mary and opening their hearts to the works and gifts of the Holy Spirit. During this time, we learned how we should never refuse hope and love to anyone. We learned how hatred corrodes us and how it prevents us from letting the innocent love of a child in us bring hope to others. We learned how love and hatred are constantly wrestling for the same space just as the inner struggle between life and death, hope and despair. We became aware of how becoming self-centered influences our decisions and can be the ground for evil to gain territory instead of allowing love to blossom even in the most difficult life situations. We learned that when God begins something, He brings it to completion. That God continues to heal but that we need to reflect if we want to be well and is we want to be whole? If so, then we need to desire it and consent to it. We prayed that we would not be disabled by pride, arrogance, envy, hatred or ignorance. At the end the year we met Fr. 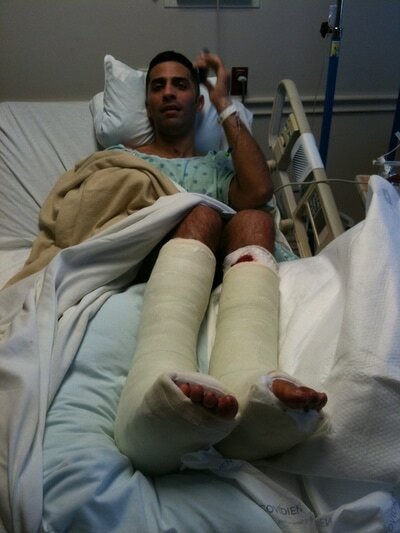 Joseph Maniyangat at St. Catherine of Siena Catholic Church in Orange Park, Florida who had a life after death experience from a motorcycle accident in India. Through his Eucharistic-healing ministry many people have been healed physically, spiritually, mentally and emotionally. In front of the tabernacle, Father Maniyangat did a healing prayer for David. (www.frmaniyangathealingministry.com). “When we have an open heart, we begin to see and understand God’s love every day. There is power in prayer and it’s our best gift of love to others”. There was always something or someone to give thanks to God for. We were paying attention to the wonders happening around us. Even when it felt too heavy to carry on, our spirits were lifted up constantly by an event or a smile, by a memory or a word of hope, by someone else' story or a prayer. I recalled an evening when I felt very overwhelmed. I grabbed the bible from the table and rushed outside to sit at the front porch bench. I didn’t want anyone to see me crying. I had to remain strong. Sighing - I repeated several times that I needed Him to speak to me. God was too silent and I just needed to hear from Him. Anything. I needed Him now. Then I opened the bible randomly to any page. As I was getting ready to read I thought of the many times I had explained to others that we can’t just expect to randomly open the bible as if it’s magic to look for God to speak to us. That’s just not how it works. Well, at this moment I was going to try anything. As I read the gospel of John 2:1-11, which is the story of the Wedding of Cana – for a moment in my heart it affirmed that this manner of trying to get God’s message was just nonsense. What did the story of the wedding had to do with this moment or with our situation? Here I was desperately asking for His Word and all I got was the story of Jesus turning water into the best wine at the wedding, which happened to be Jesus’ first miracle and His Mother Mary had interceded for the couple and their families. I stood in silence crying wondering if God had heard me. All of a sudden, like a whisper - a thought waved in my heart … “You have not seen anything yet, I have left the best for last”. Just like the best wine had been served at the end of the celebration in Cana, God was not done. I thought of the grapes being pressed and the process of producing the best wine. I embraced the bible. He knows when our hearts are in need and ready to receive His Word. His Word always comforts us and strengthens us - no matter how we get it. At this point, David became interested in learning about his finances. He had been working since he was 16 years old and had always been a great administrator and managed his finances very well. We went over his bank accounts, his business and his investments. We called his financial advisor Woody in Miami who explained everything in detail. David seemed satisfied and never spoke about it again. We received the sad news that Uncle Tom had died. I remembered that as a kid, I liked to see him smile. His face would transform into a kids’ face and you couldn’t resist but smile back. We prayed for him and thanked God for his life. 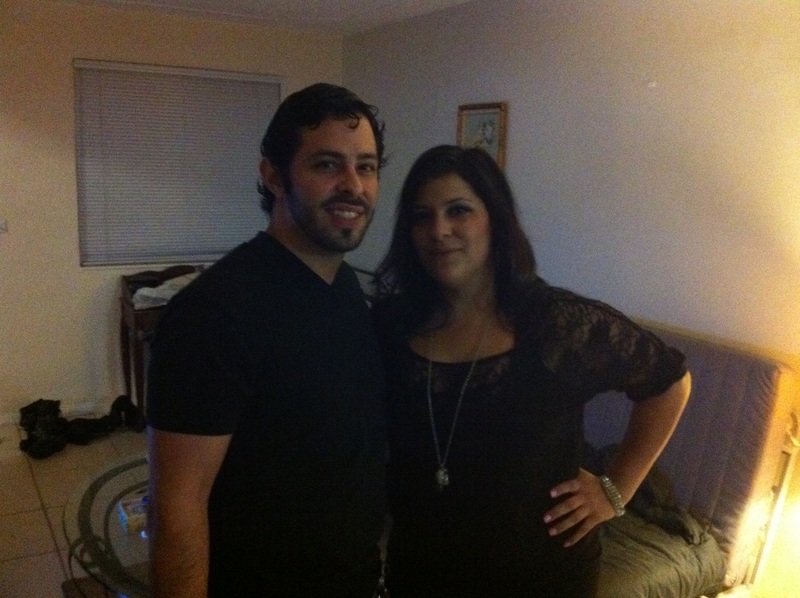 Cousin Cristy from Puerto Rico came to visit and we had a great time. It was a very special visit. For the second time, David’s right arm twitched for seconds. He was calm and didn’t loose consciousness. We weren’t sure what this meant but I recorded it to mention it to his doctor. As it twitched, I pictured all these connections happening in his brain. We enrolled in the RCIA (Rite of Christian Initiation of Adults) classes at church to freshen up on doctrines, beliefs, practices and history of the Catholic Church. This would be David’s first time in a classroom setting. He enjoyed it very much. We took notes, asked questions, and later discussed what we had learned. At this time we were reading, “Let the Fire Fall” by Michael Scanlan, T.O.R. Everything about this book was so appropriate and relevant. Several statements stayed in my heart and we reflected on them constantly. “I believe that the healing we see all over the world signifies a new urgency in the Lord’s work in the world. This is a time of visitation”. (Page 144). Five years prior I had been part of the lay apostolic association of “The Legions of Mary”. The Legion serves the Church visiting families and the sick at homes and hospitals. Sts. Peter & Paul’s presidium visited us and left us the statue of Our Lady of Fatima to stay in our home for four weeks. Every day we prayed the rosary together and felt blessed to be part of such a wonderful community of faith. David expressed interest in working again. He was set on wanting to work at Wal-Mart and getting stocks. He would practice welcoming as a greeter by waving the hand and saying “Hi” as much as he could. By October, Dr. Langford ordered boots for David and that meant there would be no more casts and that physical therapy would start soon. He also checked the right elbow for calcifications but reported everything was in perfect condition and advised we continue with the stretching exercises. We said goodbye to the wonderful staff who we worked with for over 6 months. One afternoon reading in front of the lake, David shared that the first thing he would like to do would be to dance. David continued to move the right leg more regularly. 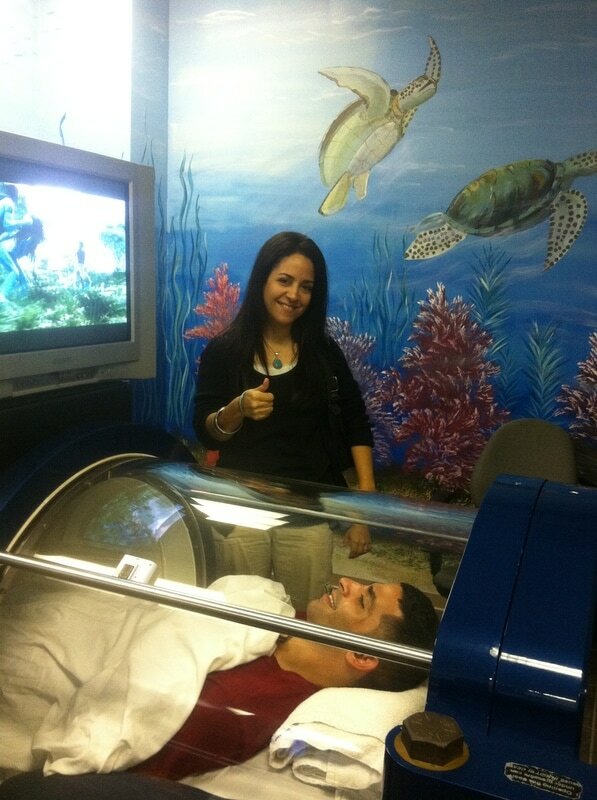 My mother was coming to visit us and David was getting ready to begin his second round of Hyperbaric Oxygen therapy. We were also planning on going to Miami in December. It had been a year since we had left and we were looking forward to going back and visit. Jorge’s cousin Cita came from Puerto Rico and as always we ate, laughed, sang and danced the night away at home and at William and Pili’s. David started PT at Lucern Rehab and worked hard at taking steps and using the standing frame. 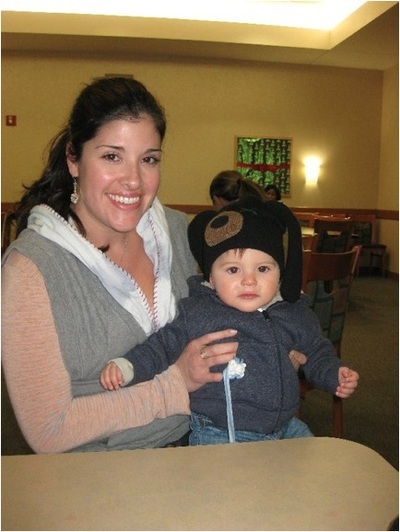 Ana Carolina had been working as a nanny in Miami. The family was going on vacation to New York. Ana would fly with them and drive back from New York to Miami. Before she left, she invited us to Sea World and we had a great time. We met Shaka’s son Jerome who had also suffered a brain injury. He encouraged David to be patient through the process, that all would come back in time and to trust God who is the Healer. I recalled from the movie “Facing the Giants” the phrase … "God will send the rain - we first have to prepare the field". Georgie came to visit with his wife Shanna, babies Ariana and Giovanni and his friend Mike. He brought David an electric wheelchair. We knew David was in a new phase. He was reacting to situations and expressing interest in other areas that certainly demonstrated his awareness and new attentiveness to his surroundings. David was now scratching his ears and his sense of smell was intact. As soon as I would turn on the heater, he would alert me that it smelled like something was burning. We pondered on how great Lord’s love for us was as we walked in faith. I had this image of God embracing the universe and Jesus Christ right in the middle, which spoke to my heart constantly. From New York, David’s friend Liza G. called and told him that he was on her mind all the time and that she believed God was using him in a powerful way for others. Her call brought a lot of joy and we thank God for His presence in our friends' lives. 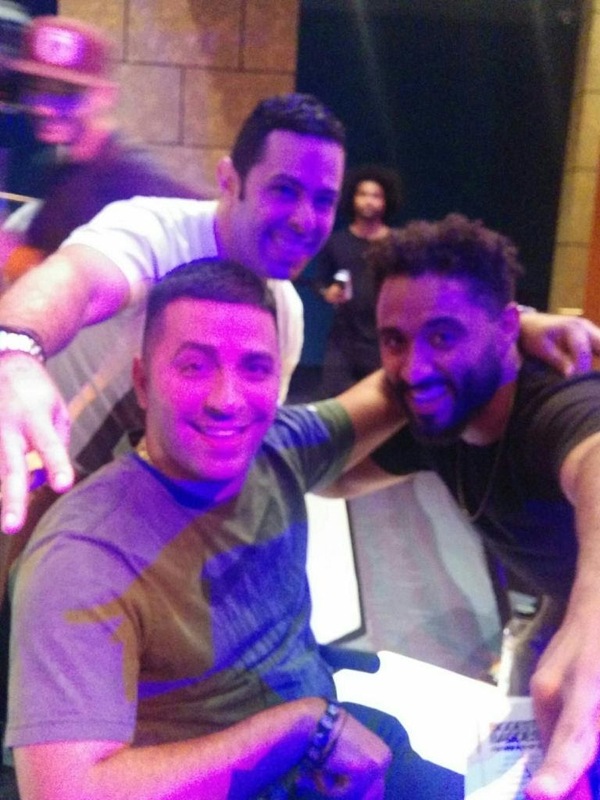 One Friday night we went to see “Salvador Live” at downtown Orlando. Salvador and David had been friends for many years. Break-dancing together was almost like a salutation and watching Heps performed was a big treat for David. David’s first trip to the beach was amazing. We spent a beautiful afternoon at Cocoa Beach. We had so much fun with my mother in town. She was amazed of David’s progress at Rehab and at the pool. 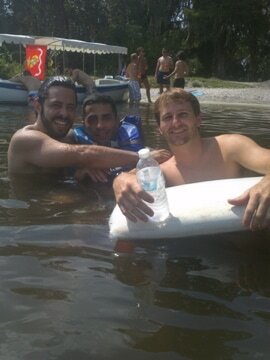 We shared great moments at Winter Park and at the lake. 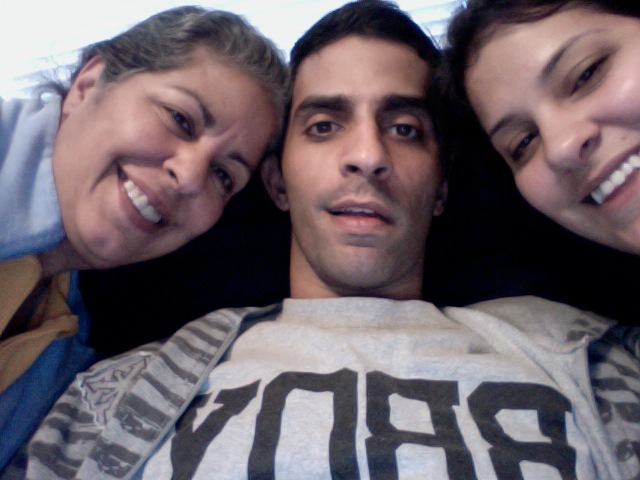 For thanksgiving my mother left to Miami to spend it with my sister Gaby. Eddy, Karina and Ana Carolina drove home. We had a wonderful time. 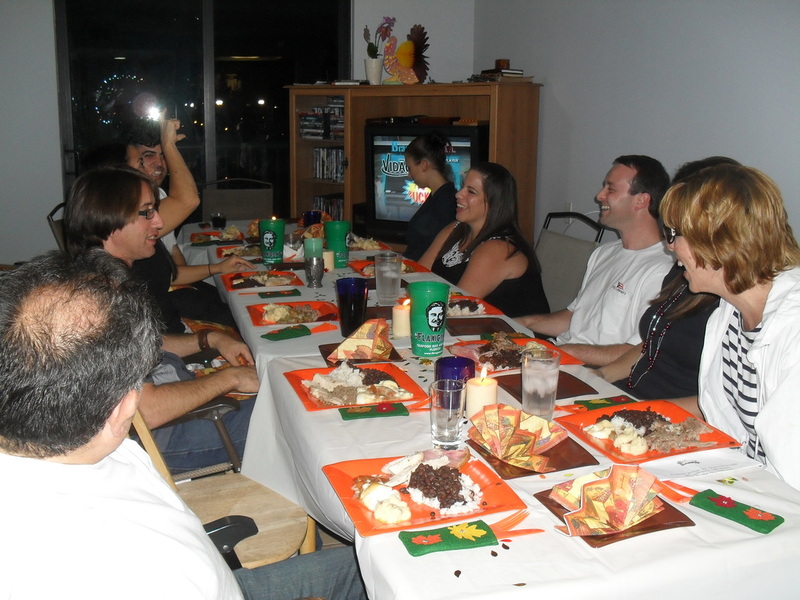 We recalled the prior year’s thanksgiving in Miami. Ana had made her first turkey, pureed it so that David could enjoy a thanksgiving dinner at the nursing home with her. Eddy and Karina spent it with her family while Jorge and I celebrated it at Aunt Flor’s house. 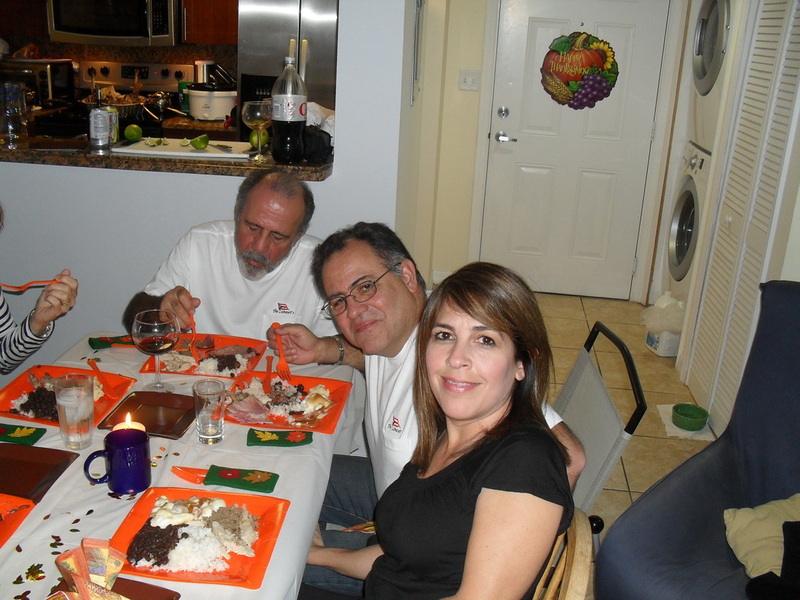 Fernando had also cooked his first turkey with Josuan back home in Casselberry and ate burned turkey. This year we were all together again giving thanks to God for life and His love. 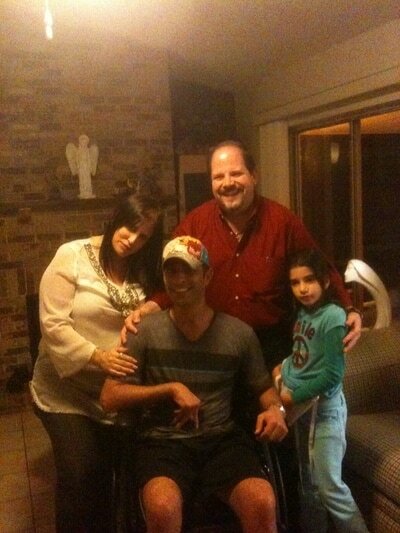 Rick, Ginger and Adam visited and were impressed with David's progress and healing. 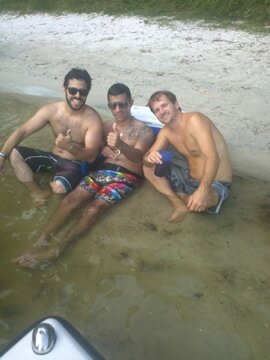 That afternoon David, Fernando and Eddy went to Justin father’s property and later went to Chris’ house. Kris O, Jeanette S, Ryan B, Brandon and Tony passed by. It was wonderful to see them. On Friday, Fernando, Jorge, David and I went to see James Bond at the theater and had a fun time. 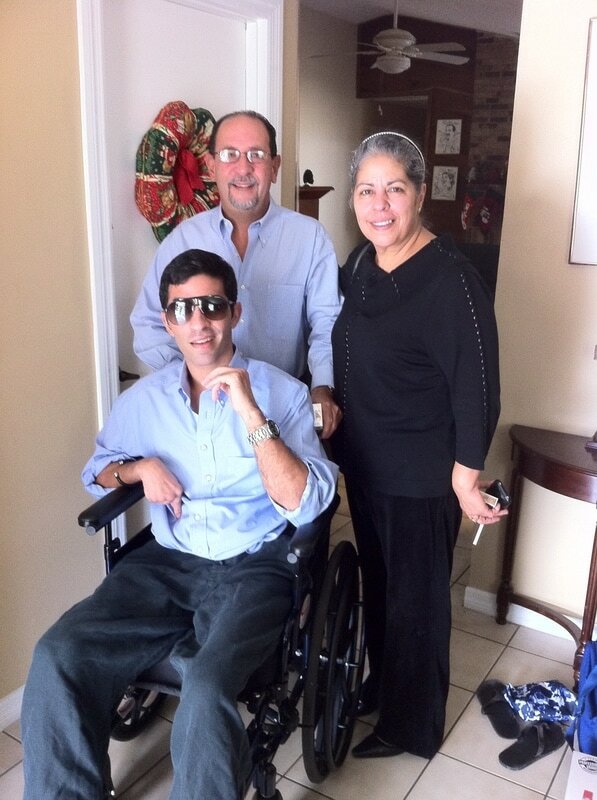 David’s standing frame arrived, UCF would be calling soon about Speech therapy and the splints would soon be ready. We visited the University CORA Rehab and continued with the pool therapy. It felt like there was less and less effort from me to get David standing. We were moving ahead. 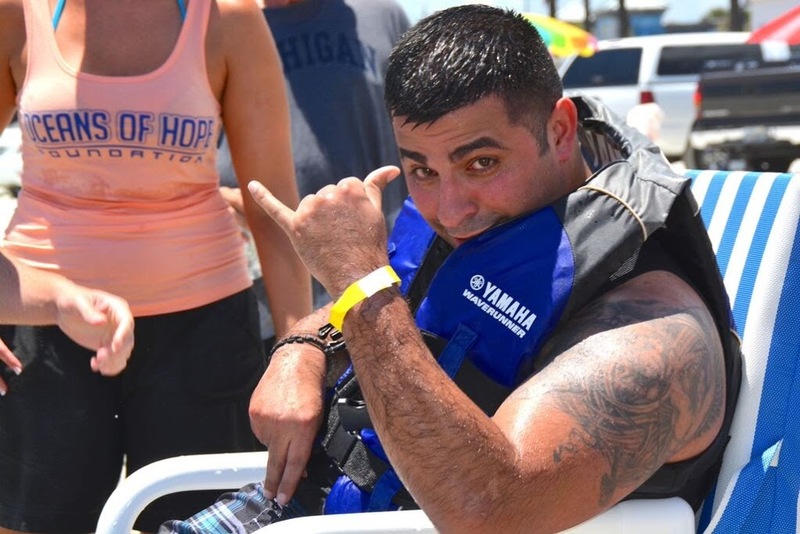 Even though at times we hoped to be able to place David in intensive-rigorous rehab, we knew his therapies at the non-aggressive pace was working for him. We had spoken with several parents and TBI survivors who had expressed how at times aggressive rehab felt overwhelming and somewhat forceful when the brain was still figuring out time and space and even though it advanced some movements it also would cause them to relapse and lose ground. Many shared it would intensify their depression or anger. For some families – intensive rehab became the hope that it would result in a “get back to normal” scenario. The expectations were drawn high for different reasons from having other responsibilities to attend to, not being financially capable of a continuous program or not having someone able to take the necessary time for the needed rehabilitation. At adoration one evening, a fellow parishioner whispered that David would be ok and that brought tears to my eyes. We prayed together especially for Jacob, Aggie’s grandson from Michigan, who had a brain tumor and as he underwent through many procedures his faith was strengthening his family and the community around him. My mother related how Jacob insisted to his church’s pastor in talking to the congregation to what he agreed and recorded his message, which was full of hope and could have only sprout from a heart full of God. Part of Jacob’s message was this: “Jesus loves you and doesn't want you to carry guilt”, he said. “There are three types of hearts. The black heart is a heart full of sin without Jesus’ love; the grey heart is a heart with sin but longs for Jesus’ love and the white heart is a pure heart with Jesus’ love”. In his message was a call to God’s Mercy and Love. It reminded me that God has a purpose and a divine plan for each one of us. We have free will to accept His plan or live our own. This 10-year-old boy revealed in joy the love, which settled in his own heart and became a path of hope to others. We continued to place Jacob, Olivia and David in prayer so that their lives would produce peace and joy throughout their journey. As we were getting ready for our trip to Miami, David became uncertain on visiting Segafredo because of his inability to talk or walk. We saw pictures and videos from when he was at the hospital, which he hadn’t seen up to that moment. 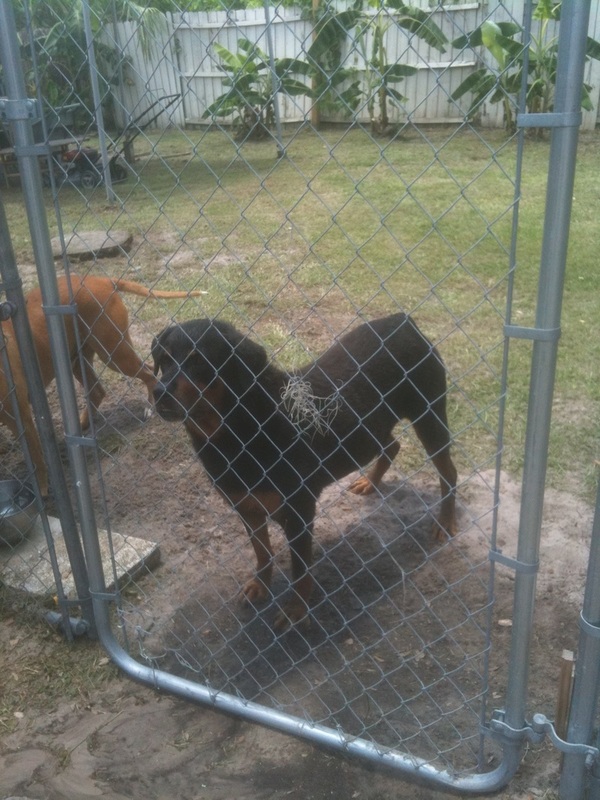 We meditated on how far he had come and almost immediately he agreed to leap into this opportunity. Ana Carolina, David and I drove together and Jorge would drive down and meet us after work. 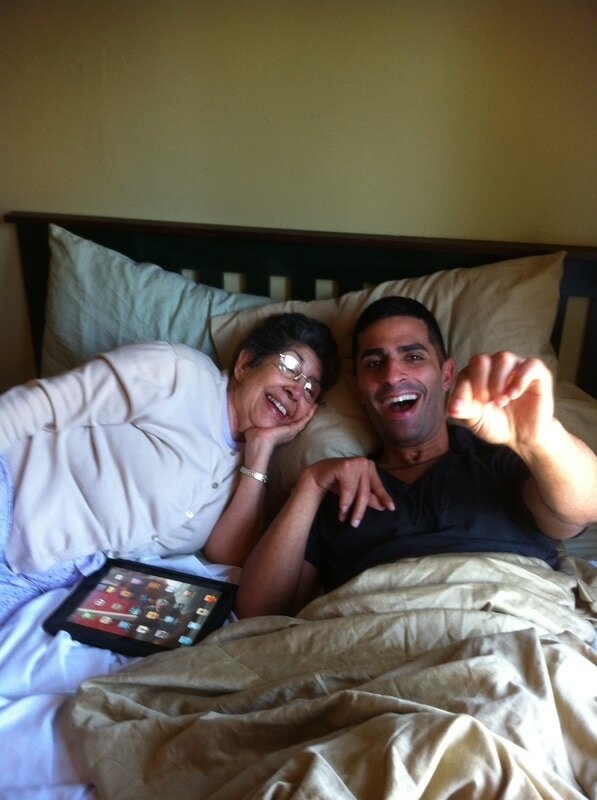 We stayed with Gaby where we shared laughs and stories with family. The trip included a visit to his dentist Dr. Miranda which David was looking forward to. Eddy cooked for us at his apartment and we walked by the bay. We were impressed how David remembered as he directed us to go to Bayside Hut through the back streets. His long-term memory was there. Manny and Catherine invited us to an amazing barbecue and the next day we had Christmas dinner party at Aunt Flor's house. The next morning we met at Manny-Catherine’s for breakfast and had the “David Arroyo” sandwich from “The Sandwich King” cafeteria which owners Lili and Gustavo were so happy to see David. On Wednesday we went to Segafredo and shared with family and friends Sebastian, Lazaro, Claudia, John, Woody, Natacha, Cristina and others. We went back on Friday and met with Simon whose support and prayers had been present from the beginning. This trip had been such a blessing and an early Christmas gift for David. Back home, David seemed deep in thoughts. For about 2 weeks I could see a kind of sadness, which had not been there before. He gestured about not being able to walk. All I thought was how his suffering was on the cross with Jesus. David never lost faith and his joy was real amidst his suffering. At home we prayed for Fernando’s decision in considering joining Communita in St. Augustine. On the other hand, Miami seemed to be a closed page for Ana Carolina, for she was falling in love with Steven. Life was moving forward. 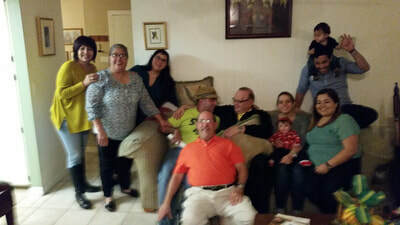 We celebrated Christmas Eve at William and Pili’s and spent time with cousin Carmencita. Christmas morning we shared together as a family. I cooked and we brunched over the traditional Puerto Rican Christmas meal. In the afternoon went to Chris and Susie’s and had a great time. For New Year’s Eve we shared it at the Caballero’s home, said our farewell to a year full of blessings and surprises and prayed for a special brand new year. We thank God for guiding us throughout this process because we can help others to stay strong in their own journey. He makes us strong and gives us joy. Our soul glorifies the Lord. A few days before the 4th of July, Ana Carolina called saddened that she had not been able to get the time off from work to come home. 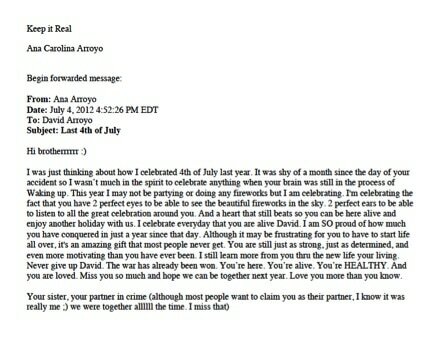 Along with a video of fireworks seen from her work, she sent David a beautiful email, which she titled “Keep it Real”. Each word she wrote touched David immensely. We missed her so much. She wanted to finish school so she stayed in Miami working and studying. As David became more cognitively aware - he would respond to situations and stimuli around him almost immediately. Watching TV, he would make us laugh, as he gestured me to call the 1-800 number every time a great offer would pop up on TV – even for a funeral home. His heart would always go out for the advertisements regarding donating for the children’s hospital or animal SPCA and always wanted to donate. I had to remind him of repeated commercials. He would giggle when - as he turned his attention to ask me to call the 1-800 - I already had the phone on my ear pretending to call the number. David sorted out his preferences of the music he wanted to listen to, the books he wanted to read and programs he favored watching. He would show disapproval to programs with a negative or violent undertone and preferred to watch movies with a positive or motivational message. David’s first appointment with Ortho Dr. Langford went very well. He was very happy to see the progress and mentioned that the right ankle was almost at target and that there was no infection. That evening Angel from his place of work in Miami, Segafredo called. His message was uplifting and brought tears of joy to all of us. 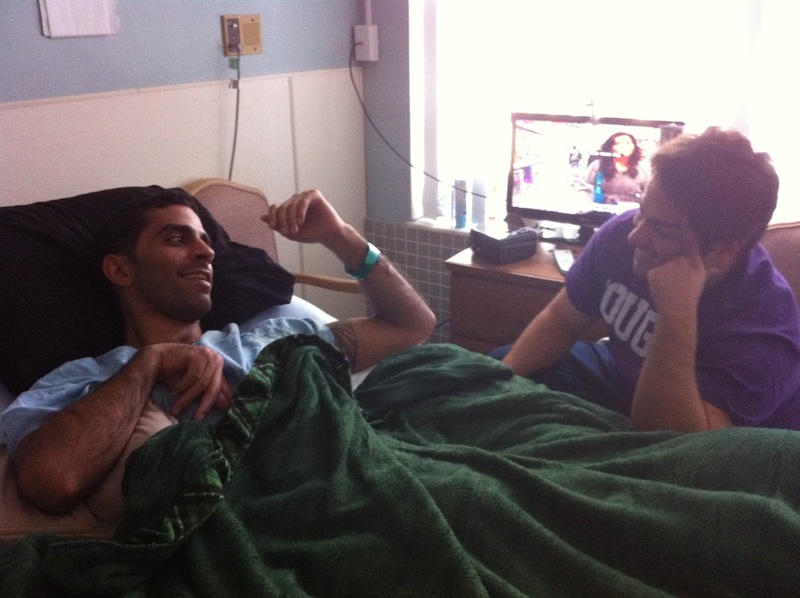 He told David that he was happy to know that he was getting better and stronger. 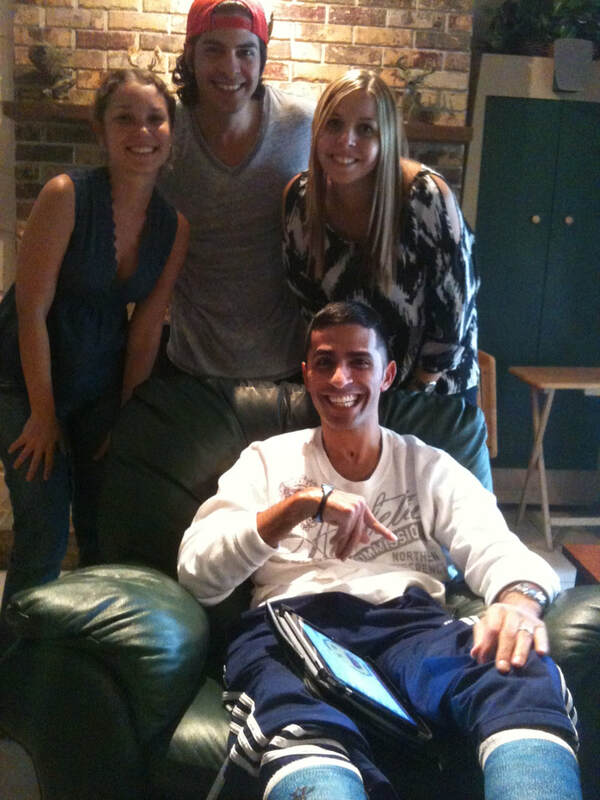 That knowing that David had his family helping him every minute of the day filled his heart with joy. He continued saying that God had a purpose, that David was in God’s hands and that a lot of beautiful things were in store for David. We tasted and saw the goodness of our Lord at adoration in the Sts. Peter & Paul chapel one evening. As I was getting ready to ask Jesus for David’s ability to speak again - as I did many times before - I felt a deep peace knowing that God was the One running the schedule. The fact that David was not able to walk yet was a blessing because of his perception of his surroundings and his physical abilities. I recalled the Lord’s message back in the nursing home in Jeremiah 29:11 “ For I know the plans I have for you, declares the Lord, plans to prosper and not to harm you, plans to give you hope and a future”. Regardless of our expectations, David was moving forward and the fruits told Who was blessing us. 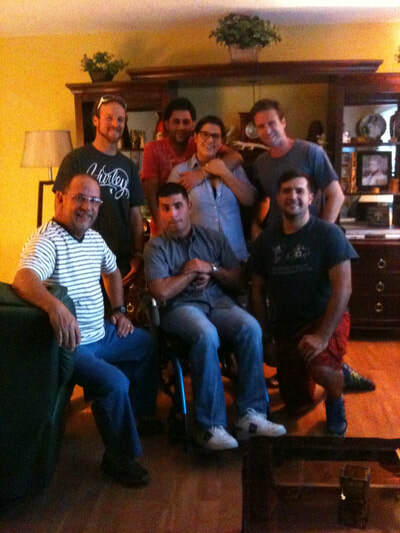 David’s friend, John T. came to visit him on Friday with cousin Hector Luis. John T. got him 80 balloons and a special “peacock” birthday cake to celebrate. They both showered David with fun gifts and we sang happy birthday. 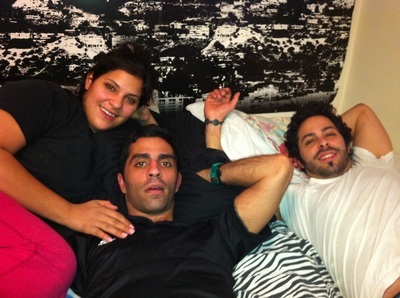 Eddy came by surprise on Saturday and planned to stay until Thursday to celebrate David’s birthday. Eddy and I stayed up until 5:00 a.m. talking about how we were all going thru our own process accepting all this new reality. He also talked about David’s promise on always taking care of each other and that family always came first. He wished to be close to David but understood he had to stay in Miami – finish college and discern what his future hold. 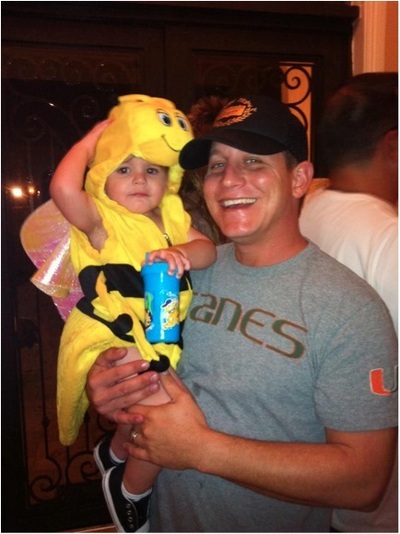 I hoped at that instance to have all my children in Orlando. Eddy coordinated David’s 29th surprise birthday party. I was a bit apprehensive about having so many people come. Ana Carolina told me to enjoy it. Fernando said that David would enjoy it as well. I made the famous chicken and rice with red beans. Friends started showing up about 5:30 PM. Good old friend Mike S., Collins, Kris, Jeanette, Steven, Chris S., Tony, Irene, Blake, Randall, Justin and cousin Michael started the celebration. We sang, laughed, reminisced and celebrated David’s life together. Irene wrapped up the party with beautiful real fireworks. There are certain phenomenons that can't be described. I reflected how in the midst of our suffering, God was speaking to others. 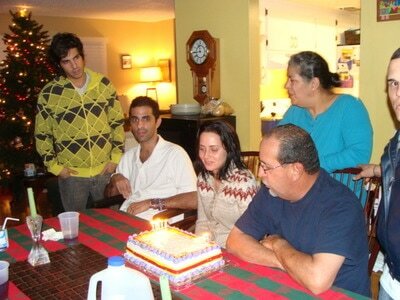 Eddy, Fernando and Ana Carolina were right, David’s birthday party was great and we all enjoyed it. As I would say goodnight to David, he would begin praying the rosary at night in his room. My mother’s friends Jack and Vi sent David a beautiful card of a perpetual mass in Rome said for David for the rest of his life. Kimberly called thrilled about a relic of Mother Teresa of Calcutta (now Saint Teresa) that was given to her by a religious nun from the Sisters of Charity order to give to David after relating David’s accident at a prayer group in Trinidad. Betty T. called while having lunch with John and kept on saying that David looked better than before and that God had a bigger call for him. Fernando filled us with the retreat’s message of hope that weekend after attending the “Hearts on Fire retreat” in Tampa. Prayers and messages of love continued to sustain us every day. It’s about Faith, Hope and Trust. 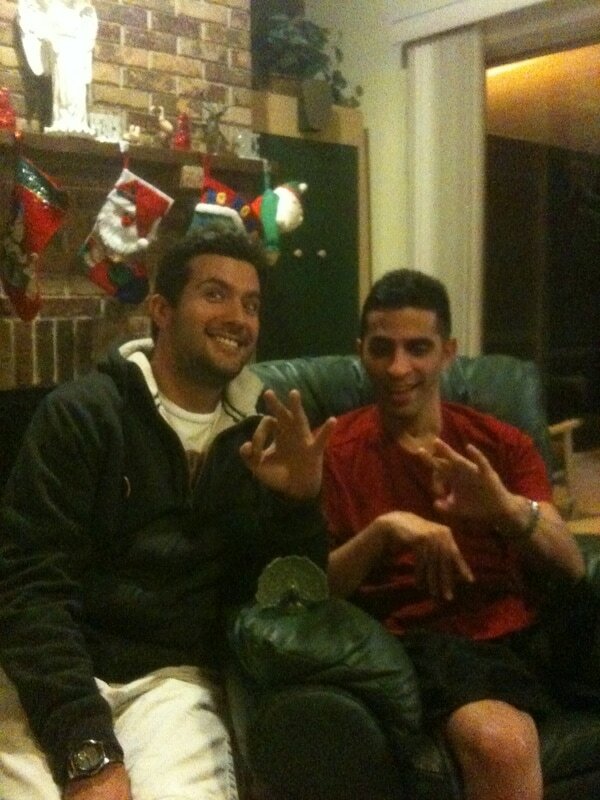 A few days later David showed me that he could make the sign of the cross correctly. He would show me the goose bumps in his arms to remind me it was 3:00 pm - the Divine Mercy hour and we would pray the Chaplet. During this time, I was drawn to pray for the family tree and bought a book on healing from Father Yozefu Ssemakula who visited our parish during this time. I learned we had the choice to be opened to receive the graces, which God had in store for us and ask for them because God would not impose them on us. I contemplated that if the heart is filled with fear, anxiety and doubt there is no place to care for others in need because the focus turns inward to the personal issues and problems, which in turn overwhelms and paralyzes. It is in trusting and accepting God’s Mercy and guidance that I could accomplish all things and remain in peace. Every day we continued to realize how much more there is to faith and also recognized that it is better to practice our faith with the little we know about God than to walk in arrogance claiming we know all about God. Faith gives you hope and hope heals. 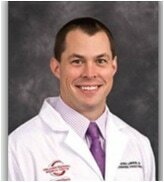 We looked forward to Dr. Langford’s appointment. 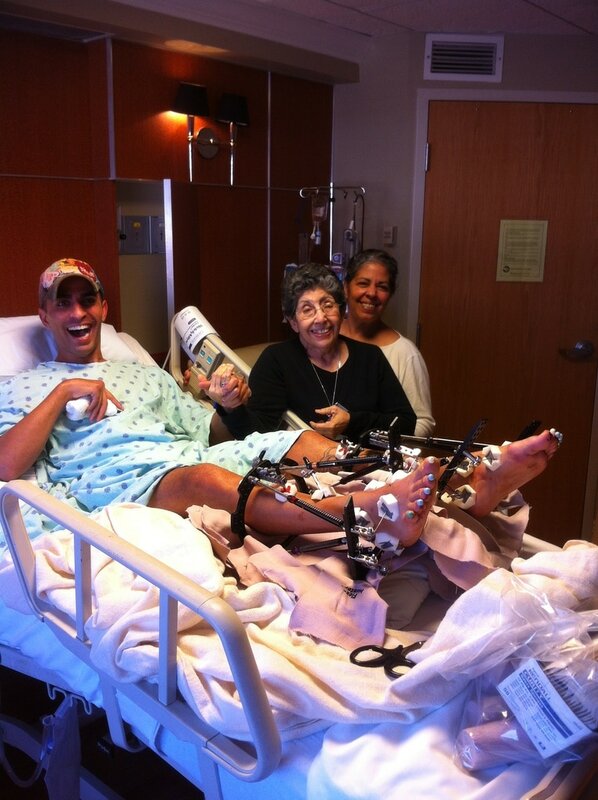 David’s feet looked amazing and we couldn’t wait to see him stand up and put weight on them. The doctor was pleased to see David’s progress and the order was given to remove the frames. Surgery was scheduled for September 17th. David’s new wheelchair arrived right before his birthday. It was light to carry and measured to fit him. For the next few weeks we had family and friends visit us. David would play games on the IPad with Gaby especially "Flow". 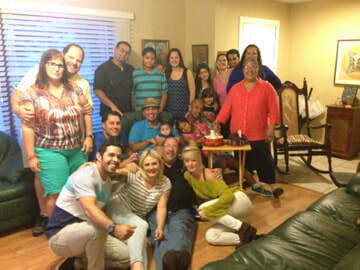 Uncle Joselo and Tia Mireya, Kimberly, Cristina and Michael, Kris O and Joy. Manny, Catherine and the kids came to visit David and we had a great time. Ana Carolina came with them and stayed until Sunday. Two weeks later, on Saturday Carlos, Marcia, Michael, Christina, Josh and Crimson, Jennifer and husband Lee came to visit while Kimberly, Karina and Eddy were home. What a blessing it is to have all of them in our lives. At physical therapy, therapist Leonard recommended a standing frame for the home and was approved. It would assist David with bearing weight on his feet and work on his posture. David indicated that sign language was no longer an interest. He wanted to speak and write so we shopped for several workbooks and searched for speech exercises online. We started a new schedule so he could practice to write, speak and read. He seemed to be in a new phase. His body awareness was more accentuated. Now he would gesture when he was ready to go to bed if he was tired and when he wanted to listen to music or go online to his accounts especially Facebook. One evening in prayer, my attention was drawn to the scripture reading of the wedding in Cana where Jesus turned water into wine (John 2:1-11). I kept repeating in my heart “you have kept the good wine until now" from verse 10. In silence I knew the Lord was keeping the best for last. David’s progress was already a miracle and our trust in God kept growing. Saturday afternoon as we watched a TV program were a lady explained her out-of-body experience after a car accident - David got very emotional and extended his legs. When I asked him if he had the experience he nodded his head with a yes and cried. David knew what this lady was talking about. I could see it in his eyes. At confession later on, Father Fidel officiated the sacrament of anointing of the sick for David and Father Derk blessed a Faith-Hope-Love ring we had gotten him. We Skyped with Ana Carolina who was at Sandwich King at the “parrillada” and had Gustavo speak to David, which made him very happy. 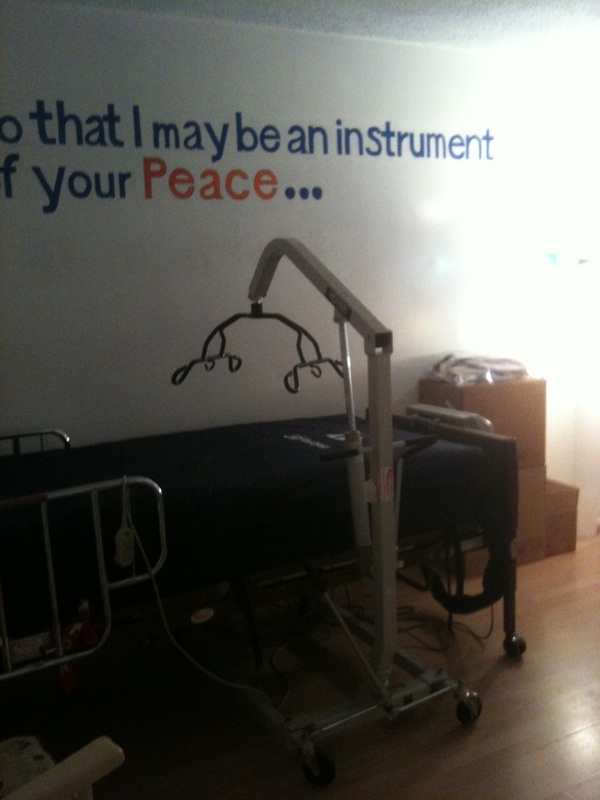 The night before the surgery we read the scripture were it reminded us how much God loves us. 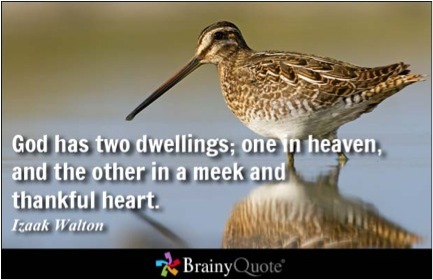 “26 Look at the birds of the air; they do not sow or reap or store away in barns, and yet your heavenly Father feeds them. Are you not much more valuable than they?” (Mathew 6:26). 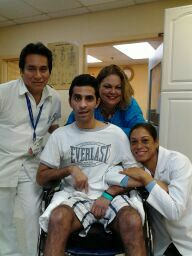 The surgery was again a success and now David was on the road to recovery to begin standing up on his feet. Brandon “Ice Man” came to visit and told us all about his journey on the trail, which sounded to have been very fruitful. With a joy that can only sprout from deep in the soul, he shared the many encounters he had with God. He mentioned that as he was on the top of a mountain looking at the magnificence of all creation his heart kept wondering how could anyone doubt God’s existence. Brandon at the top of the mountain. Eucharistic Minister Carl K from Sts. Peter & Paul had been visiting David at home, sharing the scriptures and giving him communion since he was home bound for 16 weeks. We looked forward to his visits and thanked God for him every week. Because David’s frames were removed we would be able to go to mass on Sundays so Carl didn’t have to come by anymore. He became a special friend in the Lord. 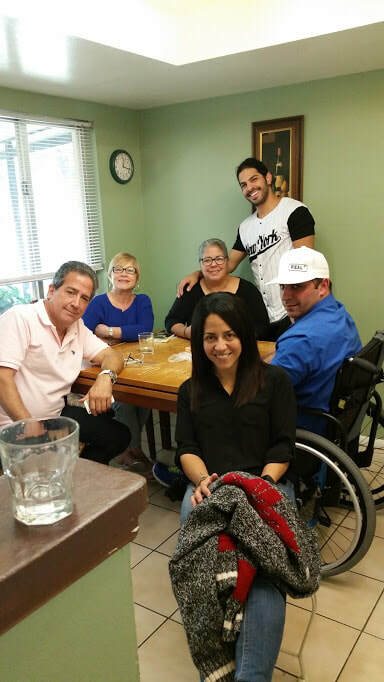 A few weeks later, we cooked a very special Spanish meal for him and along with cousin Carmen, who was visiting from Puerto Rico and her daughter Pili had a great time together. We appreciated more than ever the ministries, which the church provides to reach out to those in need. It is God’s way of taking care of us – through those who are open to respond to His call to help others. There is a purpose for our existence in this place and in this precise time. We can stop running in circles and discover the joy of learning what it all entails. When we love one another in the process of living, we get closer to the One who gives Hope. How much must Jesus suffer when He is ignored or He is unknown especially because then He can’t fill us with joy and strength during our moments of turmoil or give us his love to share with others. Our response makes this world a better place. We have to ask Jesus what we need to do so that He can work through us. We can’t do it without Him and He won’t do it without us. Studio One. Click picture for FB video. Friday night, after dinner Jorge, David and I drove to drop off Fernando at University Cats. 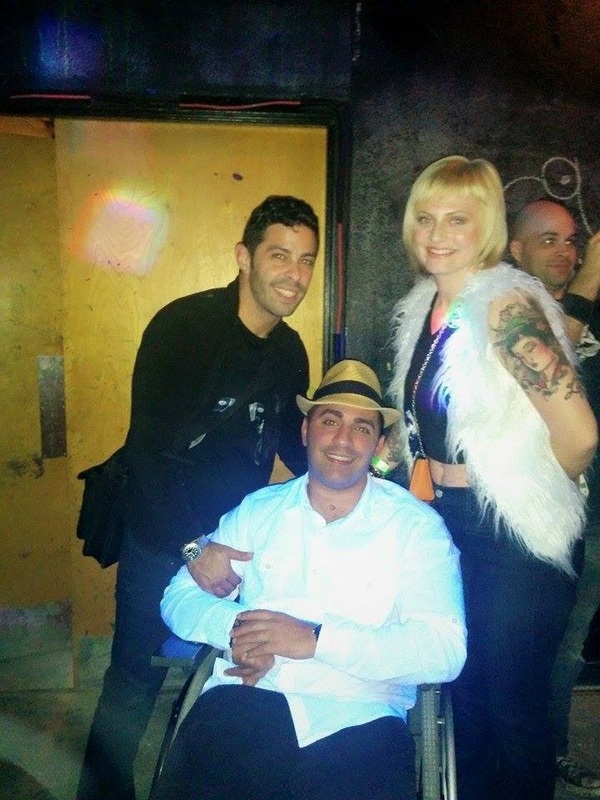 Julie J. and the Studio One crew invited David to come into the gym. He was so happy watching them dance hip-hop, break dance and spin. We left around 1:00am. It was the first time going to bed so late. The next day we went to Shaka to get a haircut and then spent the day with Ana Carolina. Before she headed back to Miami, she “kidnapped him” for a ride. It was his first time riding in the car with her after a year. Chris, Erik, David, Mike, Justin, Steven and Fernando. 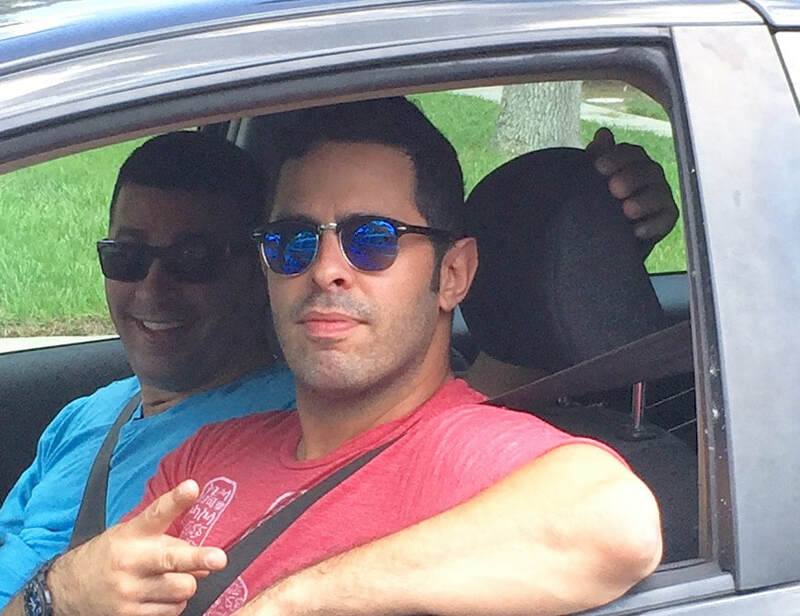 Eddy drove from Miami and took David to the movies. It was his first time going to the movies. 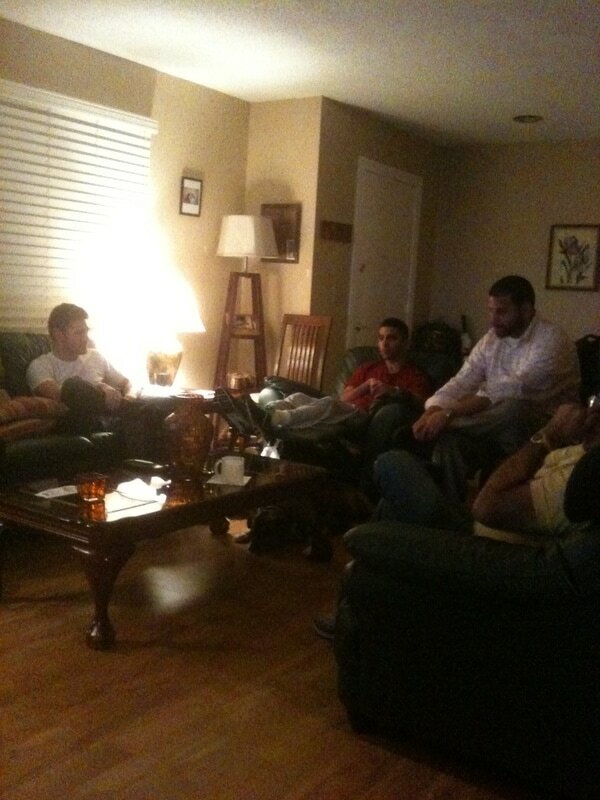 Afterwards, like good old times, they went to spend some time with friends at Justin’s house. We celebrated Easter Sunday with Jorge’s cousin Carmencita and Pili. We had so much fun dancing for David. For a college project, Eddy returned the following week to videotape the founder of the Tote of Comfort & Hope Program and Mothers for TBI Hope, Tracy Porter. After arriving to the Trauma Center where David had been admitted in Jackson Memorial Hospital, the staff handed me a tote bag with toiletries, literature and other care needs. This was the work of Tracy who had been through the frightening experience with her son suffering a severe brain injury in 2004. Her story was inspirational and full of compassion. We had a wonderful time at Downtown Orlando’s Lake Eola, and thanked her for such a beautiful mission of love. Lenny L. from the Brain & Spinal Cord Injury Program stopped by to drop off special boots to help keep David’s feet in the correct upright position. David began rolling on one side in bed which meant he started activating core muscles. At therapy he worked on the motorized bike and became more aware of using his heels versus the toes when standing up. It was becoming obvious that David was gaining more independence as he asked not to be helped with feeding and wanted to use the fork instead of a spoon during meals. We registered at the Winter Springs Senior Center to access the heated pool and worked on balance. It would be the first time David would be completely submerged in water. At first David became nervous in the water and hanged on to my neck. After a few visits he learned to relax and grew confident that he would be ok even though he had very little control of his body in the water. I meditated much on the gift of free will and how important is to recognize it - for it sustains hope. Just like he always used to do, David enjoyed writing out on a poster his short and long term goals and placed a sign language poster up next to his bed. By this time we had finished the third book by Henri Nouwen, Can you drink my cup. For about two months, CNA Denise helped us at home with David. She was a big blessing for us. She had the patience and dedication to genuinely care for our needs. As time went by, David was more active in using his body adequately to assist in standing up from the chair. This meant we didn’t need Denise anymore. It was a bittersweet decision because it was hard to say goodbye but at the same time it represented David was progressing. Denise became our angel at home. During the next few weeks we had family visit us. Jorge’s cousin Lourdes, Esteban, their son Quique, nephew Jose and grandma Doris came to visit from Puerto Rico. Grandma Doris led a beautiful-powerful prayer over David. Kris O. and wife Joyce who were also visiting joined us in prayer. 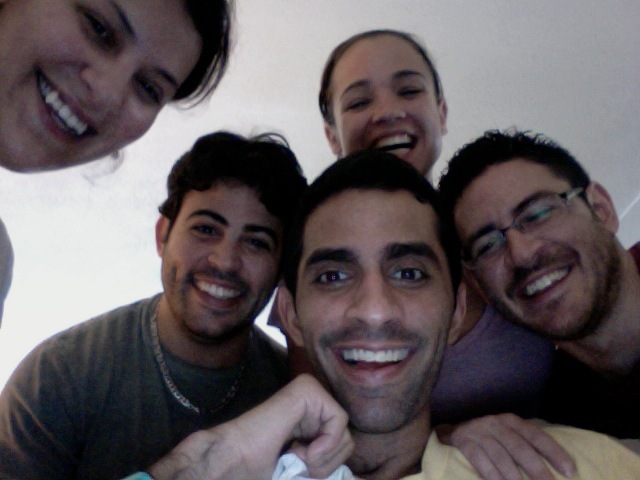 Noemy and Hector visited the following weekend from Ohio followed by Mayito and Tere from Puerto Rico. Lourdes, Quique and Esteban with David. 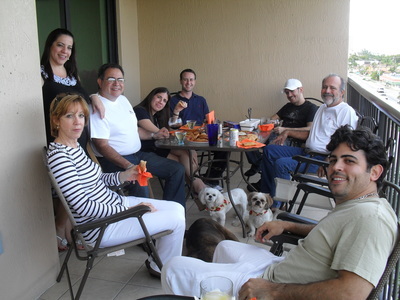 Doris, Fernando, Kris, Quique, Lourdes, Esteban, David and Joyce. 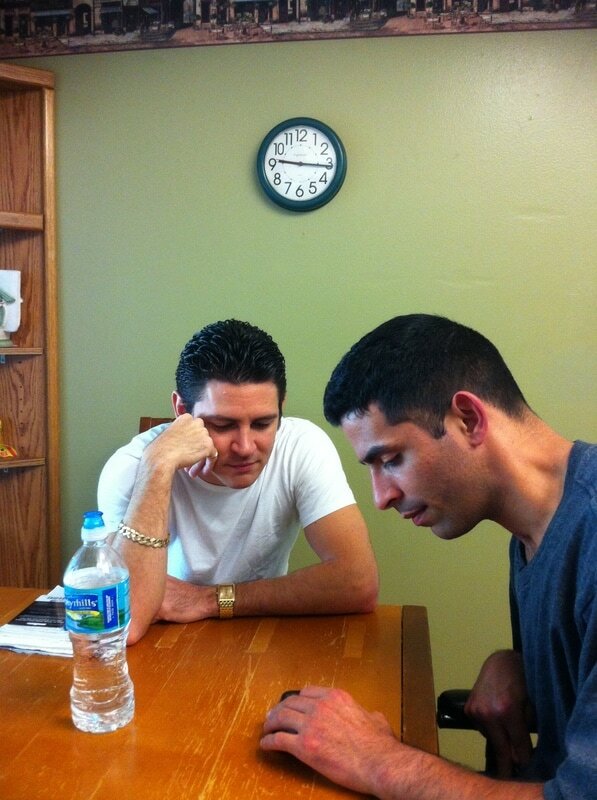 Uncle Mayito brought David an IPad, which fascinated him and immediately began to explore it. As David surfed on the Web on the IPad, he saw a position as a project manager with Cirque du Soleil. I saw him clicking to apply for the job and asked him to point to the qualifications he met and as he looked through the criteria he then pointed at “great communicator”. We talked about this skill as a motivation to continue working at speech therapy and I thought internally how much of a strong communicator he already was without using words but by his great faith and joy. 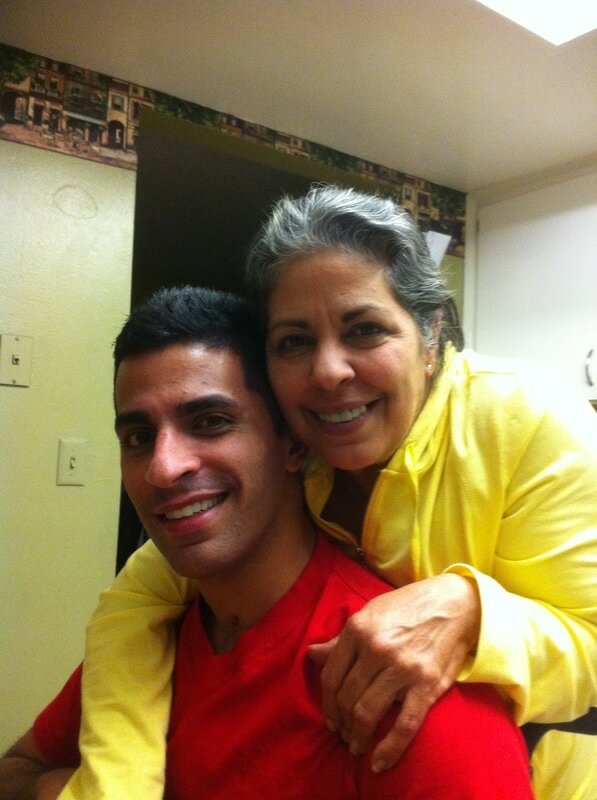 Gaby came to visit on the Friday before Mother’s Day, which marked one year since David’s accident. As a surprise she prepared with David a delicious breakfast for me. Carmencita and Pili shared some fun time with us that evening and we sang and danced to the 70s music. A year ago on Mother's Day, David had given me a trip to Spain as a graduation gift. I was to leave on a Friday from Miami but on Tuesday of that week he would suffer the accident that caused the brain injury. I kept thinking what a blessing it was that I had not left and could be by his side. Here we were a year later celebrating a new day every day together. He was so happy to invite me to a coffee, gave me a beautiful card and my favorite perfume for Mother’s Day. When we went to cross out the day at the calendar like we did every night before going to bed, he insisted on not crossing out Sunday because Mother's Day would never be over. The following Saturday, Kimberly came to spend a few days with us. David was so excited that for almost a week before she came, he kept waking up several times at night hoping time would pass by quickly. On that Saturday, we waited for her at church and we all went to confession. Afterwards Jorge, Kimberly, David and I went to Aloma Cinema grill for dinner and a movie. 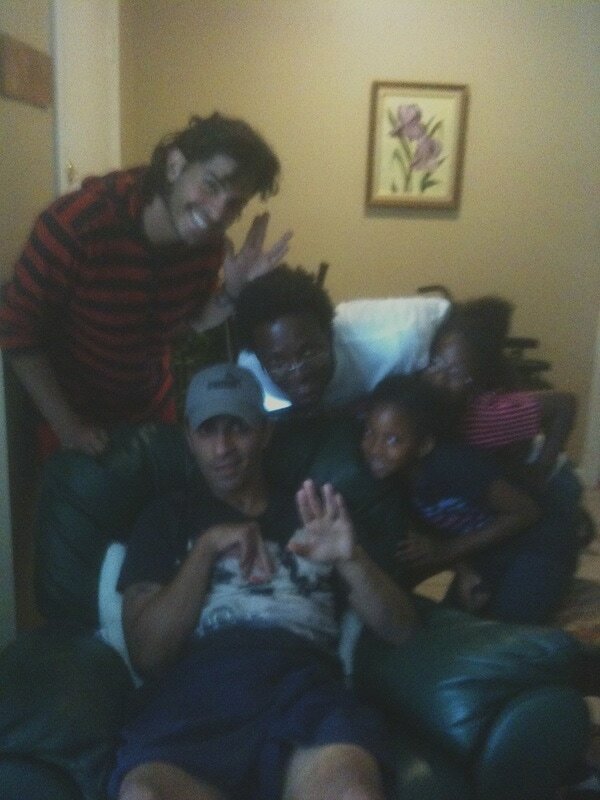 We watched “Battleship” and had a great time together. We had learned that standing up would allow David’s bones to bear their weight keeping the bone density and muscles strong, preventing overall atrophy. 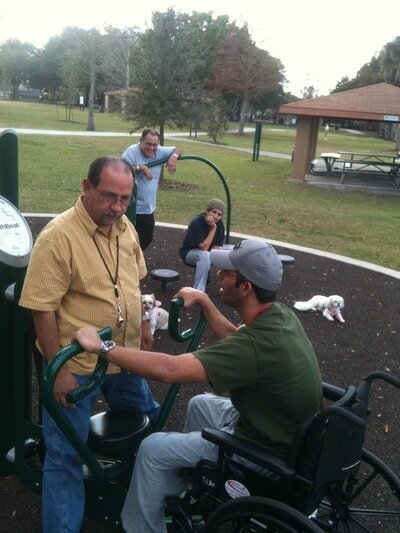 We met his brother/friend Tony at the gym for some stretching and bone strengthening. 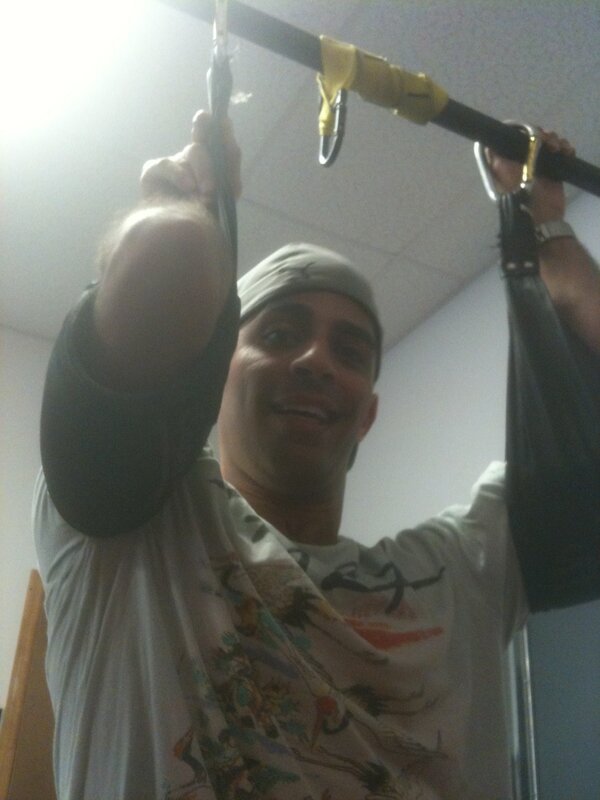 He was energized to work out with Tony. Prior to the accident, David was in the best physical shape - so after a year -working out at a gym felt invigorating. 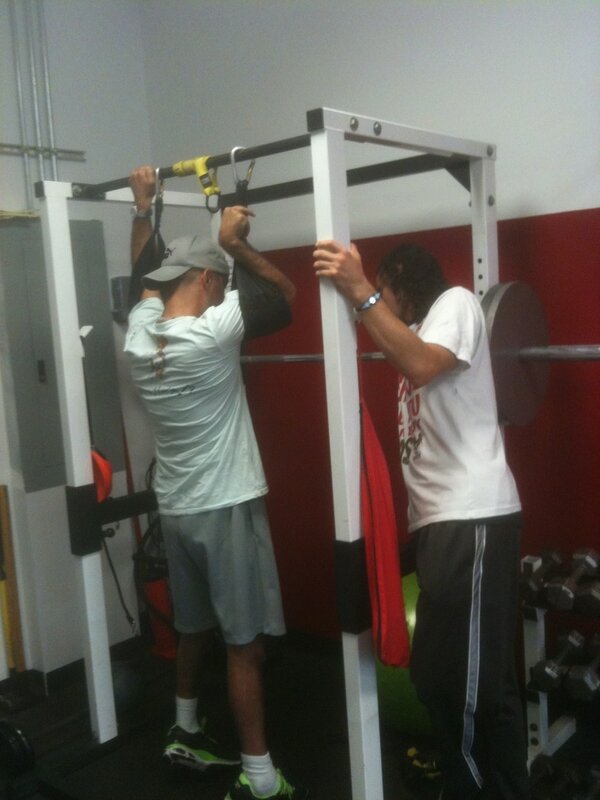 David & Tony working out. 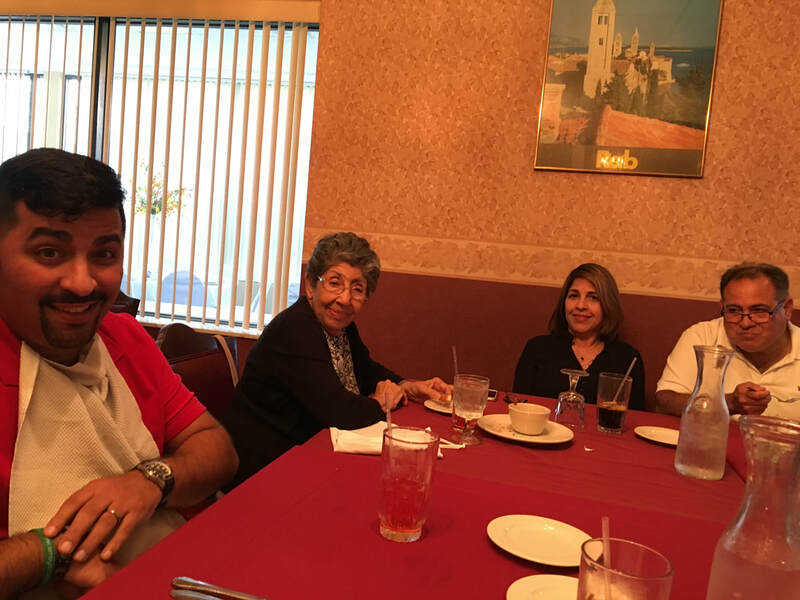 My cousin Arturo also visited us that weekend and noticed that David was more involved in the conversation and that he was attentive to his right arm which was now slightly moving at command. In prayer one morning, David chose 2 Psalms that spoke to our hearts and revealed his gratefulness for the Love he was receiving from God. The best way to express what was in his heart spoke through these Psalms. Reading both Psalms in its entirety and reflecting back - can only provoke deeper thoughts today and reveal the beautiful relationship of a son and The Father. There is no doubt in my mind David has chosen the best part of his life to rejoice in the Lord. Here is a verse from each: Psalm 40:18 “ Though I am afflicted and poor, my Lord keeps me in mind. You are my help and deliverer; my God, do not delay!” Psalm 52:11 “I will thank you forever for what you have done. I will put my hope in your name – for it is good, in the presence of those devoted to you”. Because David’s heels had rotated and his foot drop was so severe, the physical therapists referred us to Orthopedic Dr. Joshua R. Langford in Orlando. Immediately he scheduled David for surgery at ORMC on June 11th to install the “Taylor Spatial Frames” on both legs to correct the deformities. Dr. Langford explained that the frames were circular stainless steel external fixators or rings that would be surrounding each leg. It would have wires fixed to the rings, passing through the skin and into the bone. Pins would be attached on one side of the frame and wires going through the bone to the other side of the frame where it would be attached and held under tension. There would also be rods between the rings to make the frame stable and to make adjustments by turning special nuts every day. 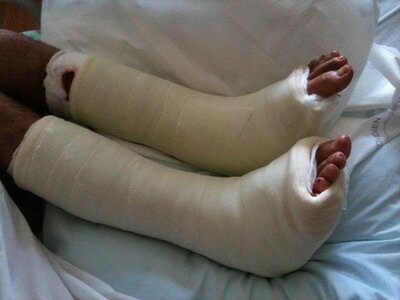 The concerns were the possibility of infection and ankle dislocation both common for this type of procedure. These apparatus would gradually lift his feet to the upright position and turn the heels straight facing forward to allow him to stand on both feet. 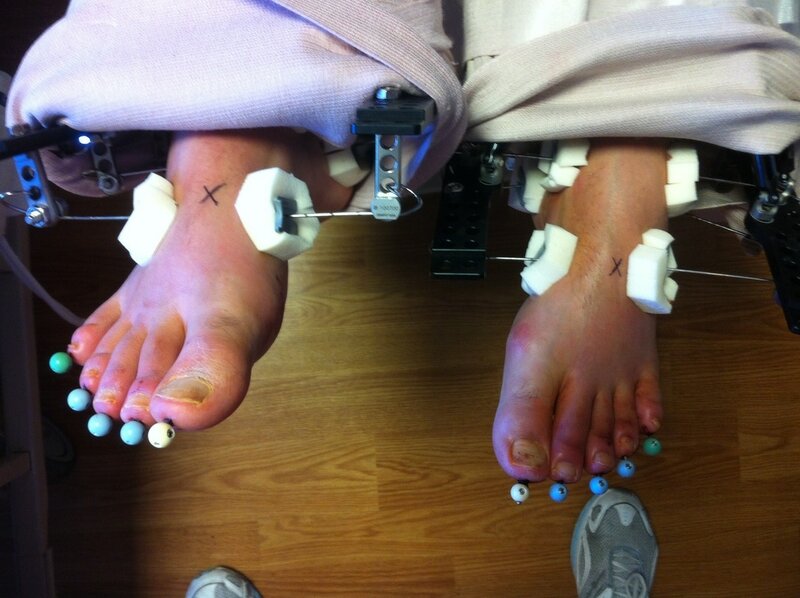 Because the process of healing would take about 8-9 months, Dr. Langford recommended placing the frames on both legs to avoid having to wait so much time in between surgeries and allow David to begin weight bearing on both legs as soon as possible. I would be in charge of the adjustments at home and would have to watch for complications. Showers would be challenging, moving David around would also become strenuous and sleeping in bed would be demanding but, after a year we were excited to see his feet back to the normal position and watch him stand up. 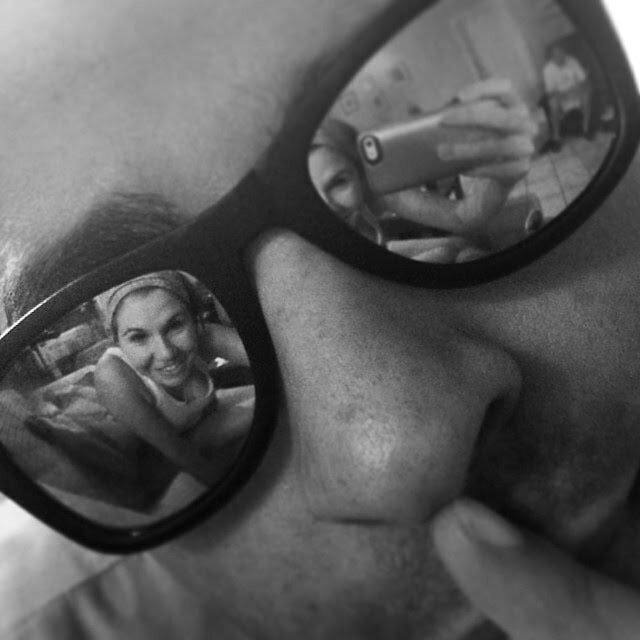 He would have to wear the frames for 4 months - so our day to day would be changed dramatically. 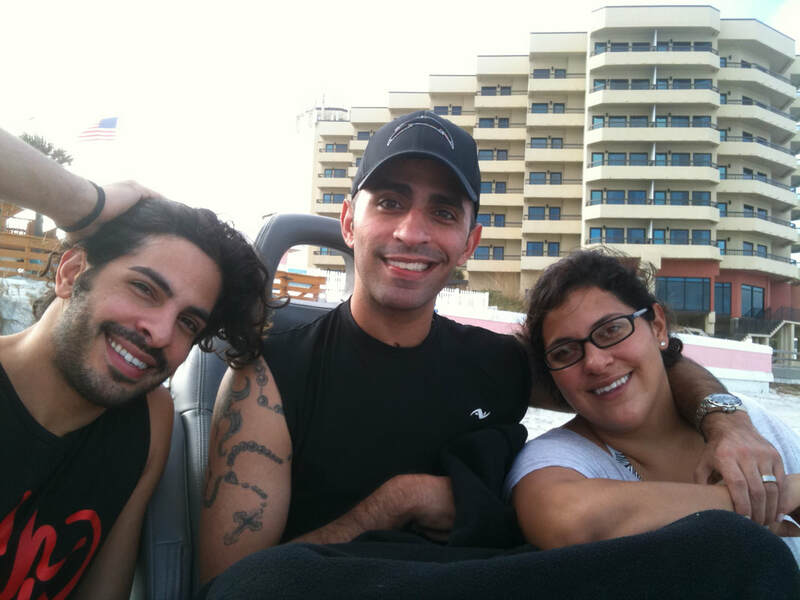 Eddy and Karina came the weekend prior to the surgery and took David on the boat with Justin. He was so excited to go. On Saturday we attended a beautiful healing mass at St. Augustine in Casselberry. After mass, on Sunday, at Saints Peter & Paul Church, Ms. Ann brought David a bottle with holy water from the grotto of Lourdes in France and told him that she prayed every day for him. Father Derk officiated the sacrament of the anointing of the sick and made a beautiful prayer over him. We were ready for surgery. Driving back from picking up my mother from the airport, the night before David’s surgery, Jorge called and asked that I hurry up coming home. When we arrived we saw David on the floor of his room. He had tried to get out of bed, held to the curtains and then fell on the floor. Unable to pick David back up into his bed, Jorge placed a pillow under his head, covered him and sat next to him on the floor until we got home. We laughed and thanked God that he had not been injured. David was so happy to see Mama Aby. They always had a lot of fun together. The next morning, we woke up at 3:30am and headed to the hospital. The surgery began at 7:30am and lasted about 4 hours and was successful. I stayed with David the first night and we barely slept. He refused taking any pain medication insisting he had no pain and never complained. 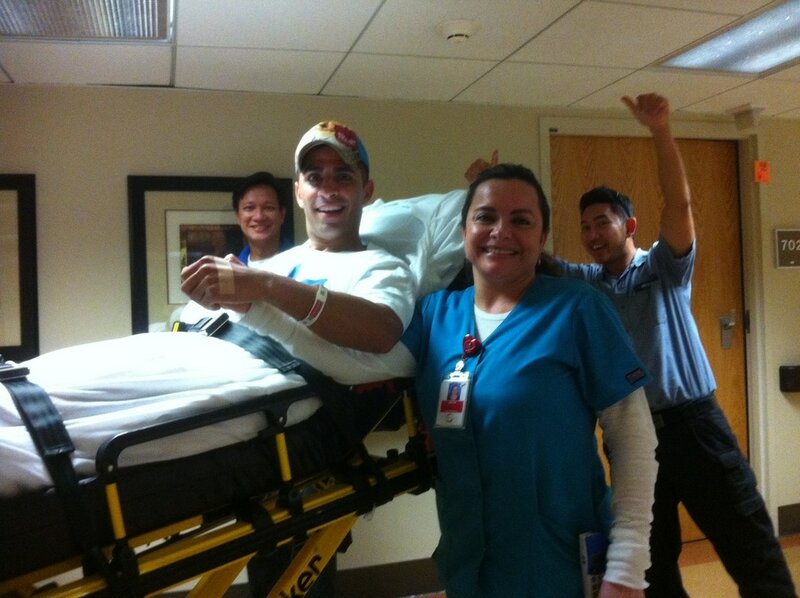 The nurses were impressed of his great disposition and joy. 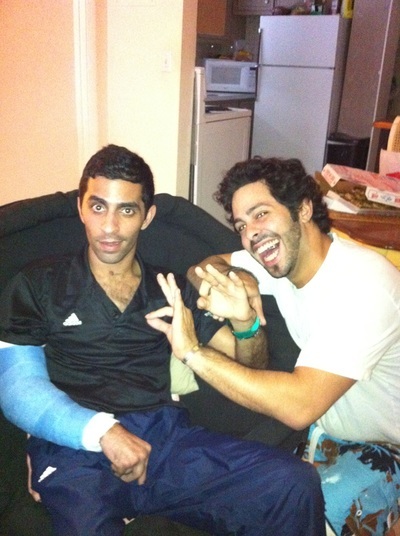 The following day, the hospital’s physical therapist came to train Fernando on transferring David. For a second I felt overwhelmed of the new challenge, especially because David not only had these huge frames with wires and bolts but also had exposed pins on each toe. 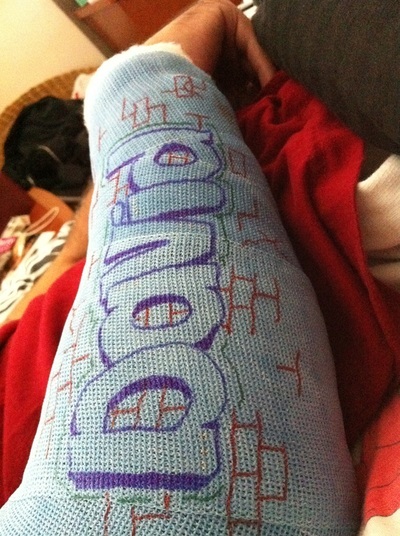 Fernando would stay the following nights at the hospital so that I could rest. The ORMC staff were amazing! The PT Mike recommended for David to go straight to rehab or to a nursing home for at least a week but it wasn’t approved so we made transportation arrangements to take David home on a stretcher. The staff at ORMC had been wonderful and we hoped they would be there when we would come back to remove the frames. We would be homebound for at least 4 months so we selected great books to read and to start off watched a magnificent DVD series my mother had sent us called “Catholicism” with now Bishop Robert Barron. We learned and revisited doctrines of the Catholic Church and marveled of the brilliance of the Universal Church. David began noticing crosses in the sky, on a fence, in clothing, even water marks on a window. It amazed us how he would notice and point out crosses everywhere. He was now crossing his arms and became more efficient using the IPad. During this time, Shaka would come home to give David a haircut because it was impossible to drive him around with the frames. The only outing we had was to and from doctors’ appointments and we had to transport him on a stretcher. David’s high school friend David LM. came to visit with his children and a few days later, his special friend Michelle O. visited him with her son Joshua. They hadn’t seen each other for over 5 years. He enjoyed the visits very much. David LM visited with his children. Michelle O. and son Joshua with David. New changes brought new challenges. We had no idea what tomorrow would bring but we knew Who would be with us every step of the way. On January 1st we went to church for the Solemnity of Mary, which is the celebration of Mary’s motherhood of Jesus and is the oldest feast of Mary in the Catholic Church. It was great to see our Sts. Peter & Paul family. 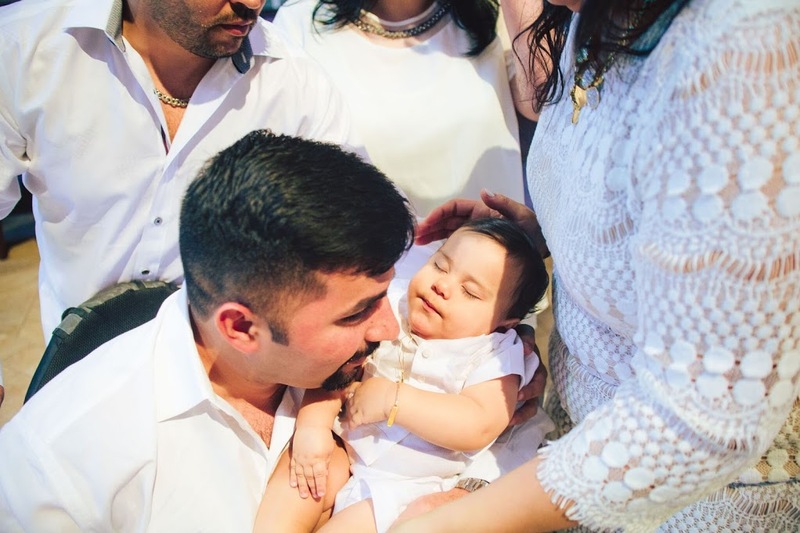 This spiritual family had been holding our family in prayer and their smiles and hugs were uplifting and telling of the immense love that reigned in their hearts. Uncle Carlos and Aunt Marcia came to visit the next day and were amazed to see how good David looked. David constantly repeated several words especially with Jorge. It was fun to watch them having a conversation. One day he voiced “ma” as he looked at me and I almost flipped of excitement. I loved when David and I would gaze at each other - there was so much that our eyes communicated - there was no need for words. I had gotten accustom to cherish silence. We started having walks around our neighborhood and enjoyed watching all details around us. It was such a great feeling being back home. At times when we would take our walks, David would ask to pray instead of listening to music. Every time all of us would be together we were grateful of having each other. David rejoiced at the championship jacket Fernando gave him after winning a National dance competition and told him he would dance for both of them every time. 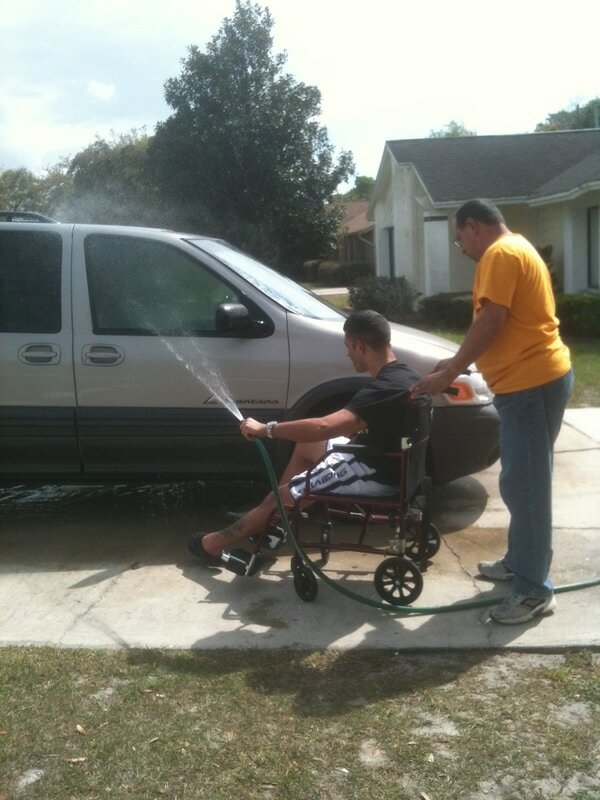 It was fun to watch David washing the van with Jorge. A spirit of gratitude emanated as we celebrated my birthday together. Ana Carolina surprised me with her visit along with Amanda and Jeremy. I had so much to be grateful for. 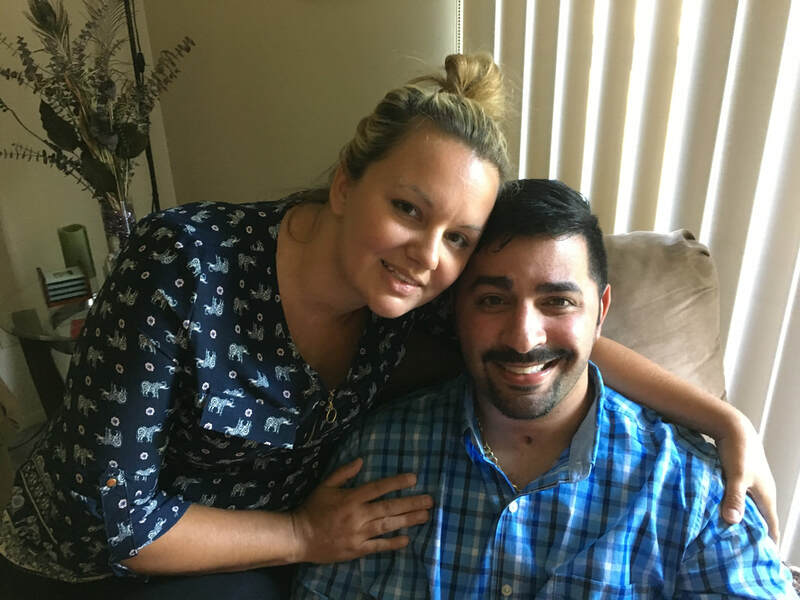 A few months prior to David’s accident, Eddy had met with friends Will G and Kristen T at a local sports bar and shared about oxygen therapy at their new business, Central Florida Hyperbaric Oxygen. HBOT is a conservative non-invasive treatment method in which 100% medical grade oxygen levels is returned to tissues in the body at increased atmospheric pressure. It nourishes all tissues and allows the body to heal itself naturally. For the holidays, they saw each other again at the same sports bar and were excited to offer the treatment for David. We knew it was another heavenly blessing. On Wednesday January 4th David went for his first oxygen therapy and did very well. As he lied down in the chamber, he watched movies and relaxed. I sat next to his chamber amazed and grateful for the opportunity of receiving this pioneering therapy. David would relax in the chamber. Gaby called it the Avatar therapy. Gaby would visit and spend the night to record his progress. 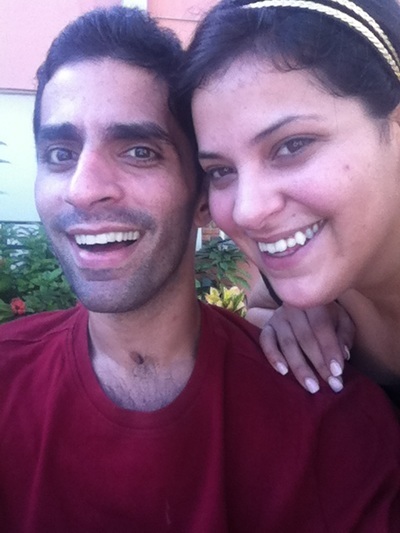 We were eager to learn what the road to recovery would take us. David’s spirit was great and he remained enthusiastic to every exercise or method or stretching technique that anyone would introduce. David paid close attention when Jorge talked to him about all the friends that came to visit him at the hospital and read to him every message from the notebook we had at the hospital and every card that the children sent him from the Saturday dance class. On January 11th Dan the contractor came to measure and draw a few models for the bathroom renovation to allow us to transfer David to the shower. This would prevent us from getting our backs injured and provide the area for David’s independence in the future. The bathroom remodeling had been another miracle. 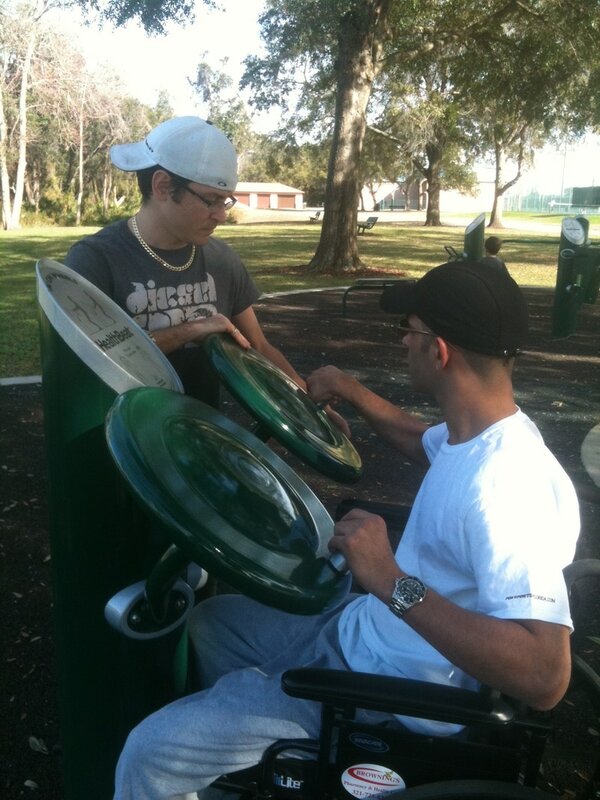 Federal funding had been frozen for this type of assistance but the Director managed to petition on David’s behalf and got all the approvals needed for the accessible adaptations. God had brought us home at the right time. Construction began at the end of February & completed in 2 weeks. Jorge, Fernando, Josuan, David and I had so much fun on our first trip to the mall. David had a banana split and observed everything attentively. He also loved grocery shopping. On one occasion, my mother and I laughed watching David and Jorge going from one aisle to another aisle on the powered shopping cart. Jorge and David enjoyed sitting at the front porch to practice the mini bike or at the back porch after dinner to converse. One evening Jorge proposed to him to start a business called “Little Talk Café”. As the conversation went on it amazed us of how David would use the whistle and repeated 4 words (bread, bus, pray and bye). We laughed so much as David revealed each one of our positions held at the business. 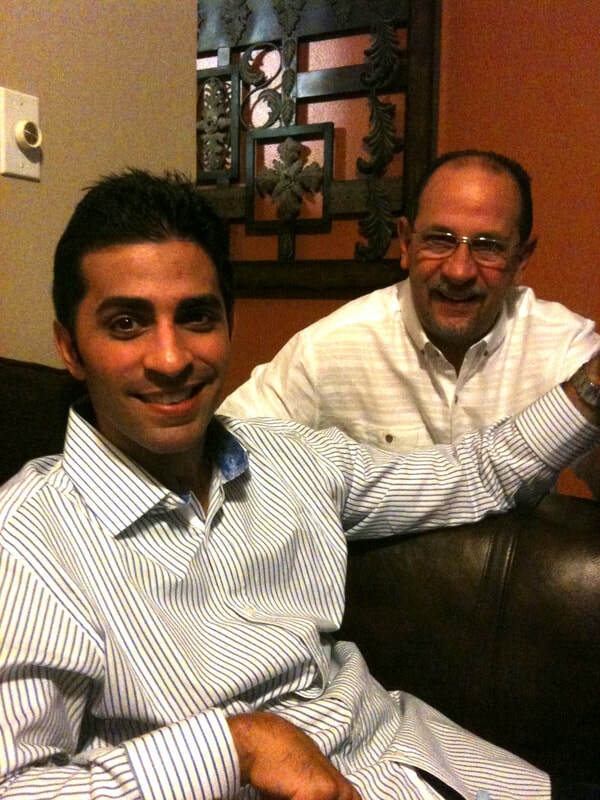 Jorge and David were the owners and David would also be the manager. I was in charge of the bread and when David would need more bread he would whistle. Eddy was in charge of Public Relations and would also be the buss boy. Ana Carolina was the singer and Fernando the dancer. Josuan would be the maintenance manager and grandmother Mama Aby was in charge of praying. It was obvious that David still had his great sense of humor. So much love continue to pour with loved ones visiting. Ana Carolina sent Valentine cupcakes from Ana’s Cakes with David’s favorite flavors. Cousin Alex, David and Chris S.
Justin Jr. and Chris S. visit brought great joy. David would enjoy listening to the stories of the countless canoe trips they all made on the Ecknolohatchee River. His reactions confirmed his long-term memory was still intact. Padrino Hector and my sister Noemy loved taking us to Cracker Barrel. Cousin Alex Javier played chess to bring back the skills. It was so much fun to have them around. 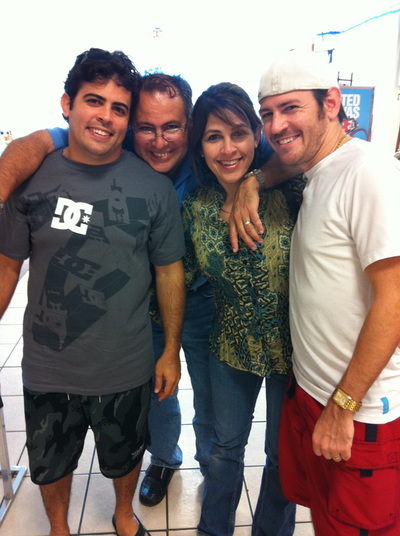 Jorge’s cousin Carmencita came from Puerto Rico to spend time with her daughter Pili and husband William. Their visit was enriching and fun. David enjoyed William’s company and a very unique brotherly friendship began between them both. 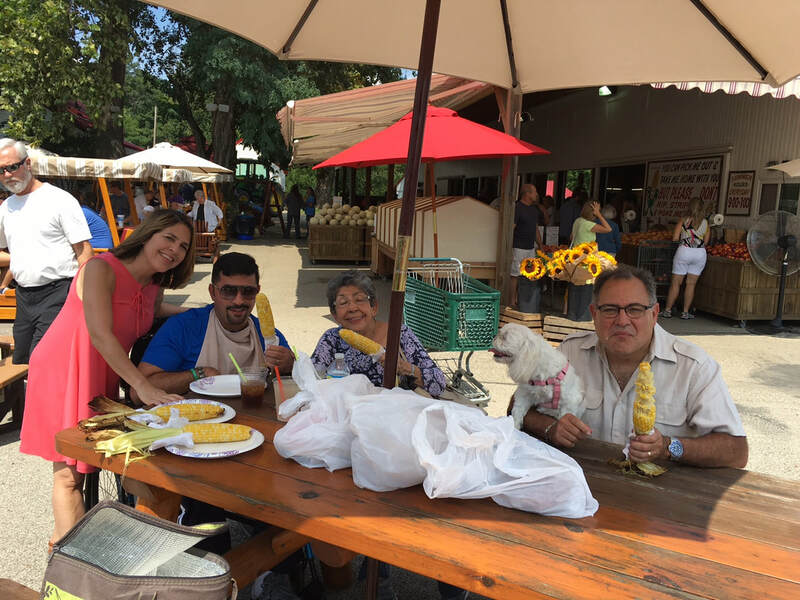 Jorge’s brother Joselo, wife Mireya and granddaughter Emily also traveled from Puerto Rico bringing their unique joy and laughter. My sister Lucia invited us to IHOP and was very impressed on David’s progress. Aunt Emilita’s visit was special and unique. She explained how she prayed every morning for him. 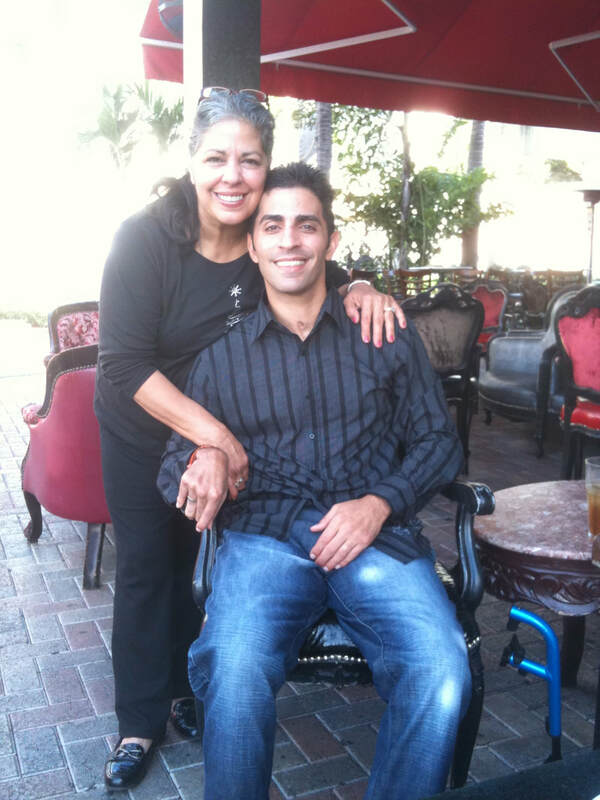 After meditating with David on his accident and how it was a lesson for him and all his friends, she instilled in him a force to work hard and overcome any limitation. Steven S, Chris C and his daughter KeeKee also came to visit. then on March 12th was a full house with special friends Chris S, Steven S, Rommy S, Irene P, John S and Frank R who brought back memories and old fun stories to David. Fernando, Frank, Steven, Ana Carolina, Chris, Rommy, John, David & Irene. Vince introduced David to the online talks “TED” which became one of his favorite things to do. Mama Aby spent some special time with us. We read, visit the lake and watched great movies including “Karol, A man who became Pope”. We learned that early in John Paul’s life as a priest, he had also suffered a brain injury and through prayer came out of a comma. David’s reaction was priceless when Gaby called to offer him tickets to the basketball game between the Orlando Magic and the Chicago Bulls. He was so excited. It was a special “Guys Night Out” with Jorge, Fernando and Chris S.
Brandon K and Zach came to visit on a Friday afternoon. David gave Zach's daughter a rosary to keep. It was such a joy to hear that Brandon had decided - as he explained - to “search for God”, on a five month journey hiking from North Georgia to North Maine. He recounted special moments in his life where David and him had shared, which had made things easier for him and had also created bonds that would always keep them strongly connected. We sent him off on his spiritual journey with the book “Making all things new” by Henri Nouwen and came together for a special prayer. 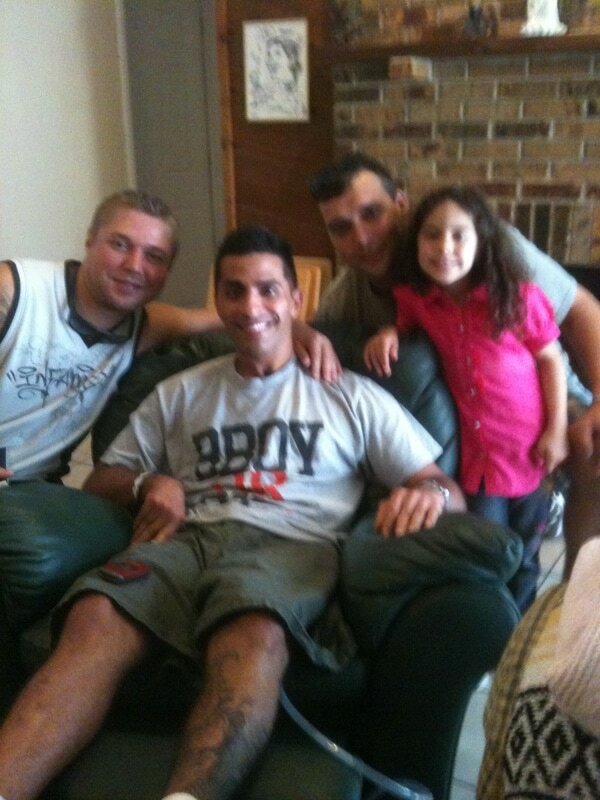 Brandon, David, Zach and his daughter. David became more involved in letting us know what he needed and wanted such as shaving, things to eat (cake), where to go (bed, chair, porch). He would be buttoning his shirt, turning off lights, fixing the bed, closing doors, watching over Calle (the cat) and was very aware of his surroundings. David was pointing at letters, birthday dates and holidays on the calendar and would say “Ana” clearly. He was now rinsing his mouth and spitting out. He was constantly trying to serve by emptying the dishwasher or loading the dishes, taking out the trash and carrying the groceries. One day he wanted to clean Fernando's tennis shoes that had dirt on them. He had a great spirit of service. Before each meal, each snack, each cup of water or coffee, David would close his eyes and prayed in silence. I had never been so aware of the wonder behind the blessings over meals as much as I did now. It reminded me of the story of St. Benedict of Nursia who always prayed a blessing over anything he would eat or drink. On one occasion, after blessing over a cup, it broke and the poisoned wine fell on the ground saving his life. 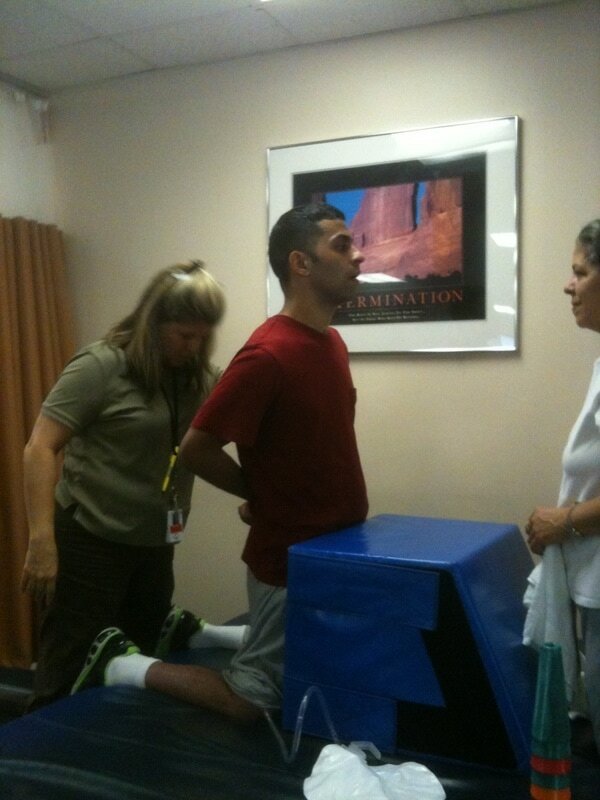 All therapies (PT, OT, ST) began on February 6th at Lucerne Rehabilitation. 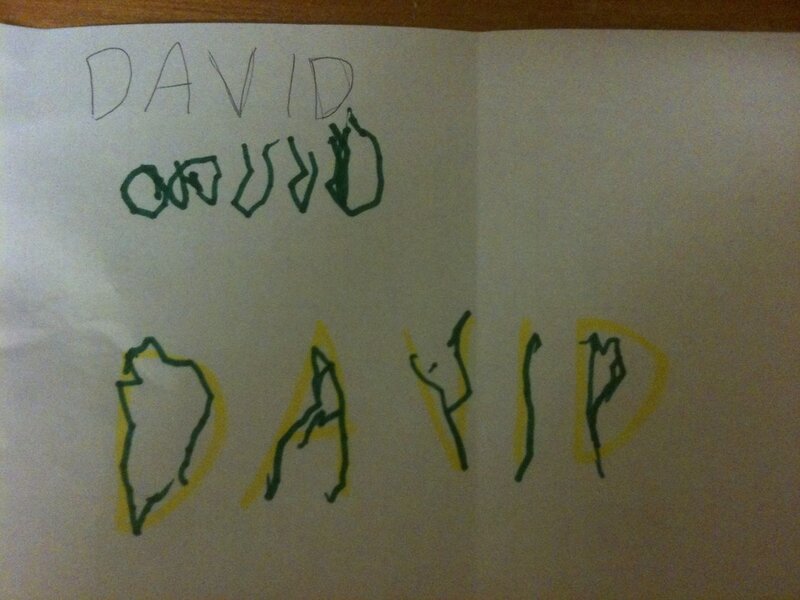 We learned that David was reading and writing his name at speech therapy. 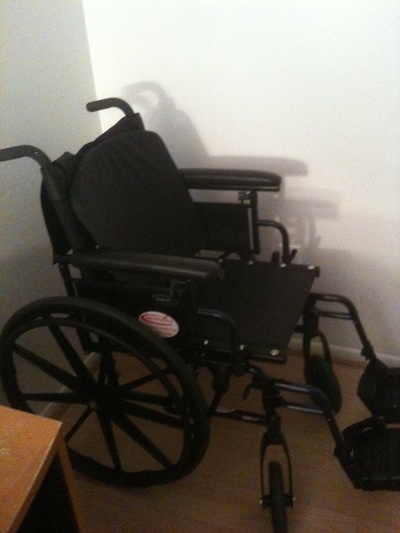 He was measured for a new wheel chair, for an ankle brace and for a standing frame. The physical therapist Brenda talked to us in depth about considering the Baclofen pump to break the tone on David’s legs. I continued to beg the Lord for Him to break the tone. We were open about Botox injections for the tone and considered getting the funding through a fundraiser. The pump was not what we hoped for. We also learned it would be a demanding journey but we were also committed for the ride ahead. We knew our Faith, Hope and Love was the fruit of not only God’s faithful promise and our Mother Mary’s constant intercession but, also the many, many, many who continued to pray for our endurance and fortitude. I understood how Moses was blessed with his community at the battle with the Amalekites, where Aaron and Hur held up his hands when he grew tired. Just as Aaron and Hur held Moses hands up, our family and friends were holding us up in prayer. There were numerous occurrences that kept reminding us we were not alone. One afternoon a young man dropped his bike in the middle of the road and ran to help me sit David in the wheelchair. We embraced and as I thanked him – he cried and thanked us. At adoration, we were given a scripture reading and the sacred heart novena, which we started immediately. As we were leaving from David getting a haircut, a man walking by said that as long as we believed, David would walk again. Jorge, Fernando and I turned around and said, “Amen, we believe”. When we saw on television Pope Francis visiting Cuba and celebrating mass, David became saddened because he couldn't take the Eucharist so we prayed to Jesus to come into our hearts. We spoke to Rose W, and she reminded us of God’s promises to take care of us. She also gave us the great news about Matthew making sounds at the nursing home in Miami. Matthew had been transferred with David to the nursing home from the hospital the same day with a severe brain injury as well. At a Sts. 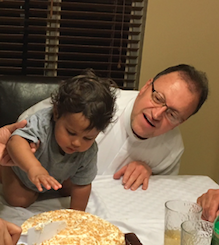 Peter & Paul’s King of Kings prayer night, Mr. Edwards prayed over David, Jorge and I and a profound joy invaded our hearts. As we walked through the Stations of the Cross, David became emotional and we came together in prayer. Through this time, I remembered how Dr. Sanchez looked at David at Jackson Memorial Hospital and with such a sad look on his face kept repeating to me the severity of his injury. Now all I could think was that if he could see David’s progress he would certainly believe in the power of prayer and the healing the Lord was doing in him. From the moment we entered our home on December 17th, a series of events and special moments were encapsulated in unique memories. The following day after our arrival, we celebrated Kimberly and Jorge’s birthday. It was definitely perfect timing. The next days, we sat to recall our time in Miami, as Kimberly would trim his hair or Jorge would prepare us his famous coffee. Before celebrating the end of the year, David was consistently responding with head gestures to yes and no and would say “Hi” to Aunt Flor every time she called. 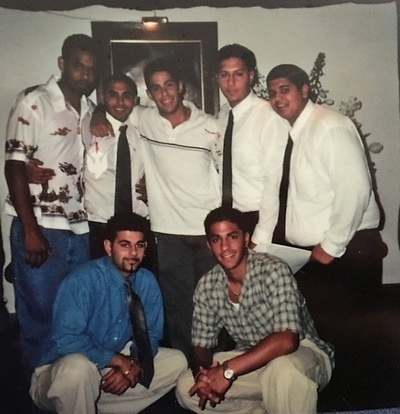 He enjoyed sharing time with Eddy, Fernando and Jorge listening to music, watching us sing, playing the maracas, listening to Jorge play the bongos or the drums and watching Fernando dance. David specially enjoyed when we would stand him up so that he could experience what it was to feel the rhythm and the urge to dance again. Music enriched us and invited us to dance all the time. for David and us as a family. The new doctor gave us prescriptions for occupational, physical and speech therapies; he lowered the high blood pressure dosage and discontinued all other medications. David was swallowing well and tolerating food and liquids skillfully. My mother called and told me to take David to confession. I phoned Father Fidel and we were so grateful that he was able to see us on such short notice. 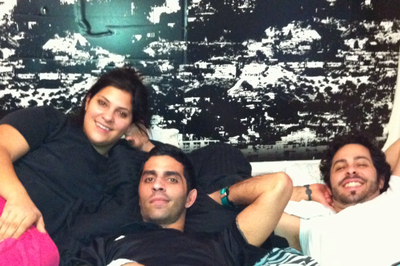 On Saturday, December 24th at 5:00 am, Eddy, Karina and Ana Carolina drove from Miami and showed up by surprise. Ana Carolina played Santa and brought tons of food and goodies for David. 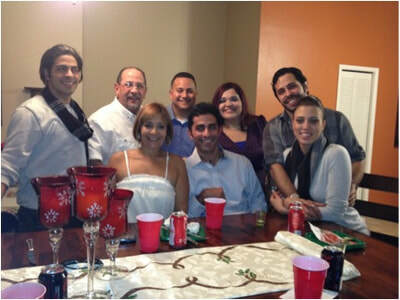 I cooked the traditional Christmas Eve dinner - arroz con gandules, pernil and pasteles – and we had a great dinner together. Later that afternoon dear friends Chris & Steven S, Sheila, Chris O and Chris C came to visit David and shared great times together. At night we went to see Christmas lights with Fernando and Josuan. Christmas Day was full of joy. 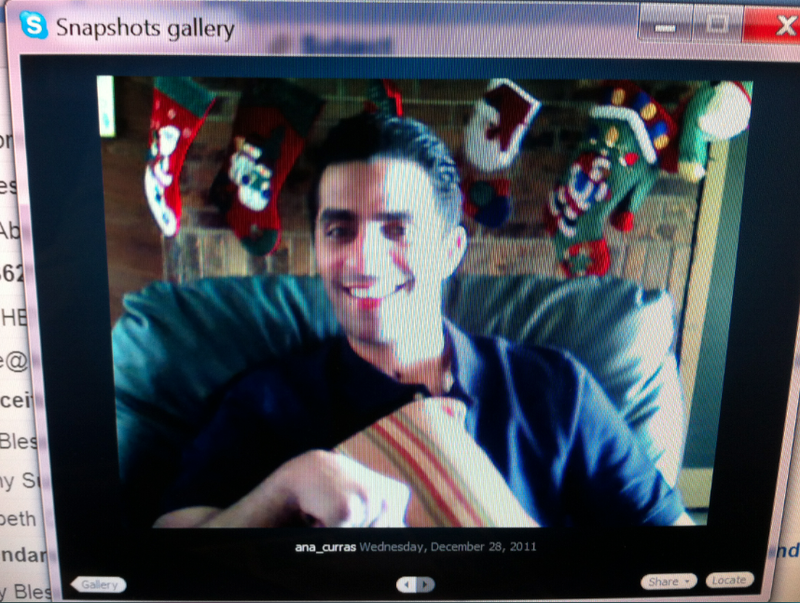 We opened presents, told stories and raised praises for the blessing of being home with David. 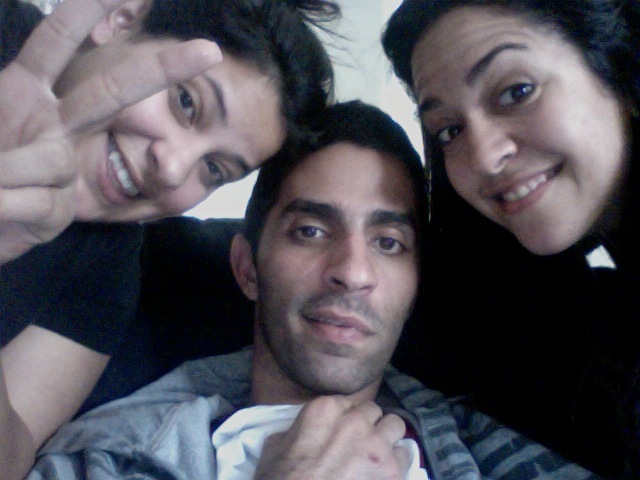 Eddy, Karina and Ana Carolina left around 2 PM back to Miami. An overwhelming emotion embraced us all as we walked together to church. David cried as he saw the Virgin Mary in the nativity display. As we approached to take Holy Communion together we could testify to the marvelous obliging of God’s divine plan to have his children participate in His Love. 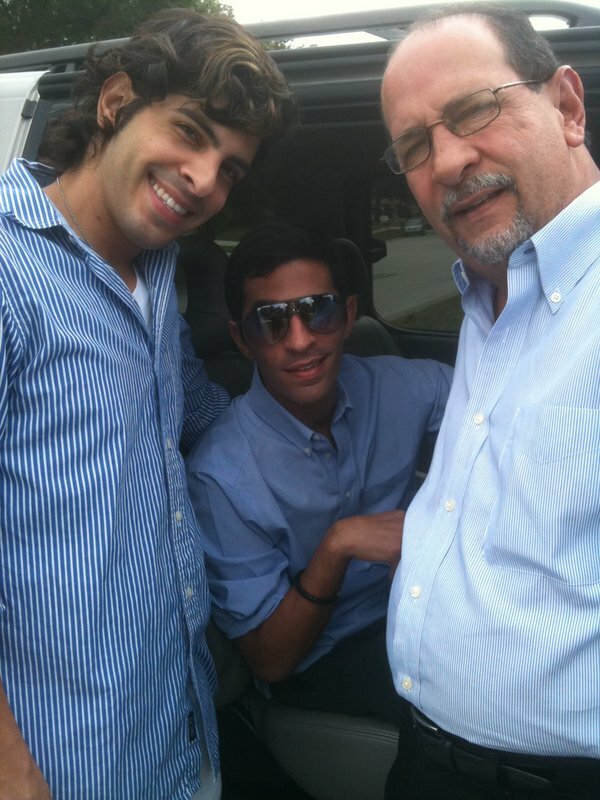 Jorge, David & I going to church. One morning around 5:30 am David was yelling calling me. When we opened the door of his room, he was half hanging out of the bed with the arm wrapped around the bed guardrail. He had been trying to get up. We asked David to restrain from getting out of bed until he would begin physical therapy and learn the safe way to doing so. Florida State’s BSCI area Director Larson called to inform us that David had been approved to receive additional funding for therapy. He would start in 2 to 3 weeks. Speech therapy was being coordinated with UCF. We knew God was moving the pieces. As David listened to old music one day with Fernando watching him clean his room, Fernando read a letter he kept on his desk, which David had written the year before. He wrote that he would always support and encourage him to pursue his dreams. He also repeated how he admired his talent and passion for dance. They both embraced and cried. David always encouraged Fernando to follow his dreams. Fernando then stretched and exercised his arms and legs and practiced to sign with his head to respond yes and no to different commands. 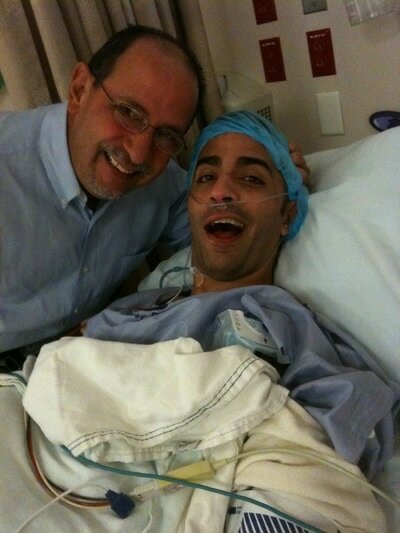 Eddy mentioned how Fernando would become very instrumental to David’s recovery and I knew this would be true. Dear friend Julie came to visit David one afternoon. finances – that He was in charge. We talked about God and His divine plan. She said that she had a dream about David on the stairs of the Lincoln Memorial site. “It was a better David being used by God”, she said. She mentioned how happy she was that we were home and with purpose and intention told David that she wanted to dance with him again. Her visit brought much joy to all our hearts. We had been blessed with financial gifts from family and friends all along. God moves hearts and their response made it possible for me to stay home with David. The next weeks were busy - skyping with family and friends, visits to the park and doing the wheel, pulling bench, mini bicycle and catching the ball with Jorge and teasing his dad with faking the throws. David was now spitting on command when brushing his teeth, wheeling his chair away from the table and blowing the whistle. We recalled Justin, the homeless at Jackson Memorial Hospital who told us that David would become a great speaker motivator in the future telling his story to many. We also remembered the many people who had been praying with the rosaries David had given them – recognizing David had already been on a mission before the accident. Special visits completed the year. Moses came to give David a haircut, Jonathan DJ and Brandon K spent time with him, which made him very happy. Then on New Year’s Eve cousin Michael came by to visit. We laughed as David gestured him with an old inner-circle Peacock salutation. Moses giving David a haircut. The peacock salutation with cousin Michael. Numerous loving and encouraging messages flooded our phones wishing us health, happiness, and hope. Each one brought a smile to our faces and affirmed their love with ours in a very special way. We were ready to welcome a HAPPY NEW YEAR! I hoped to remember so many signs, wonders and miracles we had experienced during the 7 months in Miami. During the next few days, David received many visitors John, Ricky, Tania, uncle Carlos, aunt Flor, cousins and others who came to say goodbye. On Thursday we gave Don Carlos, Stuckey and Andy the blankets that Noemy and Hector got for them. Their church in Ohio, St. Justin Martyr have a Prayer Shawl Ministry were they sew lap blankets as a “hug from God to those in need”. Not only are prayers said while they are being made, but after completion a priest blesses them. Stuckey was so happy to receive the blanket and Don Carlos could not stop crying. Many CNA's and nurses came to wish David a Merry Christmas and a happy travel back home. Jorge spent Thursday night with us and left Friday to Orlando in the van. He would pick us up the next day. Gaby, James, and doggies Lily & Clyde spent the night at Eddy and Ana Carolina’s apartment so that we could ride with them to the nursing home, wait for David to be picked up and drive together to the train station. I was so excited I barely slept that night. I was still in shock that we were leaving and going home. When we got to the facility at 5:30 AM they had David in the lobby in pajamas and a blanket because they couldn’t get to the clothes in the locker, so we ran to his room and got him dressed in a hurry before transportation would arrive. The physical therapist, Julissa came to say goodbye. She told David to work hard and that she would try to visit us soon. I became a little anxious, as transportation hadn’t arrived at 6am as agreed. I couldn’t fathom the thought of missing the train, which was schedule to leave at 8:00am. At 6:45am STS arrived and explained the delay was due to a flat tire and was able to quickly change it to pick up David. As we walked into Miami’s Amtrak train station, a violinist began to play. I thought, someone had arranged for this surprise. It was the kind of details that David would have thought of. I reminded David of the violinist he had arranged for me at my surprise birthday party at Segafredo the year before. Now the treat was for him. With tears in our eyes, we listened to her and watched her do a little river dance for David. What a perfect way to leave Miami. Gaby took pictures of every expression of happiness in our faces. It was hard to say goodbye to my sister Gaby. We had been on an emotional roller coaster together for 7 months with David's accident and the death of our father. It had been a blessing she had been transferred to south Florida as I remained in Miami with David. They lifted David up on the train and off we went to a new chapter of our journey. Ana Carolina, David and I had a great time on the train. We ate, napped, played and talked about all the things that were waiting for us back home. When we were getting closer to Orlando, David kept looking outside the window and sighing deeply as if he recognized the landmarks. Closer to the Winter Park station, he began to cry. Attendant Cassandra, who had learned our story came in and began to cry with all of us. She quoted Bible verses reminding us how much God loved us. Jorge was waiting at the station with a huge smile and as we spotted him we all cried again. We arrived around 2pm. Ana Carolina rode home with David on the Lynx van and I rode with Jorge. Ana said that as soon as they parked in front of our home David anxiously tried to unfasten his seat-belt. He cried from the moment they lift him out of the van and smiled all the way to his room. His eyes were full of joy when he saw Fernando, his cat Calle and our dogs B-boy and Princess. As a surprise for David, the doorbell rang around 7:30pm and as soon as he saw Kimberly walking into the house – his amazement and joy was obvious. About an hour later, Kimberly, Fernando and I walked outside to the front balcony and shared emotions and stories. We talked of how God's plan was amazing and how he took care of everything so perfectly. All of a sudden a group of about 20 people were walking down the hill in the middle of the street toward us. We didn’t know what to think of this. I couldn’t recognize who they were. They stood in front of the house and began caroling. This had never happened in the 15 years we had lived here. I invited them inside and without any introduction or explanation from any of them or us; they circled in front of David who was sitting in the family room. A young woman addressed him and said that God had a message for him. 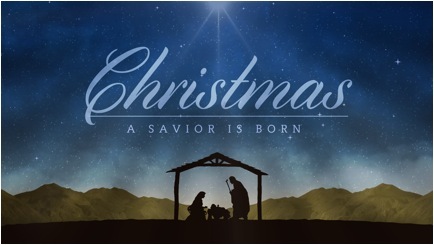 A gentleman recited a verse of the bible declaring, “there has been born for you a Savior, who is Christ the Lord” and the entire group began singing “Oh, Come let us adore Him”. There were Asians, Hispanics, Blacks, Whites, children, teenagers, young men and women and elderly people. Every culture and age was represented in this group who for the next 15 minutes took turns to recite bible verses and sang Silent Night, The First Noel and other Christmas carols. We were taken back by their warmth and joy. When I asked what church they were from, they answered they were from no particular church and left. We never saw them again. God was welcoming us home in His own special way. As we embarked a new path, we reflected on what we had learned so far. No human being could have managed to orchestrate in such a perfect way all the events in the manner they had been unfolded for us. It wasn’t about what fitted in our lives but how we lived fully our potential with what we had in front of us. Our days were not predictable but each day and moment became meaningful. It was about not fearing to experience new ways of doings things. We learned that by daring to open ourselves to God’s Will, He revealed Himself to us in ways unimaginable. We stopped guessing. We learn to pray about everything all the time. In the midst of suffering, we had encountered sheer goodness all along. And this became our best Christmas Gift. Maru from the State of Florida continued to call us with good news and kept referring to all that was happening as miracles. We knew who was really running the show. It was amazing how everything was coming into play in a perfect manner and at the perfect time. Things were moving fast. We all had our own projects to complete for David to come home. 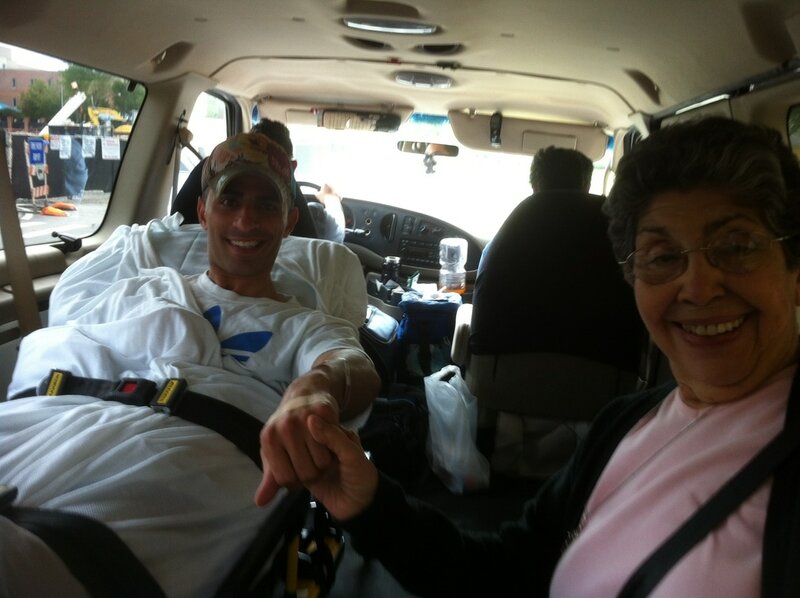 Jorge was coordinating to receive the medical equipment at home including a hospital bed and a lifter. 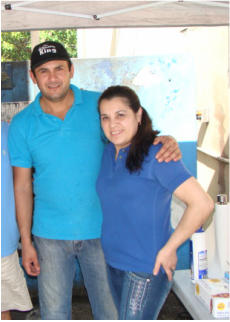 Fernando was painting and preparing David’s room. He drew on the wall a saying from St. Francis which read "So that I may be an instrument of your Peace". Ana had to go through and box David’s belongings to give to Jorge to take back home. Eddy was in charge of gathering all records from the hospital and to coordinate and update with key people of the new address so that we would continue to receive assistance. Every project had a timeline and had to be completed. We were all on a mission. Driving David home in my van was out of the question. Other transportation options ran around $2,000 for the service. We decided that David and I would travel by train because not only was it affordable but, they had offered us a suite on Amtrak at no additional cost and it gave us the option of laying David on a bed if we needed to. 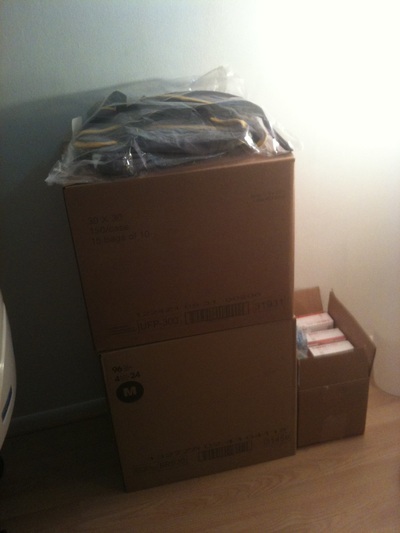 I was packing all my things and as much of David’s stuff as possible. We couldn’t believe it was happening. It became a bittersweet event. On one hand I was going back home with David, Jorge and Fernando and on the other hand my son Eddy and daughter Ana Carolina would stay behind. This event meant it was the last time we would see so many people who had become our community and our support at the nursing home. My aunt Flor, Uncle Carlos, cousins Christina, Kimberly, Catherine, Michael, nephews, friends would be 4 hours away vs. the closeness of regular visits and daily sharing moments. The next few days everything seemed a little different. Interacting with the residents from the nursing home had an unusual effect on me. I recognized how the culmination of my life experiences, the economic, the cultural background and upbringing had shaped my perception of safety, of fear, of justice, of privileges, of happiness and freedom. I also appreciated how my faith facilitated the breakthrough of hidden realities and aided me to embrace a truth I would have possibly not explored voluntarily. We had been placed to share our day to day with people with different cultural backgrounds, worldview and life experiences. We became the new strangers who somewhat would change their daily routines. We became the newbies who would have a story to share. We became the new catalysts of interaction and changes typical of newcomers. As “they” and “us” willingly opened our hearts - we became one in the same. We relied on each others smiles and greetings every morning. We worried; rejoiced and cared for each one we met every day. We went from strangers, to allies, to friends. This place had turned out to be the perfect temporary home for David. We began to share our excitement of going home with everyone at the facility. We also started saying our goodbyes. Goodbye to Dona Luisa and the walks at the patio pretending we were walking to her mother’s house to have lunch. Goodbye to Mr. John who had patiently waited for David to feel comfortable at “dabbing” or fist bumping him back. Goodbye to so many residents and CNAs, nurses, cafeteria staff and receptionists. We knew the hardest ones to say goodbye would be the therapists who had believed in David’s potential from the beginning and dedicated themselves to work hard with him week after week almost every day. When I said goodbye to resident Lesly at the computer room – he called me St. Theresa of Calcutta. I recorded this event in my journal, not because I believed I could be like her but because I thought much about her mission all along. She dedicated herself to strangers. What a true example and work of love, service and commitment and she remained faithful for so long. Her back must of hurt so many times and her legs must have gotten weak at times. She must have been exhausted but kept going with a smile in her face and the joy in her heart. I thought of how we are all called to this type of service. For every moment of my own suffering, extra effort, hard work, difficulty and act of kindness – I remembered to offer it up for souls and thought of how Jesus “thirst” for each one of us. As things were unfolding, I realized it had been 7 months since the accident. 7 months away from home. I told David that the first day at home, I would stay in my pajamas all day long. I couldn’t wait to sleep in my bed, sit on my couch, watch a movie in my living room with my family, cook in my kitchen and water my own plants. I also thanked God for allowing me to witness, every day, the signs, wonders and miracles in each of our lives especially in David. 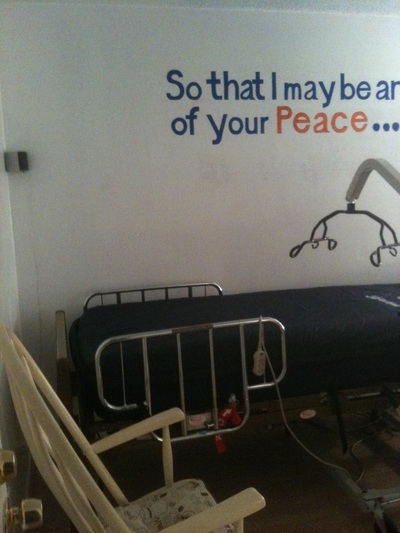 Nurse Rose reminded us that we would see God’s favors and not to forget His love for us. On Tuesday the 13th Ana Carolina came with cupcakes she had baked for David. I left to fill out the discharge paperwork. I knew once I signed those papers, David would no longer be part of the Jackson Memorial system. I had the confidence of moving forward and requested Friday, December 16th as his discharge date. I also arranged for transportation to pick us up on Saturday morning and take us to the train station. The plan was for Jorge to travel by train to Miami on Thursday, drive back to Orlando in my van on Friday and pick us up at the Winter Park train station the next day Saturday. Ana Carolina asked for time off at work and decided she would travel with us. We would pray and wait that all the official papers would be signed and ready for Friday. It all pointed as if we would be home for Christmas. I was opened to continue to accept God’s plans even if that meant we would have to wait a little longer but I had this hunch that we would be leaving on Saturday. Thursday came around and we still had no word on the approved paperwork. 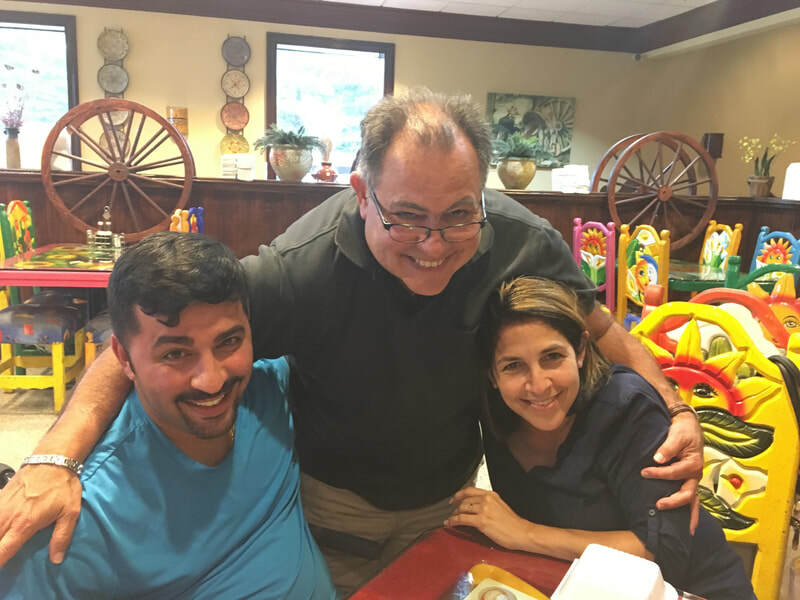 As therapists Julissa and Harold were working with David at the physical therapy room, Jorge called from the train station back home and asked me - for the last time - if I was sure that he should leave that day. The train was leaving at 1pm and we still hadn’t heard from Maru. I took a leap of faith and confirmed that he should take the train and not to worry. One hour later, at 2pm, Maru walked in the room, with her arm lifted up high and papers in hand yelling, “it’s official, you can go home”. We all cried. We were going home! We would be home in time for Jorge’s birthday and we would be home for Christmas. I called Jorge and the rest of the family and cried of joy some more. Maru gave us the details of this amazing miracle. She insisted that getting all the paperwork and all the signatures including those from Tallahassee, during the holidays was nothing short of a miracle. She then said David’s case had been the fastest turnaround case in her career. It had taken her 7 days to complete. The facility staff began to bring in copies of David’s records. Nurse Mrs. Carson trained me on administering David’s medications. It started to sink in. We would leave at 6:30am on Saturday and arrive home around 2pm. My cousin Kimberly had been on a special project of her own. 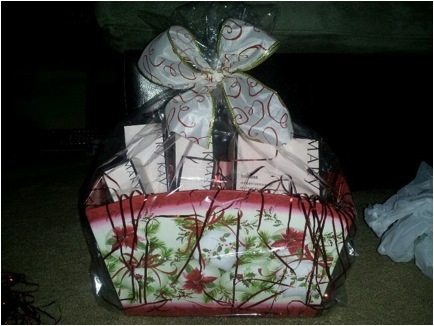 She had been pitching for donations and prepared Christmas baskets for the residents, which filled our hearts with joy. It would be a perfect way to say goodbye to so many special people. Christmas gifts for the residents. All of a sudden I remembered that back in August I had written in my journal - Jericho – 7th day – 7th month. As it turned out… it revealed a unique chain of events that would again show God’s plan. We were moving back to Jericho Drive, in a turnaround of 7 days, after 7 months. I would have never guessed what that meant back then but, now it made perfect sense. I looked up and smiled. We all have been given an inner force to build a specific project for the betterment of others. All these projects are intertwined with others in different manners. Some projects are built in a short time, others take a longer steady pace to complete and others are left undone because of the lack of perseverance, lack of sacrifice and lack of desire to pursue the mission that leads to victory and freedom. Incomplete projects lead to dissonance and disagreements, which consumes extraordinary efforts from others to take on additional responsibility and carry other peoples’ load. The completion of projects maintains the harmony between everything created. We have all been summoned to actively participate in the building of the Kingdom here on earth. Early the next morning David’s smile was so warming and revealing of his deep joy. I arranged to go back to Eddy and Ana’s apartment the next day. Speech therapist Stacy and her son Ryan came to work with wood puzzles and picture cards. David responded on command to every exercise. Later during the day Hector and my sister Noemy came by with beans and cheese “pupusas”, which are typical Central American stuffed tortillas. The following day, it was evident that David was excited to get to the apartment. For his surprise, the Lamourt cousins and Sue came and spent the day with him. He had coconut gelato ice cream, laid on his bed, watched TV and laughed just doing silly things. It was such a blessed time together. I would try to arrange and visit every Friday, Saturday and Sunday. 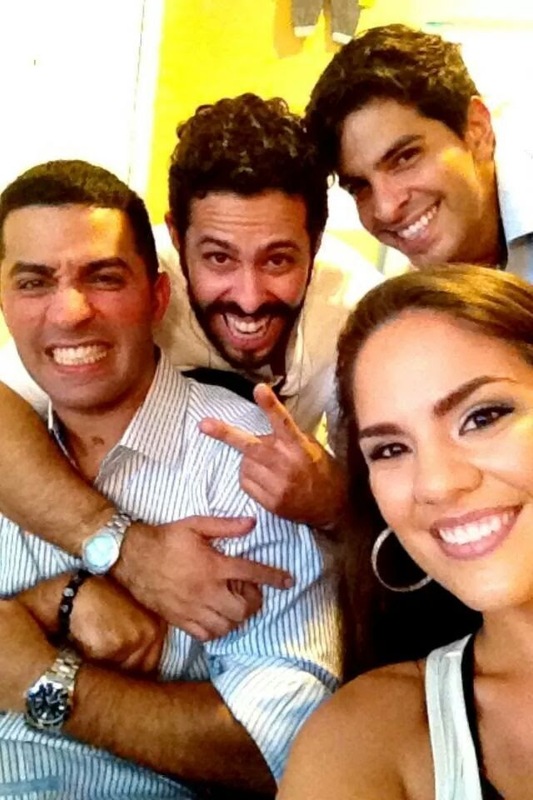 Alex, Hector Luis, Sue, David & Ana Carolina. Having some great fun together like old times. Back at the nursing home, I summoned up all the fun things we did that day and by the time we finished dinner, David gave me a real kiss. Wow – he remembered what muscles to use to perk his lips and kiss. There was wonderful progress happening within that we couldn’t see until it would be revealed with an external expression. That was a great way to seal the day… with a kiss. I couldn’t stop smiling until I fell asleep that night. A few days later, the therapist placed a cast on David’s right arm. He had done so well with the first serial casting, they decided to repeat the procedure to extend open his arm as much as possible. This would be done every two weeks. The facility had very little materials and hoped they would get additional supplies for the next casting. One of the calls I had made was to the Central Registry of the Brain and Spinal Cord Injury Program (BSCIP). 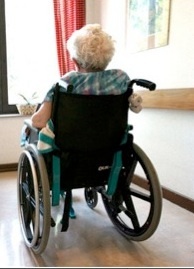 The program is managed by the Florida Department of Health and provides services, including assistance to injured residents to return to a community-based setting versus a nursing facility. One of the requirements to be eligible for services is that the patient has to be medically stable and have the ability to safely reintegrate into the community. 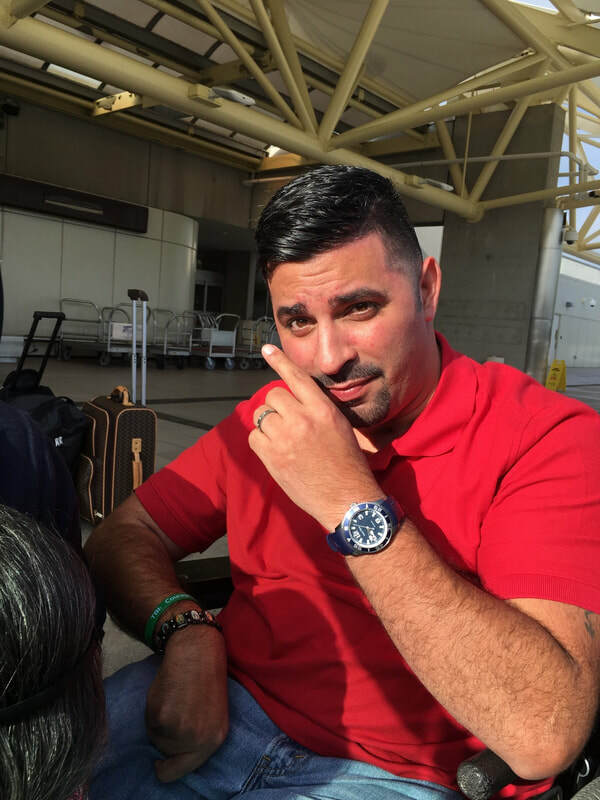 From the Miami office, case Manager Elio called me to set an appointment to determine if David was eligible for the program. I had great hopes that this would be the case because they would be the link that would help us take David back to Central Florida. Again we had all prayer warriors on their knees and I continuously reminded myself that God would allow only what was best for David. I thought that if we were given the green light from the Health Department and the Avalon Park would approve David into their in-patient program we were on our way home. At least I thought it was a good plan. The meeting with Elio was so uplifting. His assistant was a young man who was in a wheelchair and as I saw him pulling himself in front of the computer – I became so inspired of the opportunities available to people with disabilities. They both provided me with lots of information and resources and immediately had the entire paperwork ready to be sent for approval. 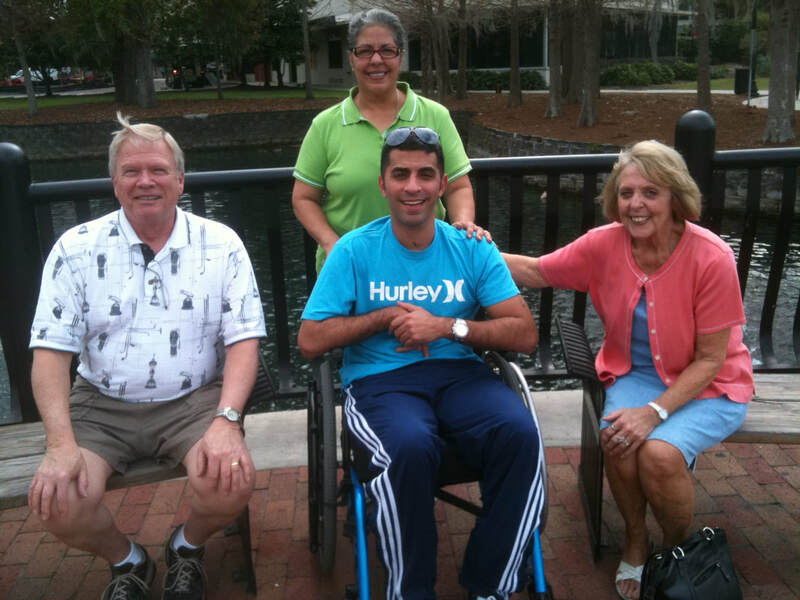 Elio then referred me to Kim in Orlando, a spinal cord injury survivor and case manager who mentioned the benefits of moving David back home. If David would become eligible, she would be contacting me to begin the process. Change was in the air and I was taking it all in. We didn’t know the how, the when and the where but - there was definitely change happening for us - and it was exciting. Every day I waited for the call and prayed it would be the right step at the right time. 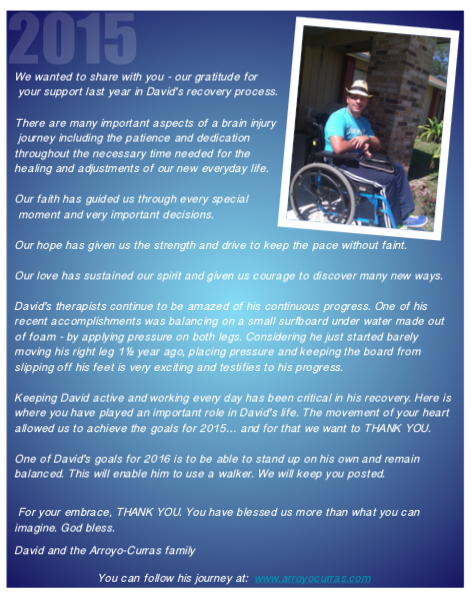 We felt so blessed with the care and therapies that David was receiving at the facility. 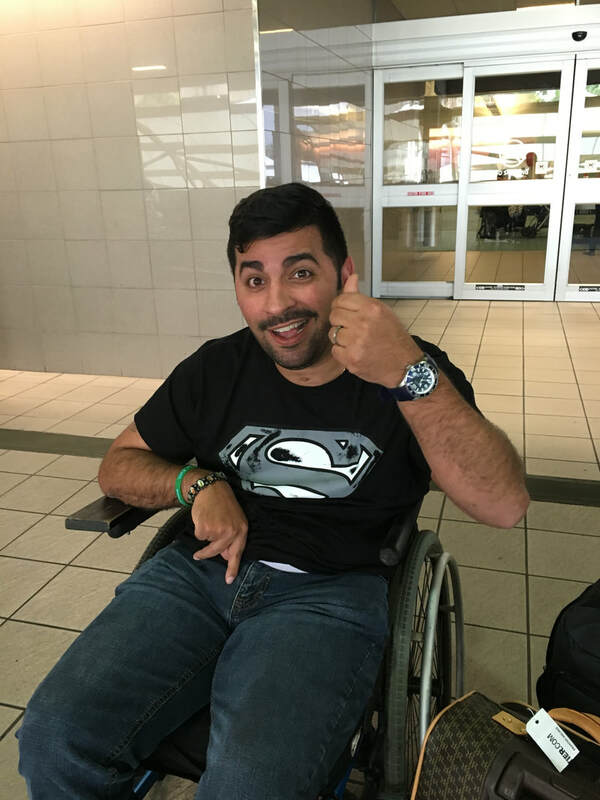 The residents, nurses, doctors, therapists became like family to us and we wanted to ensure David would not be left out from the support and services he needed back home. Tuesday that week, while David was working at physical therapy, the Avalon Park director called to inform me that the team did not consider David ready for their program and said he would be visiting mid December to re-evaluate him. As the therapists expressed how sorry they were to hear the news, a peculiar peace invaded my heart. I was reflecting on the news when I received another call - this time from the case manager from the BSCIP to inform me she would be visiting us the following week for an interview. 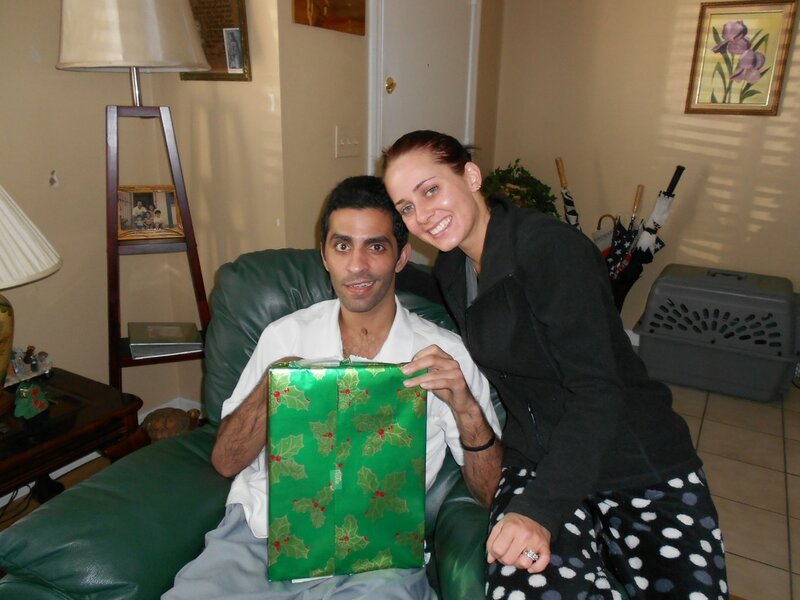 She also said that taking David home and receiving outpatient therapy would be very motivating for him. I saw doors closing and others opening – God was allowing this for a reason. It had to be Him placing all the pieces in the right position. I chose not to have any expectation and continue to watch the Master unfold His divine plan. He was showering me with His peace so I would not despair but rejoice at His doings. We were moving forward. We went back to our calendar poster in the room and tried to guess what day we would be moving back home. We agreed that December 18th would be a great birthday gift for Jorge. 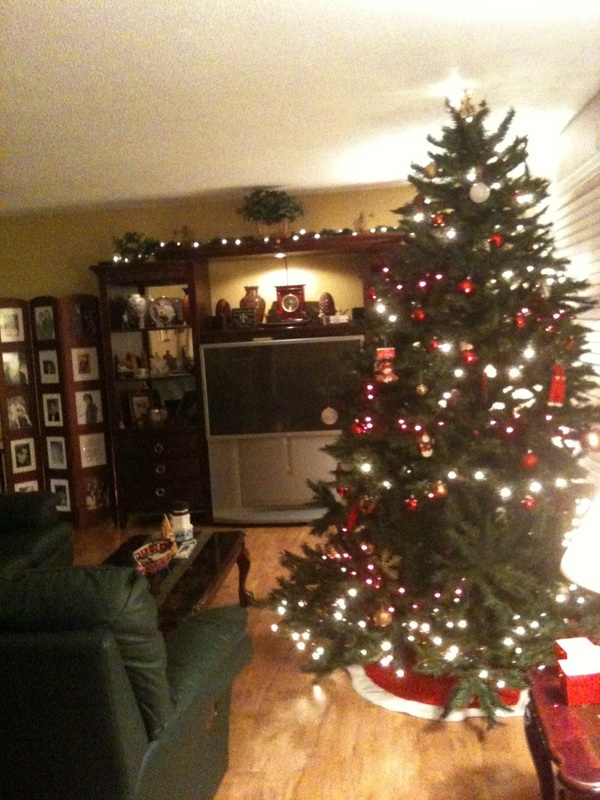 I just hoped that we would move in time to celebrate Christmas at home. Ultimately it was in God’s hands. He would know which was the right day. As I was getting ready to leave, David began to cry. I recited that God’s plans for him was for peace, that God was listening and that we had to plan for our trip to Portugal to visit the Shrine of Our Lady of Fatima. As I leaned to kiss David good night, he gave me a real kiss again. The social worker at the nursing home worked with the State about the possibility of transferring David back home and was constantly updating us on the process. I signed the paperwork for the transfer and now it was a matter of waiting for all the approvals to happen. The Lord had a plan and nothing was going to stop it from unfolding. Nurse Carson reiterated that the Lord would reveal the right time to leave. Nurse Rose gave me Deuteronomy 8 to read. Nurse Rose was very close to my heart. From the moment she started working at the facility we clicked. She was a woman of faith and it amazed me to listen and watch her walk in obedience to God’s will. Even though she had no plans or desire to move from her job at a local correctional, circumstances brought her to the nursing home and she accepted the reality - not knowing how much God would use her with us. She would enter the room singing gospel music with her beautiful voice and always had a scripture to share. We developed a beautiful relationship. We became spiritual sisters. David always smiled when she would come to see him. Every morning on her scheduled working days, I would feel relieved to see her burgundy truck parked. I would be anxious to learn what the Lord would say through her every day. After being absent for a few weeks, Nurse Rose returned with a heavy heart for she had lost a son to a bacterial infection. Her pain became my pain. With tears in her eyes, and with an inspiring zeal she made known to me how every word of encouragement and hope she had shared with me throughout months had all come back to her throughout the agonizing moments as her son was loosing the battle to the infection he had contracted. She emphatically explained how the Lord had prepared her in the course of our talks without her knowing what she would face in the coming months and sustained her with love, as a caring father would do. She was back to continue the work of love through serving all of us and caring for our loved ones - with the same joy and songs of praise. My faith was strengthened through her example of fervor and perseverance. Meanwhile the therapists placed a cast on David’s left foot and kept mentioning how his arm progress was miraculous because they had no other explanation. It was not pressuring against his chest anymore. We continued to go to Eddy and Ana’s apartment every Friday, Saturday and Sunday and spent time with family who continued to shower us with their details of love. Elio from BSCIP called with the good news that the transition program would cover 90% of the costs. God continued to repeat in different ways that we were not to worry about financial burdens and that He was in charge. 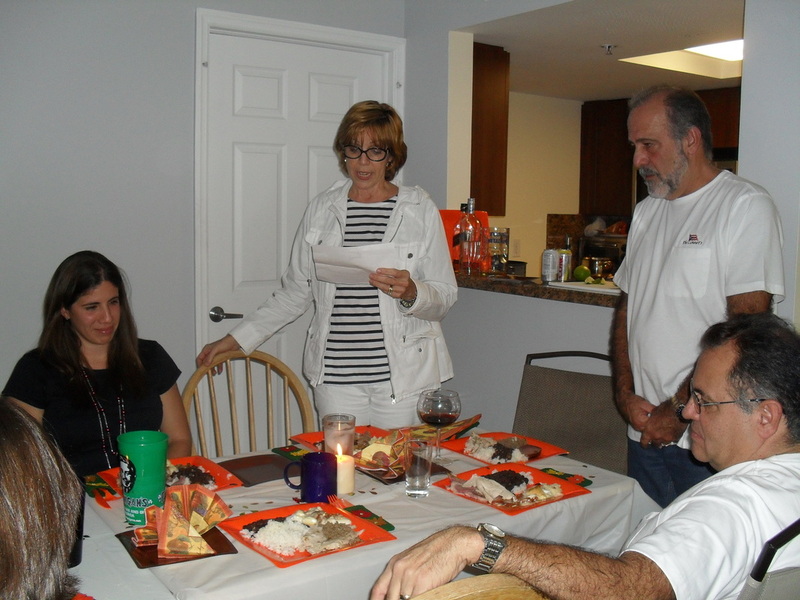 We continued our prayers of thanksgiving all the time. On Wednesday, December 7th we met Martha from the State of Florida. She proceeded with the interview and paperwork to take David home through a waiver, which would provide links to initiatives and various services at home. Her demeanor was refreshing and uplifting. She took the time to answer all our questions. She couldn’t guarantee any dates because we were heading into the holidays and this would delay some of the process but promised to work hard and complete every step as soon as she could. The next day Martha called to inform us that a few miracles had happened to her and that it was not a coincidence that the people involved in David’s case were the right ones. When she placed a call to the case manager line, the person who answered was the one who had originally interviewed me over the phone months ago. 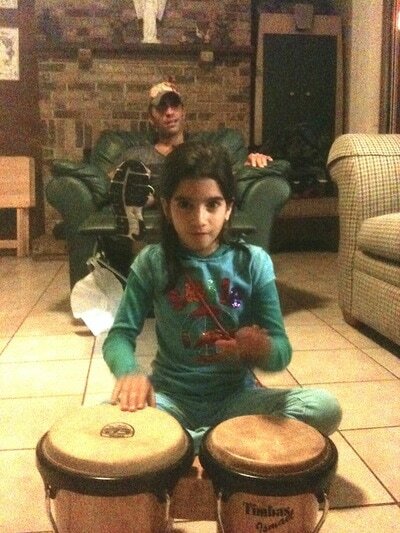 She remembered our conversation and mentioned that my husband played bongos at church. She indicated to Martha that she would expedite David’s case. We were overwhelmed with joy with all the good news. God was at work and it was wonderful to see it. That night David gave me 3 real kisses. I told him I loved him and asked for him to practice saying “Hi mom”. The reading for the day said not to worry about the future. We knew God was running the schedule. The Lord always fulfills His promises. He calls upon his people to work out His plan. For God - a promise and fulfillment is one in the same. When your trust is in the Lord, hope does not disappoint. The Lord and Our Lady were carrying us in their hearts and that is why we experienced peace throughout this time of so many changes. Cousin Alex Javier and Gaby visited David and were amazed to see him feeding on his own with little assistance. I kept thanking the Lord for the graces and the peace we experienced all the time and thanked Our Lady for always protecting us. On the Monday of Thanksgiving week, the Avalon Park representative came to evaluate David. To every command David responded like a champ and stood up twice and sat down on his own. 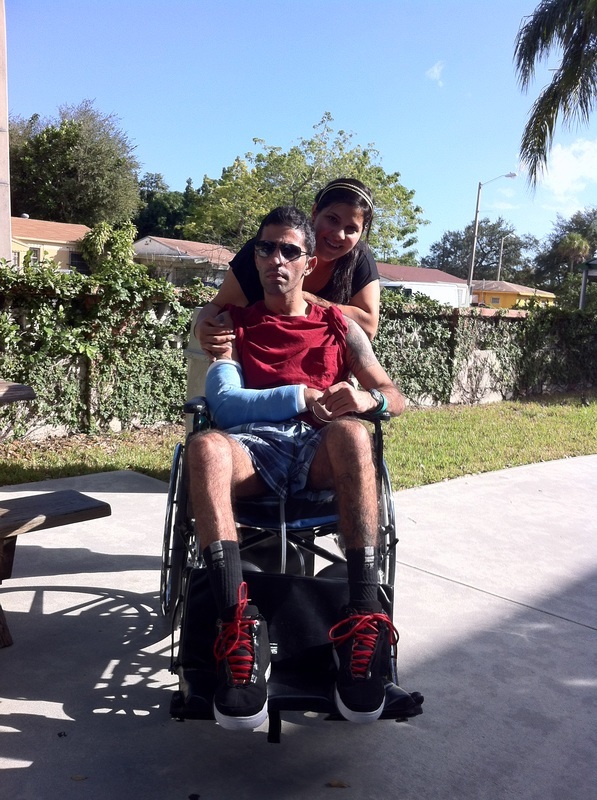 Julissa talked to him about David’s progress. He mentioned that David was ready for rehab and that he would contact us with information on the program. I felt grateful that he had not been able to make it before. At that moment I realized that it had been a perfect day for the evaluation. God our Father kept saying not to fear and to trust him all along. I had to remember not to dwell into fear, because it would confuse and deceive me to believe the Father has abandoned us. That is a tough temptation to resist because it draws us away from God by loosing our faith. I just needed to open my heart and not fear during the “waiting” time. The next few days David was in deep thought. He remained still and quiet. The new speech therapist, Imbal, was pleased with David’s disposition in learning how to spell by dragging letters into place on an Ipad. Eddy L. came to visit and made David laugh with an inside joke which he understood and I rejoiced for that moment of encapsulated memory. He left several movies for David to watch. Many of the residents had left to be with family for the weekend so the facility was pretty empty. I had arranged, signed all the paperwork and coordinated the transportation for David’s first trip to Eddy and Ana Carolina’s apartment the next day. We were all anxious for Friday after Thanksgiving to arrive. 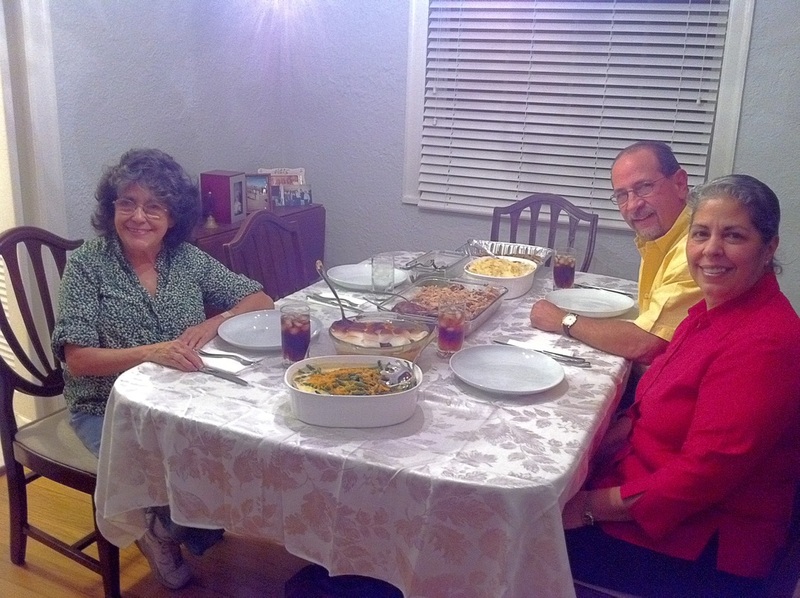 In the meantime, Aunt Flor had Ana Carolina cook at her house and together prepared a special feast. 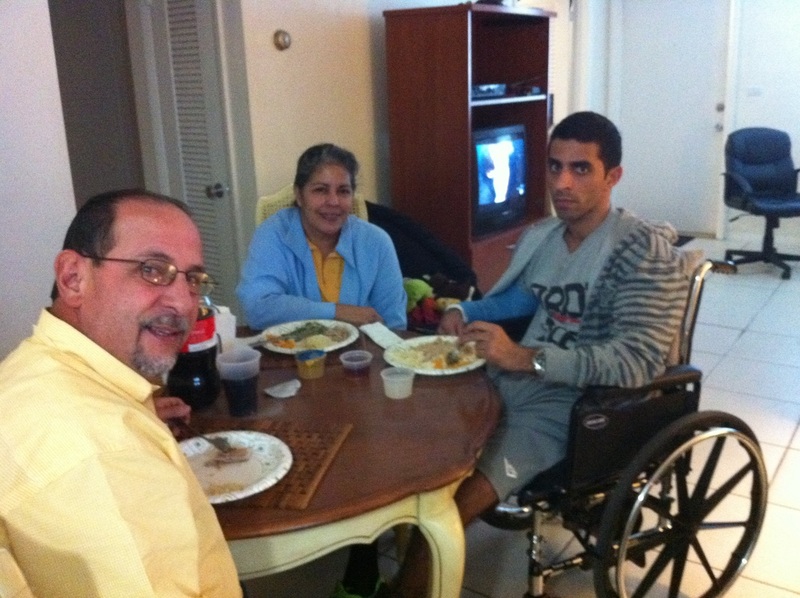 Noemy had prepared another feast at her sons’ Alex Javier’s apartment. Noemy prepared a feast at cousin Alex's apartment. 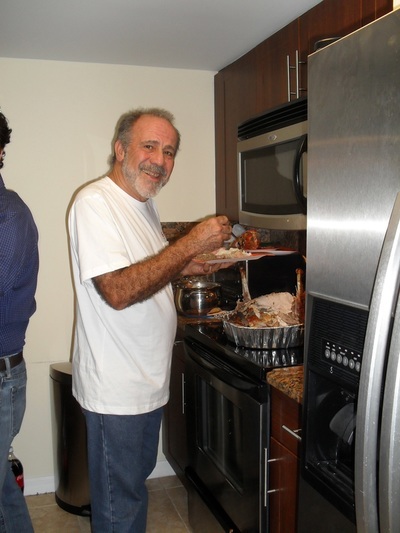 Back home, my son Fernando cooked his first turkey as well - along with Josuan (dad’s personal assistant), who remained at home helping with the dogs while Jorge would travel back and forth to and from Miami. It was the first time in over 30 years that I would not cook the special “pavochon” or turkey. Uncle Hector and cousins Alex Javier and Hector Luis visited before joining the rest of the family for the Thanksgiving banquet. 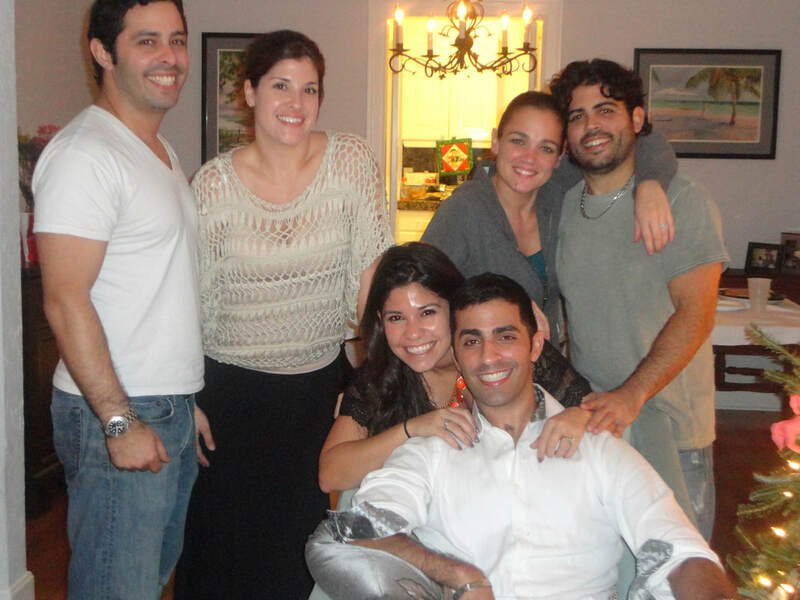 Visiting from Puerto Rico, cousins Cristina and her husband Chemi also came to spend some time. Cousin Cristina and husband Chemi came to visit David. For lunch, Ana Carolina brought David his own feast. It was her first turkey and it was amazingly delicious. While they both celebrated Thanksgiving, Jorge and I left to have dinner with Aunt Flor who had prepared so many delicious plates. Aunt Flor cooked a delicious Thanksgiving dinner. Afterward we went to join the rest of the family at Alex’s. I continuously gave thanks to the Lord for family. What a blessing to re-energize with the warmth and love that family can offer. The next morning I arrived at the nursing home to find David dressed and ready to go. The smile in his face was telling of the excitement of a new adventure. The staff was as thrilled as we were. They asked me to take pictures for them to enjoy later. The special van loaded David on the wheelchair and locked the chair into special hooks on the van’s floor. I sat upfront at the passenger’s seat. I kept looking at David to make sure he felt secure. He just held a smile as he looked out the window during the entire ride. We arrived around 11:30am. Jorge was already there. Eddy and Ana were waiting and their smiles expressed their joy of having their brother be out for the first time and spend it with them. After he was brought down and in to the apartment, we all hugged and cried. It felt unreal. We were having a moment together. 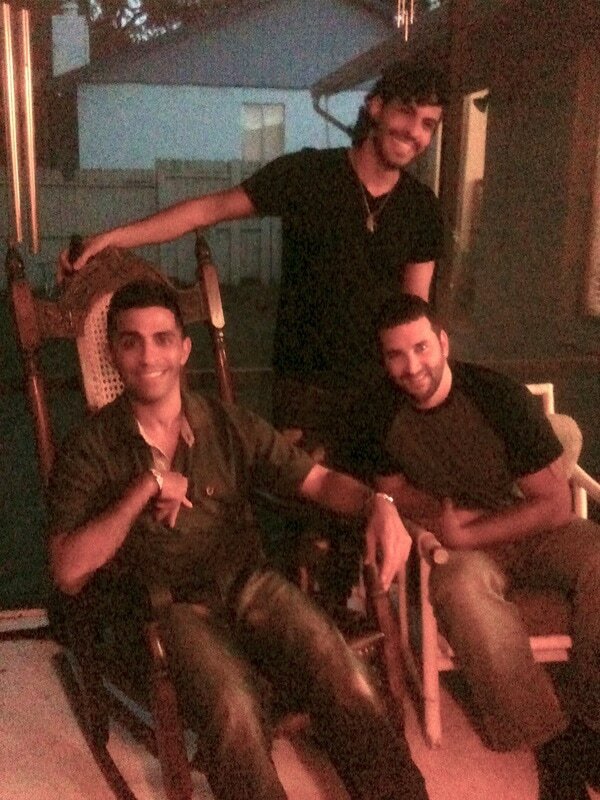 Eddy sat David on a papassan chair with his legs up on an ottoman. We had the traditional leftover Thanksgiving lunch and David observed and listened to everything attentively. Jorge, David and I having lunch at Eddy & Ana Carolina's place. Ana Carolina showed him his safety box where he kept all his belongings and he immediately knew what knobs to turn to open it. Jorge and Eddy played with a remote control mini helicopter, we skyped Fernando and laughed at his turkey cooking experience. We told stories, made funny faces on the computer and laughed together like we had not done in 6 months. It was a special time we would cherish. Transportation picked us up around 4pm and off we went. We would do this again on Sunday and already couldn’t wait. 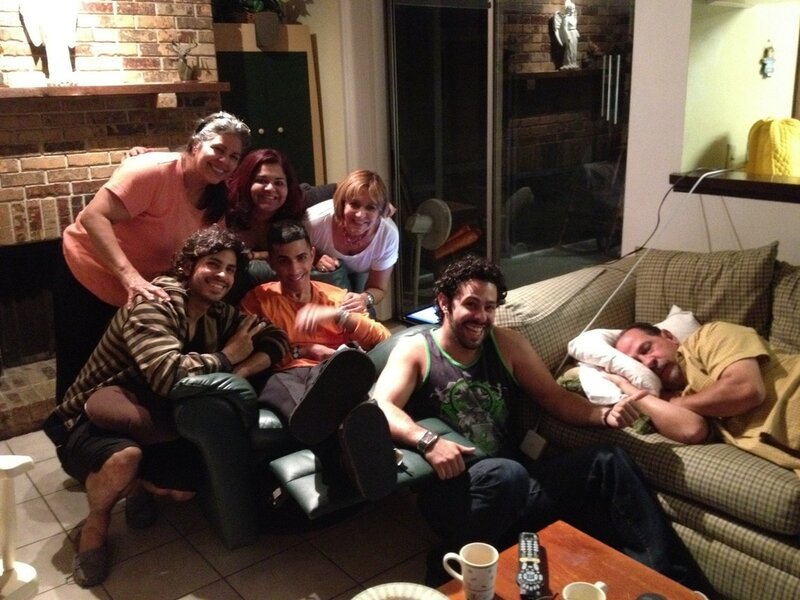 David’s smile never left his face until he fell asleep that night. Our Thanksgiving meant a special time to honor God and thank him for all His blessings. We were so grateful for being together. There is nothing like family. And it has nothing to do with spaces. It has everything to do with each others presence. One of my calls was to a dear friend and former supervisor Martha who suggested I look for a neurologist in Central Florida and ask for recommendations for places close to home. And so I did. I learned some facilities would not take David because the time allotted for acute rehab had elapsed or he had used all the time authorized by the insurance. Other places could not accept David because according to policy - he was too old. 27 years was old? Health insurances and assistance providers separate the benefits into 2 primary groups: the group up to 18 years of age and the group over 18 years of age. For the system - David was considered old to receive certain rehabilitation benefits. This was mind-boggling. Now the journey became challenging. Finding a place for David that could offer him the medical benefits he needed was not an easy task. 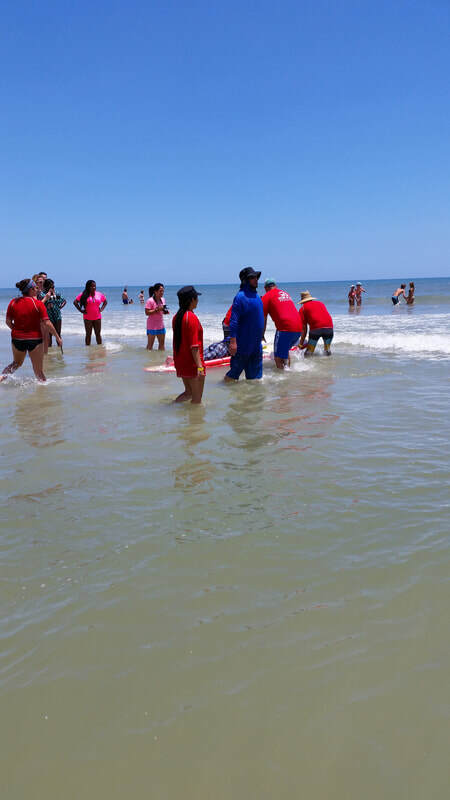 The Director of one of the rehabilitation centers in Avalon Park called to schedule a visit. I looked forward to it and we all hoped this would be the facility God would guide us to. The place looked beautiful on the website. The rooms were well furnished; it had a pool and many different activities as part of their rehab program. It was only about 30 minutes away from home in Casselberry. In the meantime, David was becoming more alert and would sleep less during the day. There was something different about him which I couldn’t pin point but there was an unveiling happening and I could feel it. His therapist Stacy would continue to introduce a variety of food that included meatloaf, rice and macaroni. 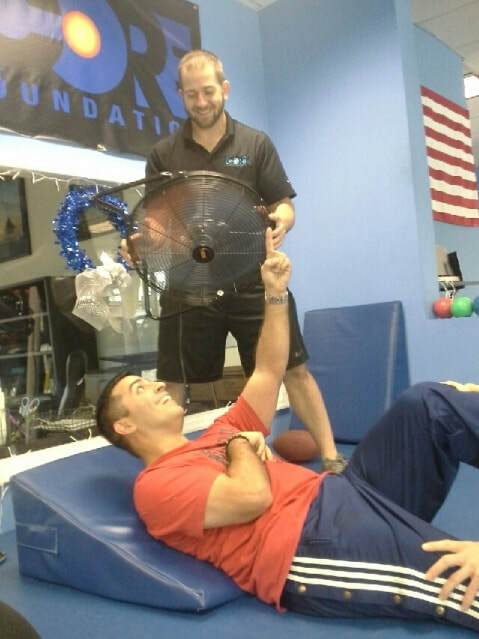 David’s endurance at different exercises during physical therapy continued to grow. He would initiate the routines, follow commands, worked hard at standing up and tried to eat on his own. He would have to learn how to manage everything with his left side. David’s right side had been seriously affected to the point where there was barely any movement of his right leg; his arm was bent from his elbow up, his wrist curled in and fingers firmly closed to his palm. His arm would place so much pressure against his chest, we had to constantly monitor for pressure sores. We continued to be held by prayers from so many and blessed by the act of faith by others. 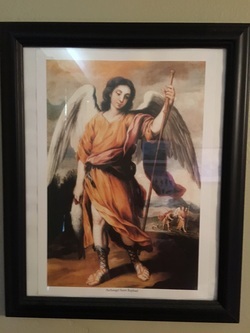 A dear friend of my mother, Aguie , had sent David a picture framed of St. Raphael the Archangel, who in the Christian tradition performs all manners of healing. A relic of St. Padre Pio in Italy had touched the picture frame. Another friend of hers, Vito sent David 2 medallions from his visit to the Saint Ann’s shrine in Canada. He shared the miracle of a relative who in the past had walked after visiting the shrine. 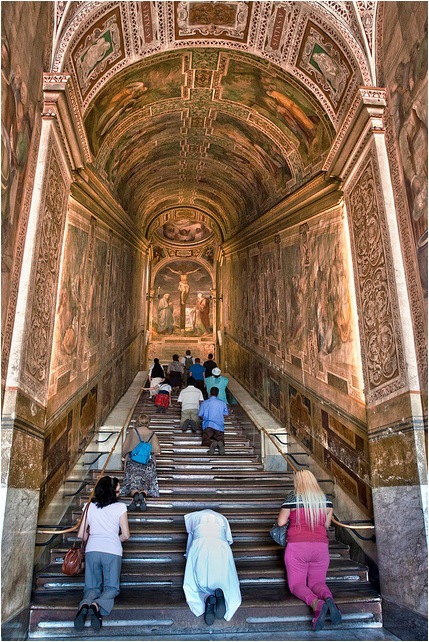 While in Rome, Gaby mounted the Holy Staircase or “Scala Santa” on her knees, praying for David. The holy 28 marble stairs are reputed to be those walked up by Christ on his way to trial before Pontius Pilate. The staircase was brought to Rome in c.326 AD by St. Helena, mother of the Emperor Constantine, who was a pioneering collector of relics. Holy Staircase brought to Rome in c. 326 AD by St. Helena, mother of the Emperor Constantine. Special visits continued to bless our days, Zi came to cut David’s hair again and had a fun time listening to his stories. A long time friend from high school, Jonathan and his wife Luisa also spent some special time with David. The “Sandwich King” cafeteria owners Gustavo and Lily also visited and told David how his sandwich had become such a premium item and most popular in their menu. Sebastian and Raydel from Segafredo surprised David one evening and smiled at Raydel when he asked if he recognized him. Jonathan and his wife Luisa came to visit David. 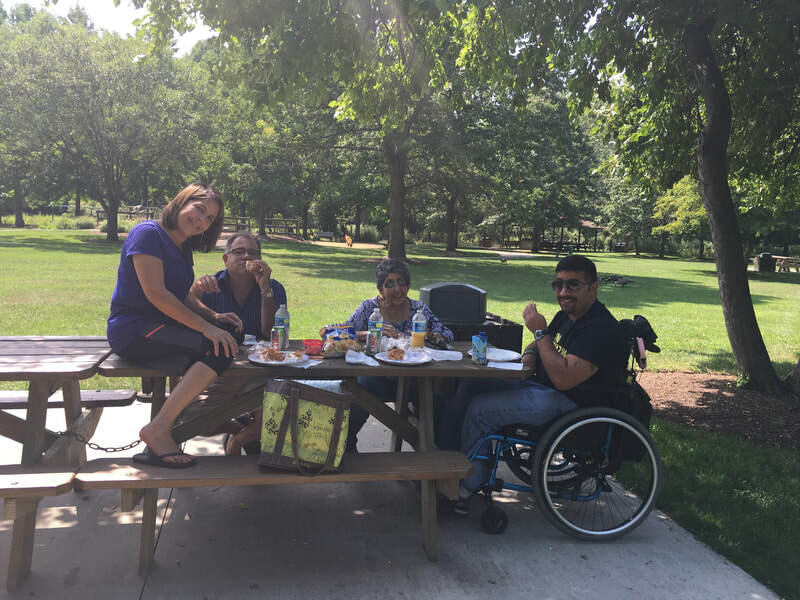 The regular lunches with Eddy and pedicure, shaving and manicure sessions with Ana were so therapeutic as well as the every 3 weeks visit from Gaby who would point out the progress and work with puzzles and games with David to encourage his cognizant improvement. 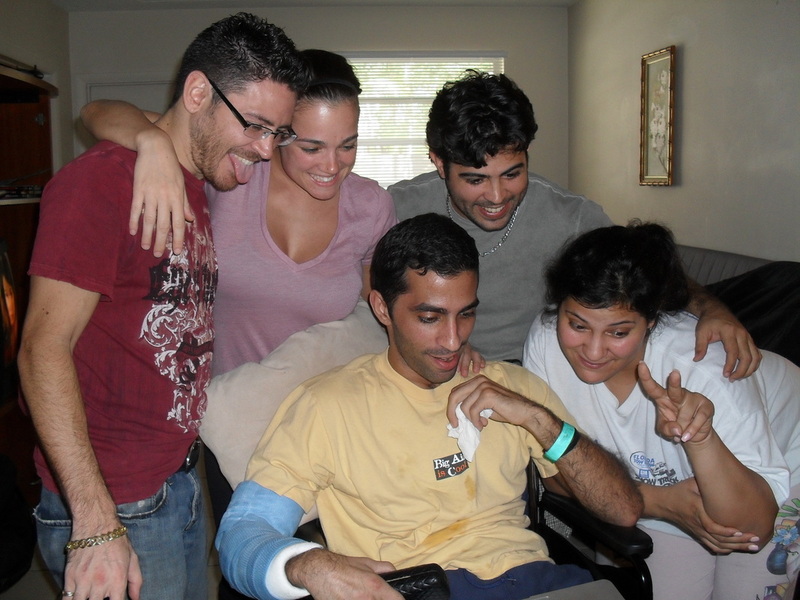 It was evident that all these visits had a great effect on David and were part of the healing process. My sister and brother in law, Noemy and Hector were traveling back to Miami and were preparing the traditional Thanksgiving lunch for family and friends. It was hard to accept we would be celebrating the holidays away from home. Ana Carolina was adamant about David having the traditional meal even if it had to be finely chopped. She decided to bake her first turkey, a sweet potato casserole and green beans just for him to have. The other option was Botox injections, which had been discovered to help patients with spasticity. Botox is a nerve impulse ‘‘blocker.’’ It is injected directly into the affected muscles. The fluid attaches to nerve endings and prevents the release of chemical transmitters, which carry the ‘‘message’’ from the brain that tells a muscle to contract. The neurologist persisted on the pump because the insurance would not approve the amount of Botox needed for an effective treatment plan. Both options were not 100% guaranteed. After researching and getting feedback from professionals and patients, as a family, we chose the Botox treatment. David would be scheduled to begin in mid December with the first injections. After much anticipation, the Avalon Park center representative never showed up for the scheduled appointment. My heart sank. I was so disappointed. Preparing for his visit had involved the staff and the family. The therapists coached David so he would demonstrate his ability to respond to commands. This opportunity promised a step closer to home. We waited for hours hoping he was just late. He didn’t even call. It took all my energy to stay focused on my mission. The thought that “loving others was a form of penance” personally resonated deep within me. Instead of allowing my frustration to turn into resentment, I prayed to rely on the constant whisper of trusting in the Lord and pray for every person I would come in contact with - including those who would fail on their promises. It was not easy… especially because it wasn’t about me. I had to surrender to love regardless of my disappointment. It was not easy… because our pride always gets in the way. The need of being right or first or taken seriously or being respected - is in our nature. It was not easy… to avoid the temptation of being able to justify the injustice or wrongdoing against us. It was not easy… to keep away from hardening my heart through the experience of resentment and bitterness. This was a journey of love, of trust, of patience, faith and endurance. I was not going to fight against what I had no control over and instead I offered up my disappointment with love. Tomorrow would bring something new. Bruce Lee’s tenacity and determination to get back on his feet, after a spinal cord injury, in his biographical movie “Dragon” – served as a great way to explain to David how to work his arms and legs. He would mimic Lee’s movements and would stretch his arms to the back of his head. I was so appreciative of great movies like Dragon with such a positive and powerful message. David would tolerate longer periods of time sitting upright on the bed, which meant he was working his core muscles. 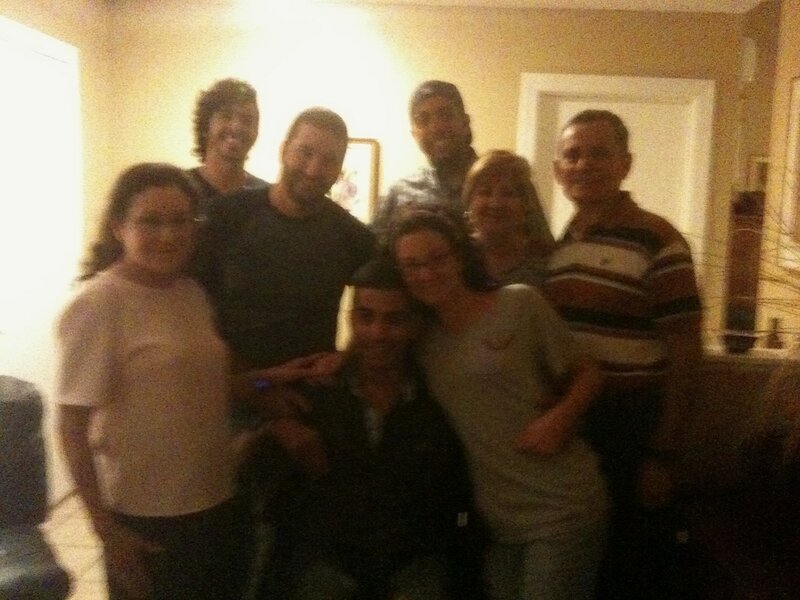 Sue and Hector Luis came to visit and David just laughed listening to their stories. 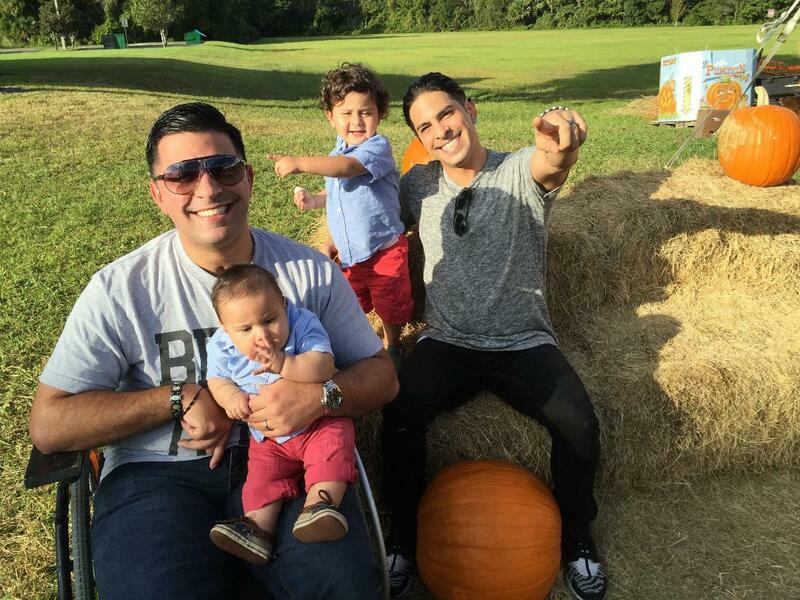 He also enjoyed the visit of Uncle Carlos, Catherine, Josh, Christina and her baby boy Crimson. David was starting to be more attentive with every visit and followed the conversations. Feeding David became a bit challenging. 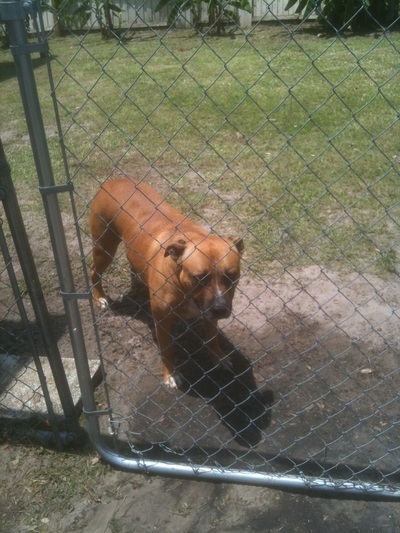 He would get agitated and stop eating or kept the food in his mouth. Every meal would be delivered and picked up at a scheduled time so I had to make sure he ate before they would pick up his plate. The dietician would always check the amount of food each patient had consumed. My concern was that if he lost weight, a feeding peg would have to be reinserted. The nurses and I came to the conclusion that David was no longer amused with puree food so, nurse Ms. Pam mentioned of ordering the next level type of food that would include chopped vegetables and rice. With so many rainy days in Miami - being able to spend some time at the patio or at the front yard of the nursing home was sporadic. My schedule was the same every day. It had now been 5 months away from home, away from my own bed, from cooking in my own kitchen and from spending time with Jorge. I longed to see our dogs Princess and B-boy and my cat Calle. I was in for the long run but, I also knew I could “burn out” easily so I continuously prayed for peace when I felt anxious, for joy when I would become sad, for strength when I would feel weak. I also knew God never gives us more than what we can bear. I specifically remember one morning, as I was about to leave my car to enter the nursing home, my stomach became a huge knot. I was experiencing high anxiety. I just wanted to sit in my car, not move and just cry. But, David was waiting for me. I had to move and had to get over this paralyzing sensation. I practically yelled for help from God and Our Lady. I expressed how there was no way I could go through the day feeling this way. I got out of the car, walked into the nursing home and attended to David. Then it dawned on me - when I got in my car around 10 pm - the anxiety had vanished during the entire day. God had come to my assistance. There was no doubt in my mind and in my heart that Mother Mary had been interceding for me. The anxiety had been real… but God’s Spirit had carried me all day long. I truly believe in the power of prayer. I don't know how else to tell others how much bigger God is. I daydreamed of transferring David to a facility in Orlando but kept reminding myself that the signs of moving would come to us at the right time. 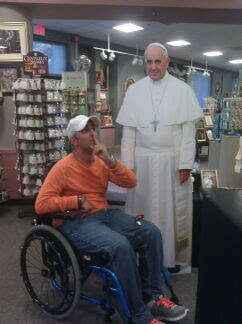 I also prayed for the gift of speech for him and trusted it would happen at the appropriate time as well. 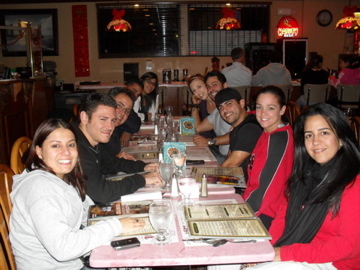 One October Sunday evening, as Jorge, Eddy, Karina and I finished dinner at Sergio’s; I shared my longing for home. We discussed some thoughts, possibilities and considered all the factors involved. Then Eddy looked at me and with an authoritative confidence told me that he promised I would be home within the next 90 days, which meant by mid January. I knew moving back home entailed much and many people. 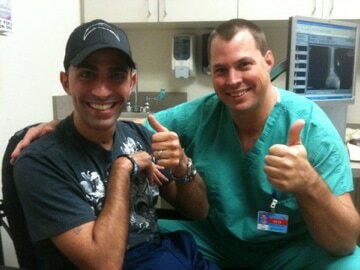 It required the right decisions to ensure David would not loose any medical services. Even though I had already declared that I would stay in Miami regardless of how long it took, contemplating bringing David home soon infused a new vigor in me. The next morning I told David about the tentative plan that Jorge and Eddy were working to send us back home within the next 90 days. I don’t recall if someone had said this or I had read it somewhere but all I kept thinking was that “where there is a vision, God has the provisions”. 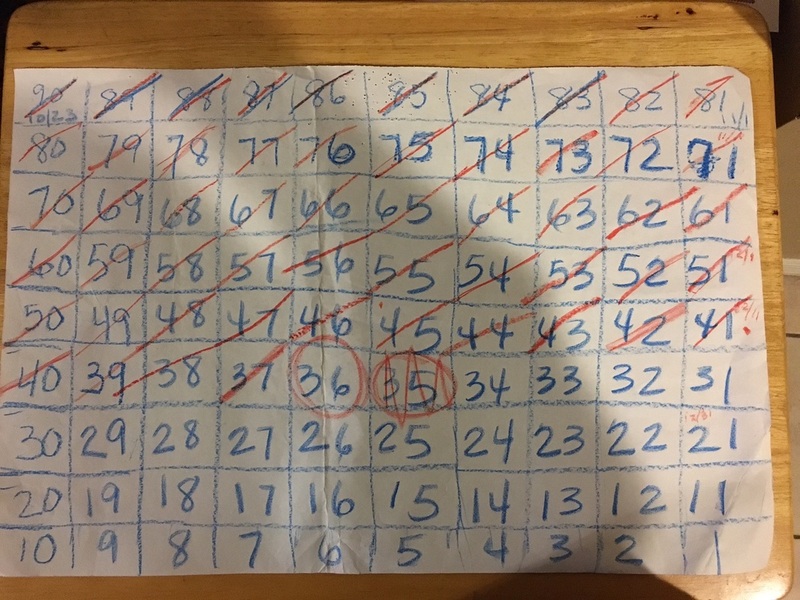 I wrote down on a poster board, the numbers 90 down to 1 and crossed out the 90. The next day we would cross out 89 and so forth. I told him to point at the number he thought we would be moving and he pointed on 35 and then pointed at 36. We would not share this with anyone at the nursing home until we knew this was what God had in mind. 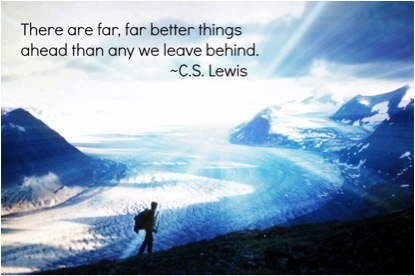 We would continue to walk in faith making sure we wouldn’t move further or faster than what God wanted. We constantly asked the Lord for a sign. 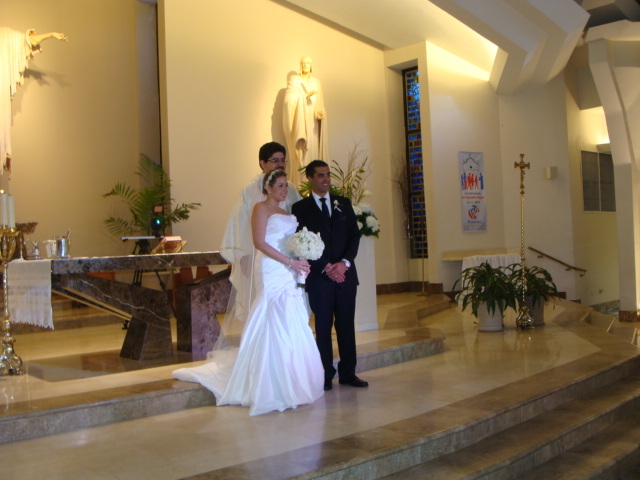 The following week, Jorge flew to his niece’s wedding in Puerto Rico. He was saddened to leave us behind but had the mission of taking lots of pictures to show us when he would be back. David would enjoy the events available at the home. Certain days of the week in the lunchroom, therapist Harold would pass out hand weights and dance Cumbias (a typical dance from South America), encouraging the home residents to exercise. On Sundays, a couple would visit and gather residents in a meeting room and prayed the rosary. There would be ice cream days at the patio with tropical music in the background. There were also movie days with popcorn. The staff would decorate the front lobby according to the festivity, which cheered up the home. Once the decorations for Halloween went up, it disheartened me to think we would spend the holidays at the nursing home. 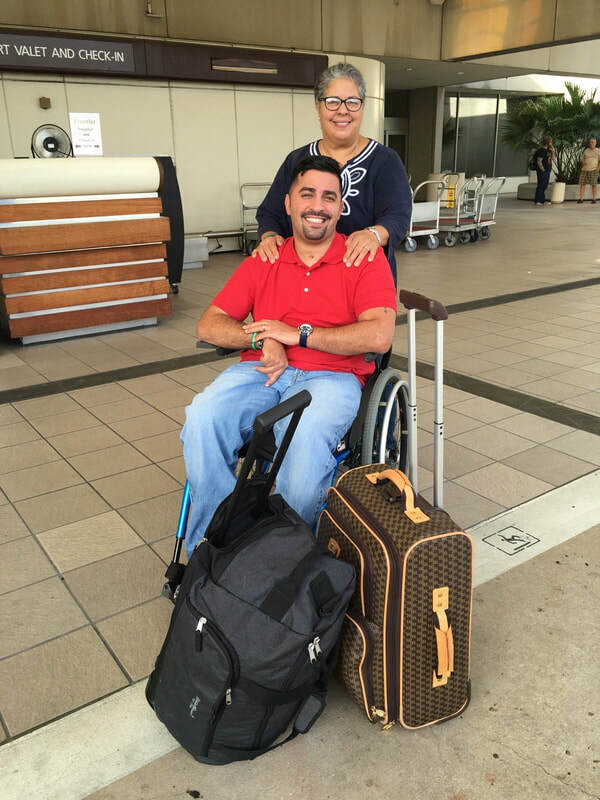 Jorge had visited and requested information on short and long term stay, in-patient and outpatient at several places in Orlando for David. I began making phone calls and finding out the criteria and admission requirements. A representative from one of the facilities that Jorge liked the most, would be in town the following week and mentioned he could pass by to evaluate David and asses if he would be a candidate for their program. 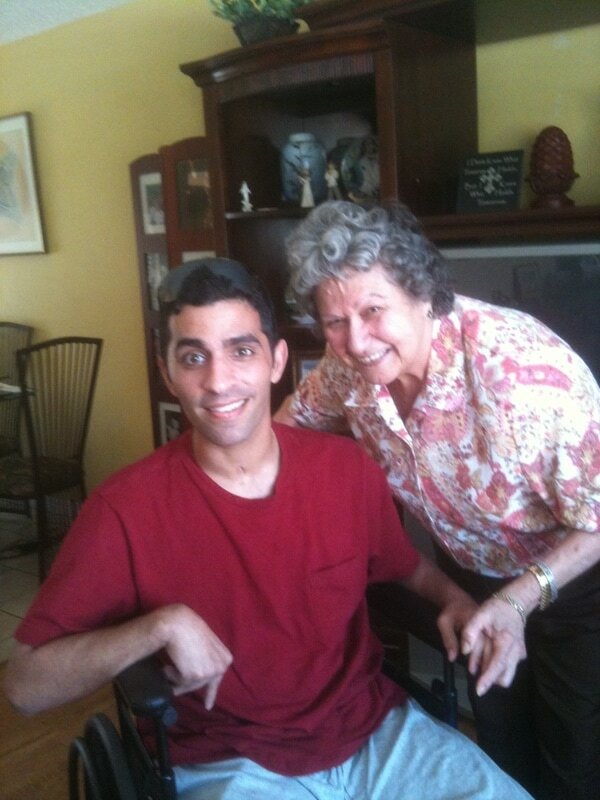 David’s social worker had to arrange any changes in services so I spent some time with her explaining our plan of exploring various places in Central Florida and asked for her support and help. David’s therapists continued to compliment his efforts and believed he was ready for a more aggressive rehab program. They promised they would be praying for us to find the place that would be the right fit for him. A staff member mentioned that taking David home was the right thing to do. All of a sudden it seemed as if everyone around us was on the same page and wanted us to know it was time to consider moving. I started making phone calls and researching for options. We didn't know when or where but it felt as if the Lord was leading the way back home. Dona Luisa, the 92 year old resident at the nursing home, came to visit us and gave David a Divine Mercy prayer card that I had given her a few days before. She was so happy she had something special to offer to him. It was wonderful to think that my gift to her would come back to us along with her joy of giving. We have learned and experienced the blessing in giving and also in receiving. She liked to call David – “bulls eyes” and would laugh about it. 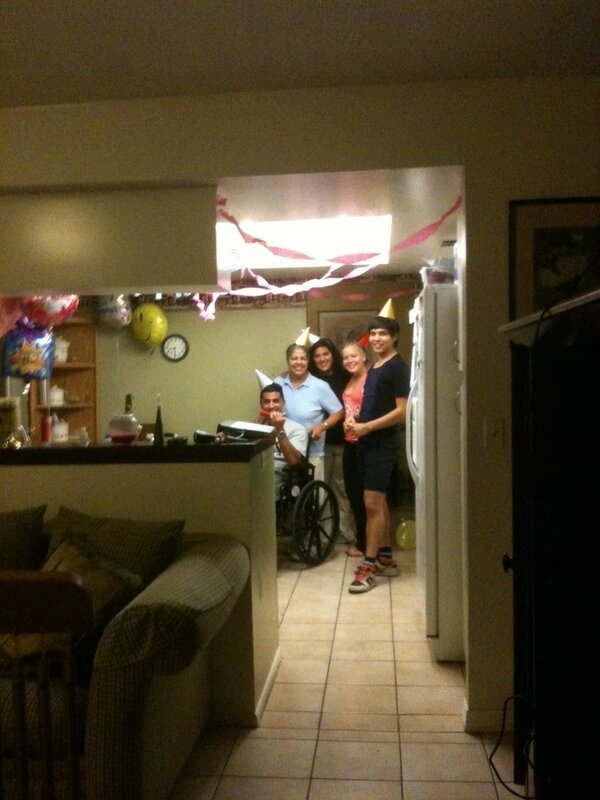 We thanked her and off she went pushing her wheelchair down the hallway. Dona Luisa had been a well renowned clothes designer and seamstress back in her country of Argentina. By her looks you could tell that she must have been a beautiful woman. She would dressed color coordinated and wore fantasy jewelry every day. Her Spanish was perfect with her Argentinean accent and carried herself with a distinguished flair. She had no family in the US and constantly talked about going back home. During this time, a few nurses had mentioned about a young man who had suffered a TBI and who had been in David’s room two years prior. His mother wanted to meet us to what I agreed. When she entered the room, I could read the anguish in her face and I held her as if I knew her. She started crying and repeatedly said that she would pray for David. I promised I would do the same for her son. Her son had only been a few months at the nursing home when she arranged to care for him at home. After two years, he continued being fed through a tube and remained with a trache. I was overwhelmed to imagine the uncertainty of dealing with the reality of a TBI without the help of a medical staff such as all those that surrounded David. 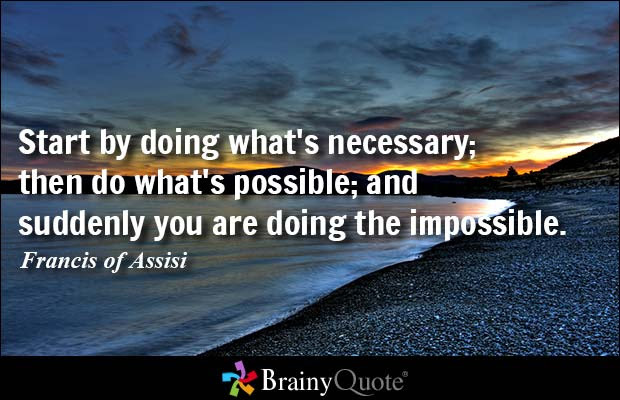 I prayed that fear would not take over any decisions regarding us leaving the nursing home - while I dealt with the deep longing of going back home and caring for David myself in our own corner with our own routines, etc. I kept reminding myself that my deep love for David could not interfere with God’s divine plans. I had to learn to discern and keep my ears, eyes and heart open to see His signs. Stacey, the ST diagnosed David having Apraxia of speech. Apraxia is not a problem with language comprehension, instead it refers to the difficulty with certain motor movements to initiate and perform speech regardless of the desire to speak and the mouth and tongue muscles physically able to form words. Another form of apraxia affects a person's ability to intentionally move arms and legs. We all missed David’s voice and wondered when he would speak again and which first word he would say. That same day a special friend told me not to fear because “there is no Apraxia for God”, to what invaded my heart with peace and hope. One afternoon, Jorge and I were talking to each other and as I laid my arms on David’s legs at the end of the bed, he made a movement that scared me to the point of jumping off the edge of the bed and this action made David laugh. We were in shock – David was laughing. Jorge and I started laughing about what had happened and at the same time, we laughed of joy hearing David’s laugh. It was as if he had awakened to a different level. Now that David was eating and gaining weight, the feeding milk was taken away. We waited for the hospital to give us an appointment to remove the abdominal peg feeding tube. He also was able to hold his head up straight so his wheelchair was changed to one with no head support. He was stepping up. To our surprise, Chris and Steven came to visit David. They had visited at the hospital and remained close to us with messages and prayers. 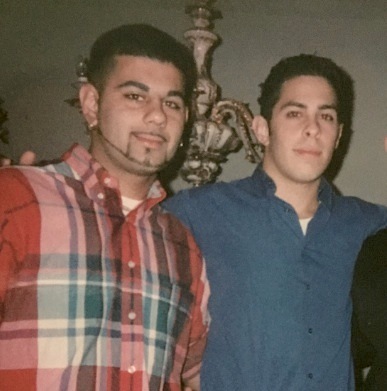 They had been friends of our sons for over 15 years. They went to middle and high school together. They had played sports together, worked and partied together and we knew their visit would be special. At one point Chris told David - “I don’t know her”, - to what David burst into laughter with intensity. By remembering the inside joke, he demonstrated his long-term memory was working. For the removal of the peg, David had to be fasting and his blood pressure had to be normal in order to proceed. We had everyone praying for the procedure. 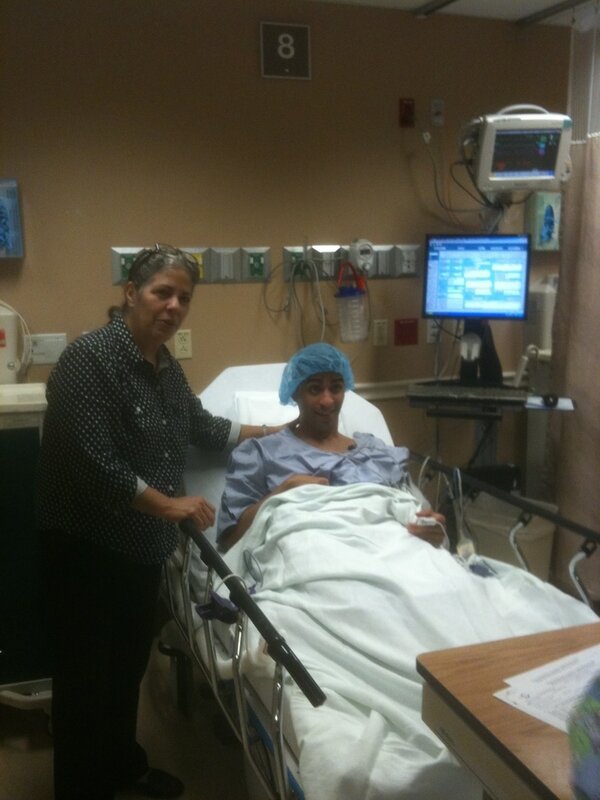 Jorge and I arrived real early and left to Jackson Memorial hoping all would go well. 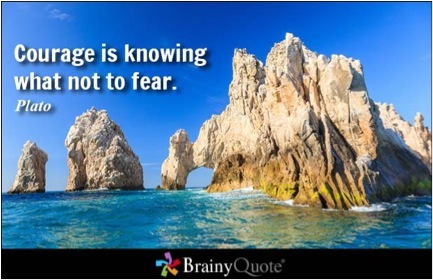 We kept reminding ourselves not to fear because we knew who was in charge. To our amazement, David stood still during the 3-hour wait and his blood pressure remained normal the whole time. Because he was so relaxed, they proceeded without sedation or IV and the removal was a success. We got to the nursing home in time for dinner and Ana Carolina brought David a special red velvet cupcake to celebrate the accomplishment. She always had these details that made every moment special. 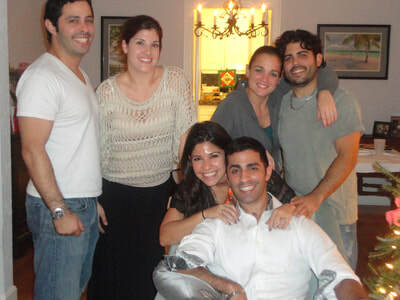 A few days later, Ana Carolina shared the song, “Please don’t go” and mentioned how much she missed talking with David and hanging out with him. She was constantly checking that I would be OK and kept planning for the day David would go visit their apartment. 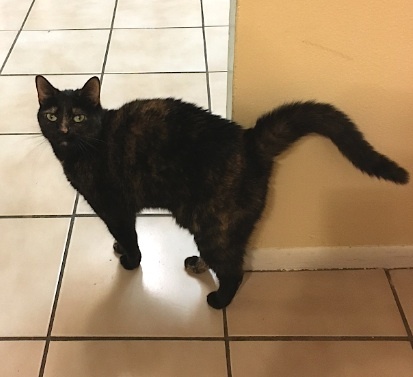 Whenever she could, she would arrange for me to stay in bed a few extra hours in the morning while she would attend to David or she would take care of him in the evening so I could go to the apartment, shower and lay in bed watching “Shrek, which became my favorite movie and must have watched it 100 times. They continued to do away with medications as David showed improvement. He would still get agitated once in a while but was becoming more aware as well. Jorge would continue to travel twice a week to see us. 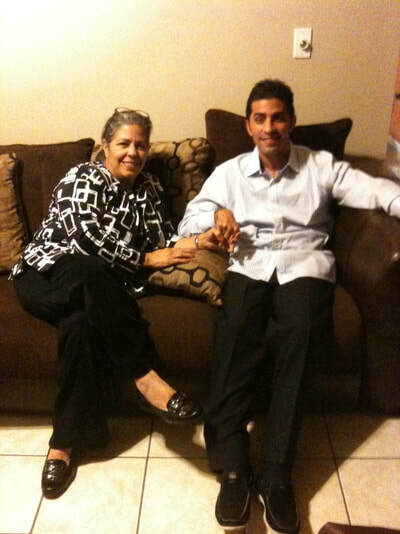 He was preparing to fly to Puerto Rico for the wedding celebration of his niece Cristina. My sister Gaby and mom were in Europe visiting France and Rome. 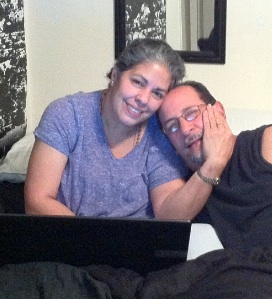 My sister Noemy and Hector were getting ready to visit us again. There had been so many accomplishments; I couldn’t wait for them to see how much David had improved. Hector and Noemy were on their way to be with us again. There are two kinds of fear. The type of fear, which gives us the necessary hold to ponder before making decisions and which reduces compulsiveness and promotes reverence – this is the type of fear we need to be encouraged. The other type of fear is the one, which paralyzes us from making changes to move forward and grow, that which pushes us to rush into situations or keeps us stagnant resulting many times in despair - this is the type of fear we need to overcome. God has promised to guide us and fill us with courage. Once we learn to trust in God, it is possible to overcome the fear to confront the challenges ahead of us. Our days now included the meal schedules. David was placed on a soft diet such as applesauce, yogurt, thickened water, gelatin, etc. He would gradually be introduced to puree and then solids. I fed him every meal and monitored that he would swallow every bite. One time, his right cheek got swollen and we figured it had been an allergy reaction to possibly pineapple and was relieved when it subsided. He was handling the food so well that was upgraded to puree in no time. The hardest task was convincing Eddy that David wasn’t ready for a “Malta” and chicken empanada or the ham croquettes which Ana Carolina would bring him from “la cafeteria – The Sandwich King”. The only outside food that got the approval was the “flan” that Jorge insisted he had to have when he was in town. We all hoped that David would continue to improve so that he could enjoy the traditional holiday thanksgiving dinner, which was approaching quickly. During this time, the Psychiatrist stopped 2 prescriptions including one that is prescribed for Parkinson, which could cause hallucinations. We were moving forward. Family and special friends visited and brought the joy, the stories and special treats. My sister Noemy and brother in law Hector would bring me delicious lunch and coffee and a tray of special treats for the nursing staff when they were visiting. 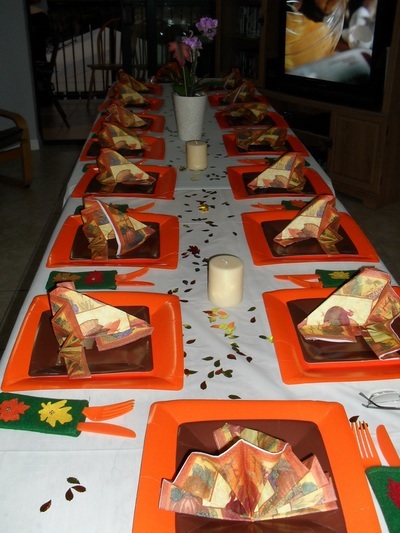 As it was their tradition, they would coordinate and gather all the children, aunts and cousins to have dinner together at favorite spots in the area. Other special family visits such as Uncle Mayito and Tia Tere, Uncle Ruben, Manny and Aunt Flor would witness the constant progress. 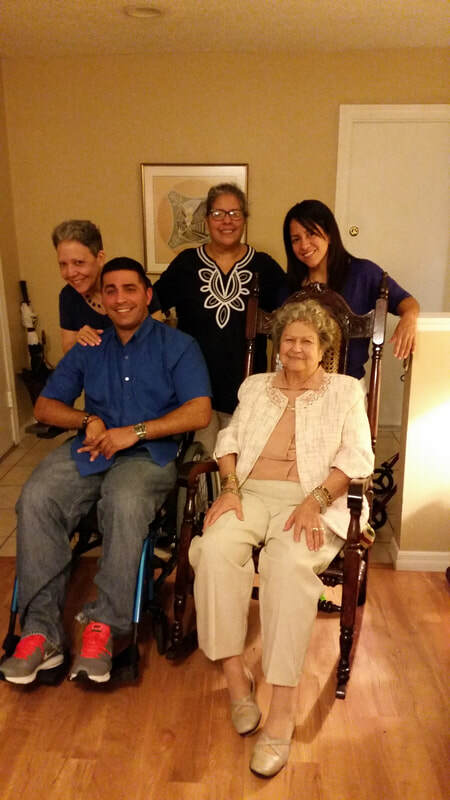 As we celebrated that my sister Gaby would be close to us as she settled in from Orlando to her new place, about 20 minutes away from Miami, it broke our hearts to say goodbye to CNA Norma who was leaving the nursing home. It was a roller-coaster of emotions. We felt so blessed surrounded by so many beautiful people who helped us in our journey. 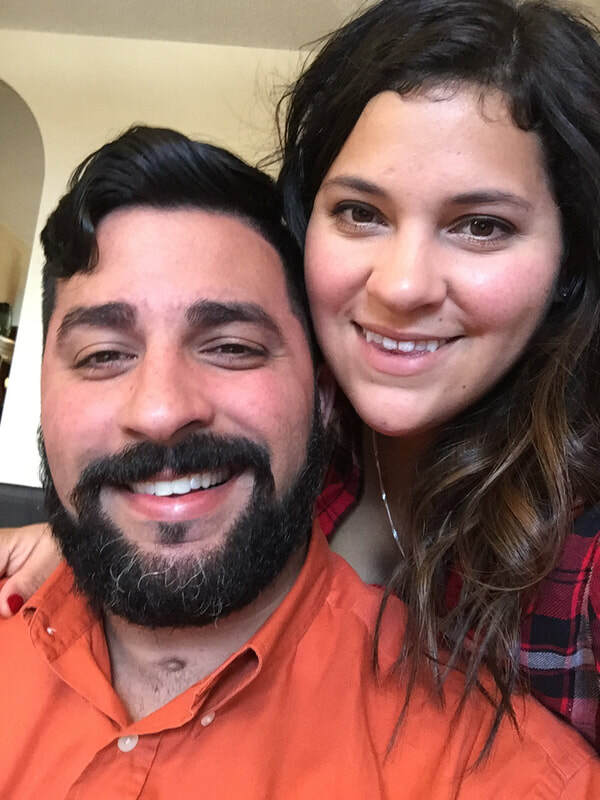 One afternoon, as I returned from a coffee brake to watch David in the physical therapy room, therapists Julissa and Harold mentioned that David had been fighting with them and explained that confusion and agitation was part of the recovery process from a severe TBI. Agitation after TBI is an excessive global psychomotor activity, inappropriate to the environment, and may be a manifestation of delirium but frequently exists independently of it. It occurs in up to 70% of TBI patients and it often stems from disorientation and over stimulation. 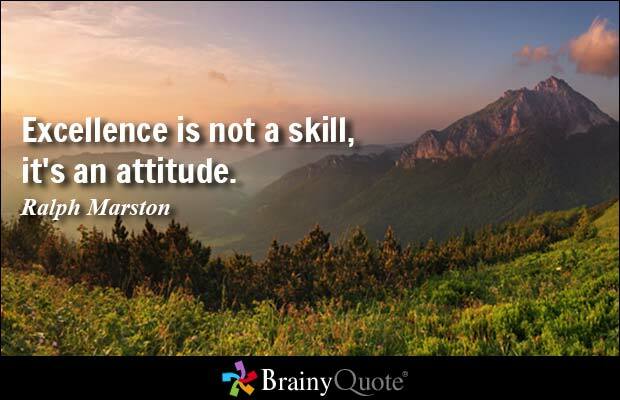 It can be very challenging to manage these agitation episodes. Because it may result in physical harm to the patient, it becomes very stressful for everyone involved. 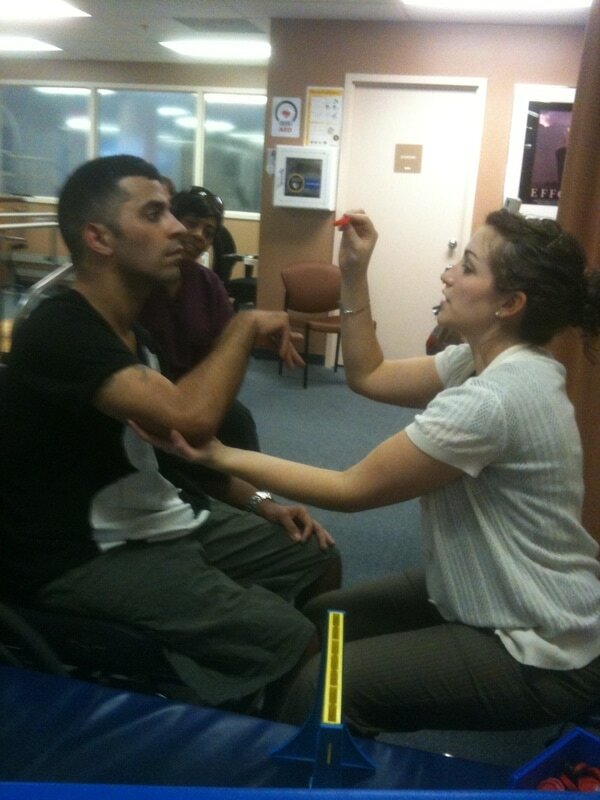 Before medicating an agitated TBI patient, efforts are made to eliminate over stimulation such as limiting visitors, limit lighting and in extreme cases - physically restraining the patient if necessary. After an episode, which can last a few minutes to a few hours, the TBI patient becomes exhausted. The next morning, as I was feeding breakfast to David, he started yelling. He was having an agitation episode. It became frightening and frustrating. He still had food in his mouth and I quickly removed it hoping he wouldn’t close his mouth and bite me or choke on it. He kept yelling and moving in his bed. I tried to hold him to offer comfort but all of his body was shaking and moving. It was hard to watch him battle this agitation episode on his own. I knew I had to wait it out with him. Ana Carolina came in a few minutes later and saw my agony. She insisted I leave him with her for the rest of the day so I could get some rest at her place. Nurse Rose came in and insisted on Ana’s proposal and I left. I prayed and cried all the way back to the apartment. There was no room for setbacks. I kept asking myself how long would the agitation phase last and what would be the ramifications? Masses were being offered. People who had not prayed in years were now doing so for David. We were not alone. For the next few weeks, I would just sit next to him and hold his hand - when it was possible - and waited for it to stop. It reminded me of the storming episodes back at the hospital. They finally became less frequent and then one day it ended. A few nights later, as I prayed for God's will to be done, an overpowering emotion of us moving back home soon - got a hold of me. I knew God was in charge and because he makes every - and any plan perfect, I would wait for the signs and not become anxious. David started moving the right leg more often. The removal of the feeding tube was being considered as he continued to tolerate the food and kept gaining weight. Now that David was eating, I learned he was able to travel out of the nursing home to the mall, a park or anywhere we wanted with a special permission. I arranged a visit to the transportation office to get the paperwork and David’s ID in order to do so. I was thrilled just imagining how he would react. Our first trip would be to Eddy and Ana’s apartment and then probably to church. He would like that. The physical therapy sessions became very productive. David could follow all the commands, such as moving his trunk forward and backwards as they requested. Stacy, the speech therapist took David on a date to the vending machine so that he would count the amount of money he needed to buy a chocolate chip cupcake and an orange soda as part of his cognitive therapy and food texture upgrade. He enjoyed every minute of it. One afternoon, as we waited outside on the sidewalk for the transportation van to pick us up, after a visit to David’s primary physician’s office, a young man named Raul passed in front of us on his bicycle. All of a sudden he turned around and proceeded to tell us that the Holy Spirit had asked him to turn around and pray for David. The prayer was so powerful that it had to have been guided by the Holy Spirit. He then mentioned that David would walk and talk and left. Not even 2 minutes later a gentleman passed us by and as he blessed David he said that David would be OK. The Lord was speaking to us. We were not alone. John came to watch B-Boy videos with David. Hector Luis and John came to see David and watched B-boy videos with him. Before leaving, Hector Luis placed his watch on David’s arm. David loved watches so we knew this was a positive stimuli. He kept staring at the watch until he fell asleep that night. The following evening I went to a healing prayer at church. It was powerful. The message was about the Lord’s promise to take care of our children and that He is always with us. We all have days full of sorrows and distress. We can choose to allow these moments to twist us into darkness and burden others around us or choose to allow God to give us the fortitude to serve others so that His Love can dwell in us. All we have to do is ask. He will never forsake us. My son, David Arroyo and I, Ana Curras, collaborate together. This is our story. Our story because we are connected. We all are. When you hurt, I hurt, when you succeed, I succeed, when you have joy, I do too. It's in our design as human beings. Our story is intended to give hope, joy, encouragement and light. We pray to be inspired by our Creator, guided by Jesus Christ, moved by the Holy Spirit and accompanied by our Mother Mary. 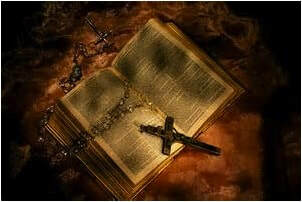 ﻿﻿﻿NOTE: Bible verses referred to in each post are linked to open to the verses for your convenience.